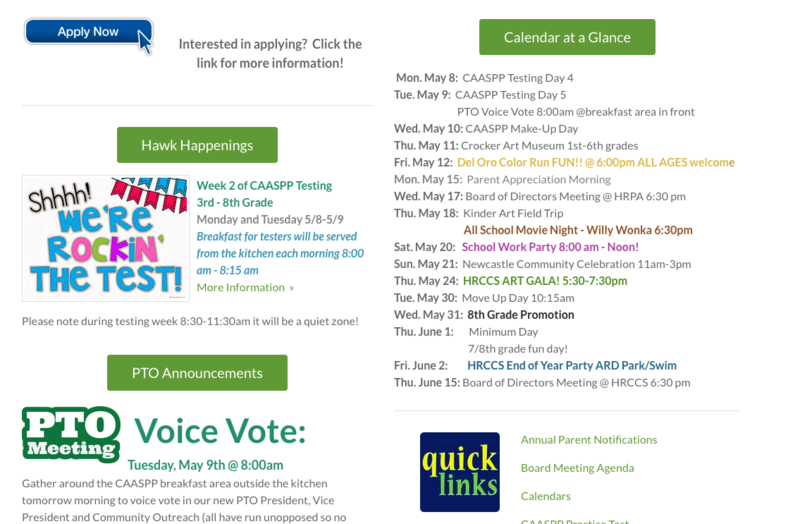 Our home page is updated weekly on Fridays. Below are screenshots of past weekly updates. Browse by week to find what you need. Our Red Ribbon Tulips have bloomed...these are reminders of the healthy promises we made in October. What a beautiful evening we shared together at the Flower Farm Inn in the Emerald Garden. The PTO fundraiser was a blast with Riley Armstrong singing and entertaining us, along with Irish themed decor, food and beverage. Thank you for joining us and for helping us reach our goal to fund the student Field Trips for next school year. A special thank you to the PTO and to Keri Conn and Season Eckhardt for their behind the scenes preparations and hard work! If you are interested in this committee, please email me HERE. FINAL DRUMLINE PERFORMANCE will be Thursday, March 30th at the Talent Show, arrive 30 minutes early to set up. Every Tuesday after school 2:30 - 3:30pm 3rd-8th grades. Performers arrive at 6:00 pm to prepare. 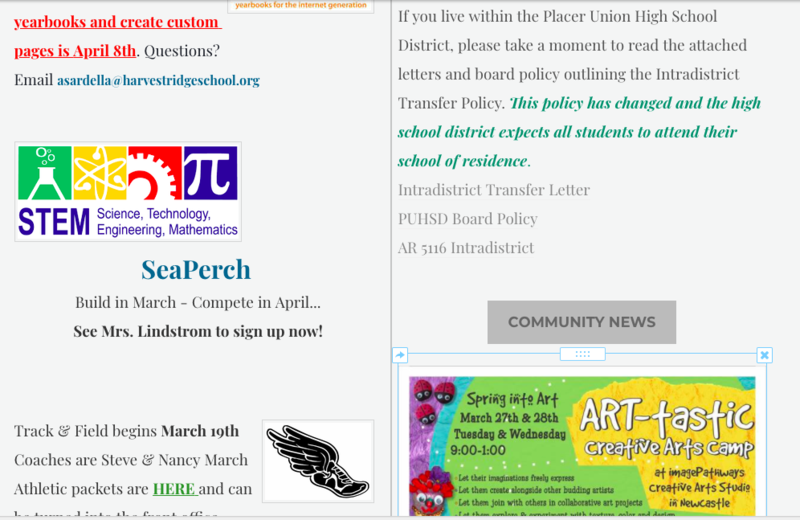 March 29th from 2:30 - 5:00 pm will be our SeaPerch competition at the Del Oro pool. We are in need of a parent volunteers(s) to coach this team. This athletic team is for 5th - 8th graders and will compete in the Loomis Basin Athletic League. Click HERE to see the schedule of meet dates and times. 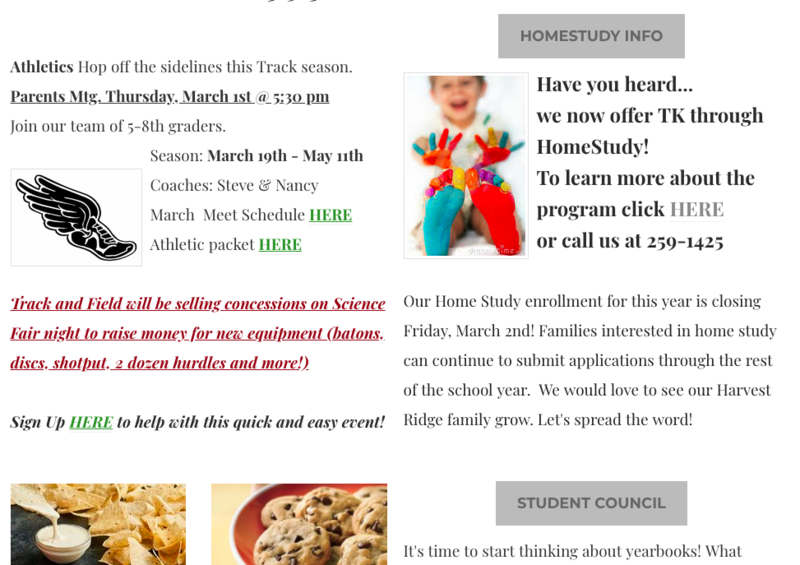 The season will run March 27 - May 17 (there are 6 meets). Sign-Up to be put on the list to receive more information. After a long, wet, indoor activity kind of winter, Spring is here! And with it brings warmer weather that feels even hotter while out at PE. Please make sure your child has a labeled water bottle and appropriate shoes every Wednesday and Thursday for PE class. I do have lockers if they want to store tennis shoes in the shed. Also, state fitness testing is upon us and students in grades 5-8 will be jogging a mile most days for endurance training. Please remember (in all grades) that if they are unable to participate on any day they need to bring a note from a doctor or parent stating so, otherwise all students are expected to take part. I am so excited for the sunshine and outdoor time with your children! I also encourage them to get physically active for at least 30 minutes most days. It’s good for us all! Track It Forward allows you to easily log your hours and check at any time how many hours you have logged. 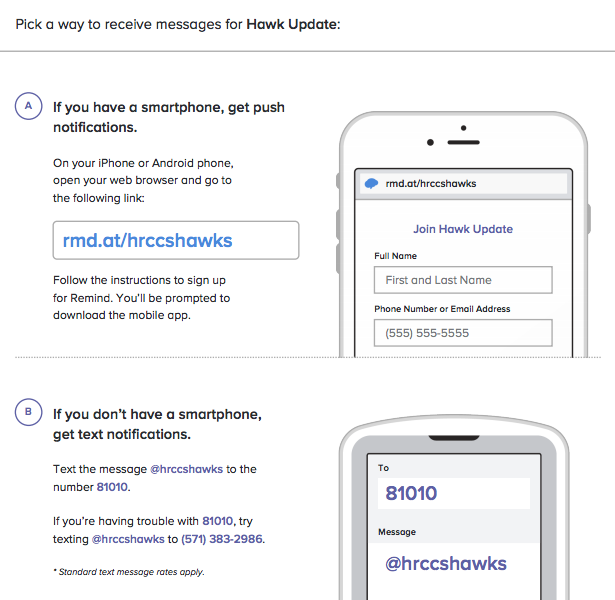 Remind101 App...it makes your life easier! 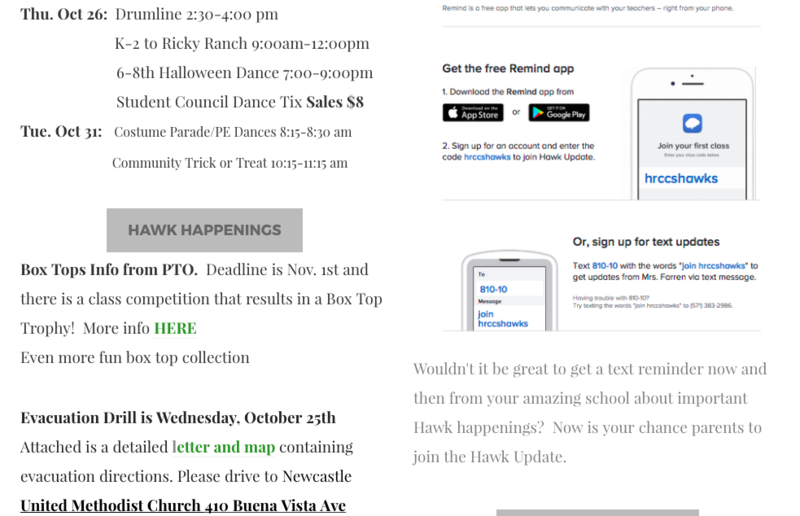 ​Wouldn't it be great to get a text reminder now and then from your amazing school about important Hawk happenings? 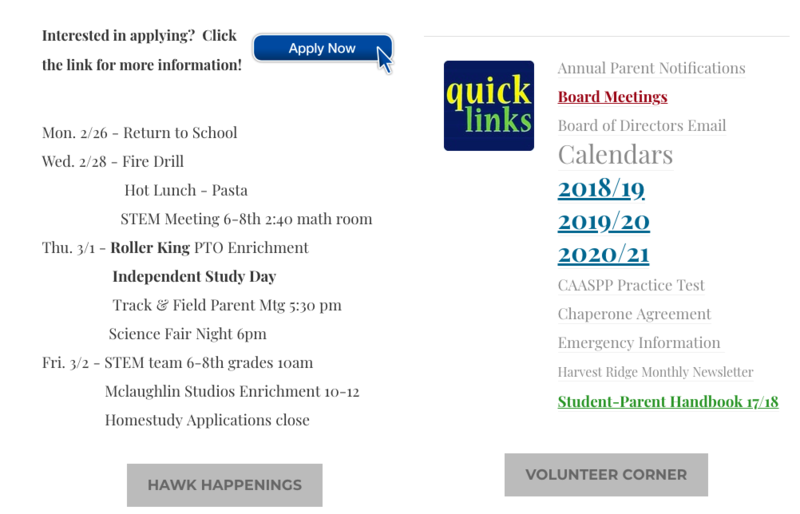 Now is your chance parents to join the Hawk Update. It's that time of year again when schools begin the state testing. Our students in grades 3-8 will be taking the Smarter Balanced assessments in English/Language Arts and Mathematics. These tests are administered on the computer and often can be challenging. Our testing window is from May 1 through May 10. We will be sending more information about the testing schedule in the next several weeks. In the meantime, I encourage you to have you and your student(s) take the practice tests. You can access these tests HERE. We have been excited to implement our new math program, Eureka Math, this year. It is one of the best aligned and more rigorous programs for students. It is really pushing our growth mindset, but we are seeing some very positive outcomes. We can't wait to analyze the data at the end of the year. With this shift in rigor, we also realize that this makes it more difficult for parents to support their students at home. 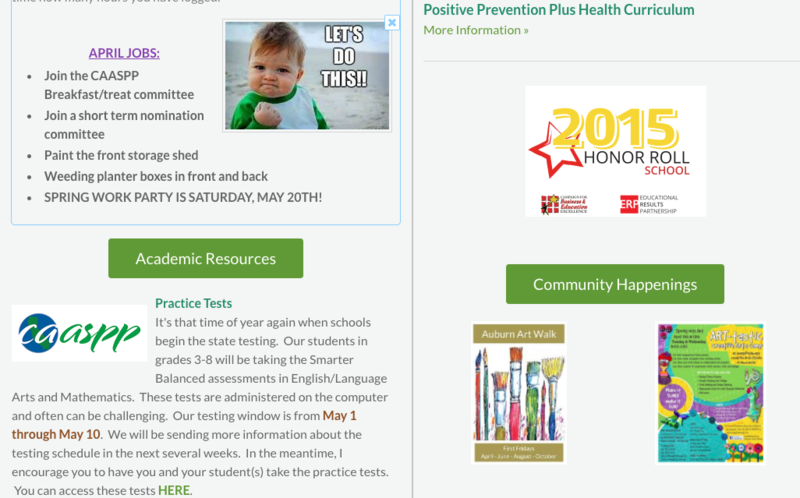 We have found a wonderful resource that allows you to choose your student's grade level, the module they are working on, and the lesson number. 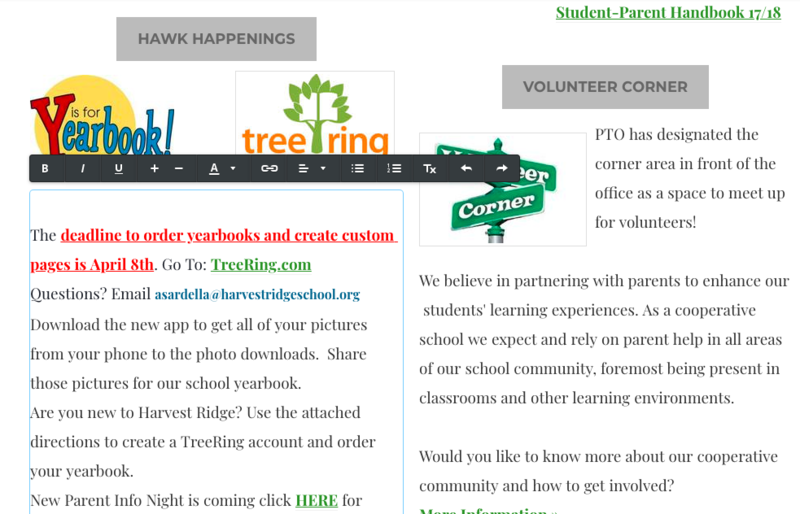 Then, you can look at sample homework, video taped lessons, and other resources. 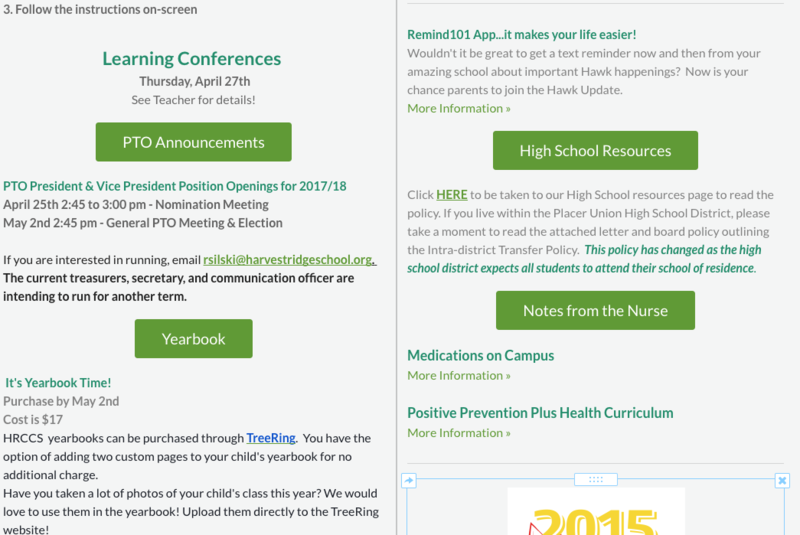 This resource comes from Oakdale Joint Unified School District. Click HERE to utilize this awesome site! 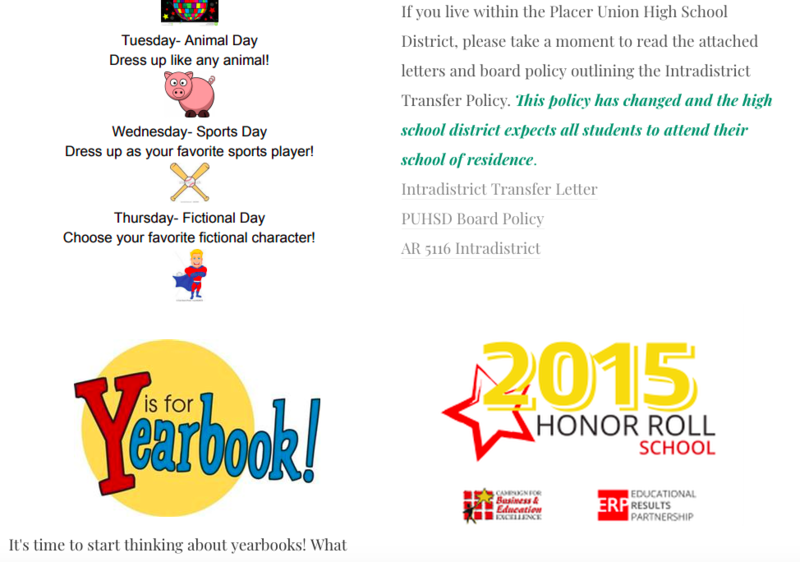 Click HERE to be taken to our High School resources page to read the policy. 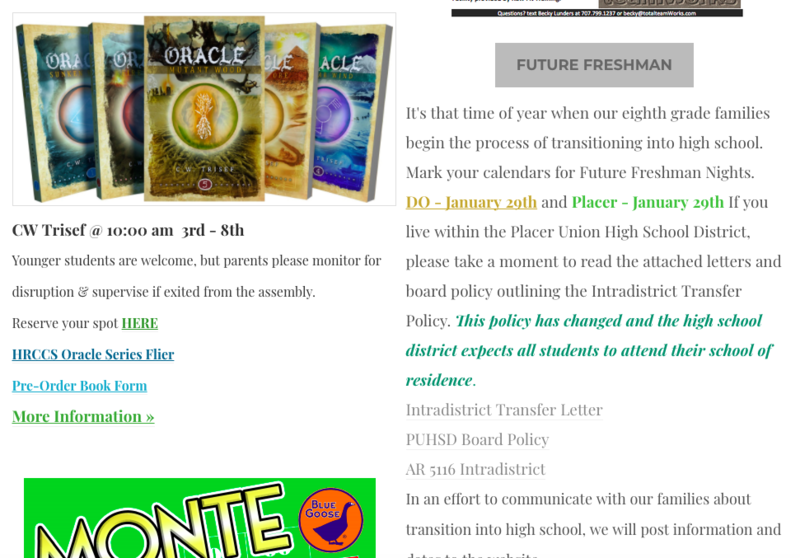 If you live within the Placer Union High School District, please take a moment to read the attached letter and board policy outlining the Intra-district Transfer Policy. 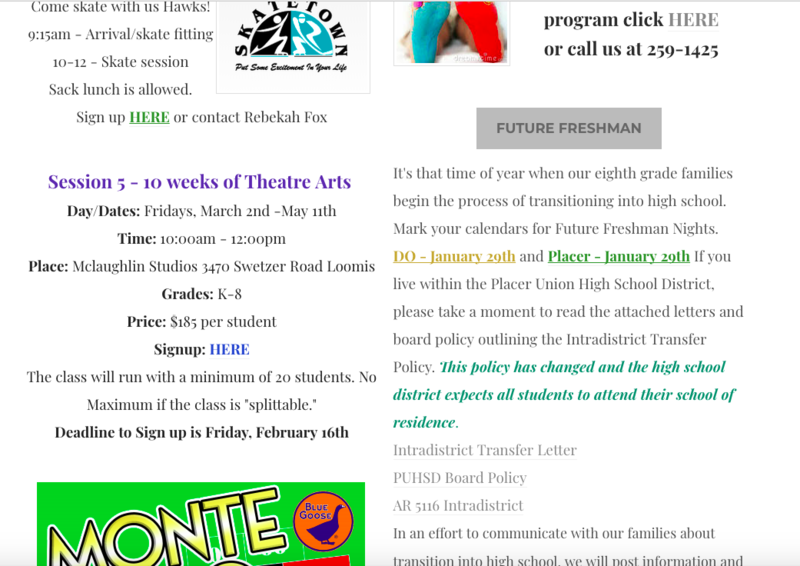 This policy has changed as the high school district expects all students to attend their school of residence. A big HAWK thank you to the Elison Family and helpers, Mrs. McIntosh, Mrs. Mendoza, Mrs. Nordby, Mrs. Porter, Mrs. Pursly, Mrs. Ross, and Mrs. Soderman . We loved the books and the fun prizes! 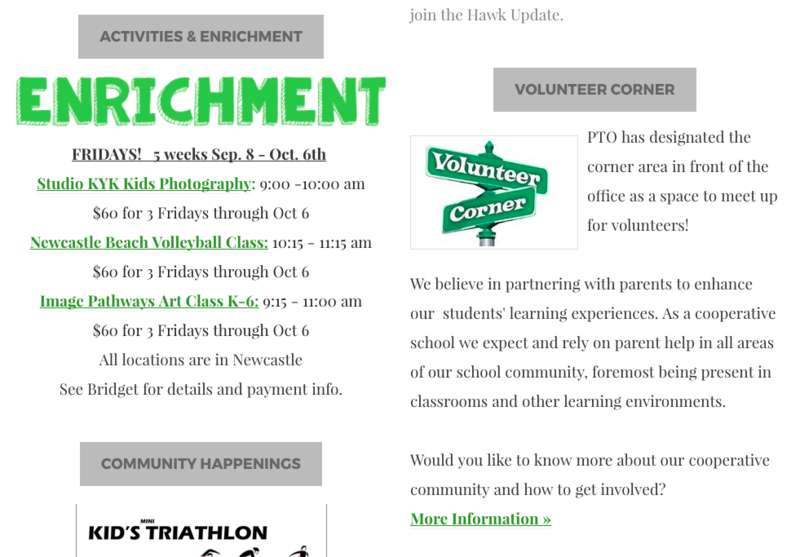 Enrichments are all on this week at the regularly scheduled times! 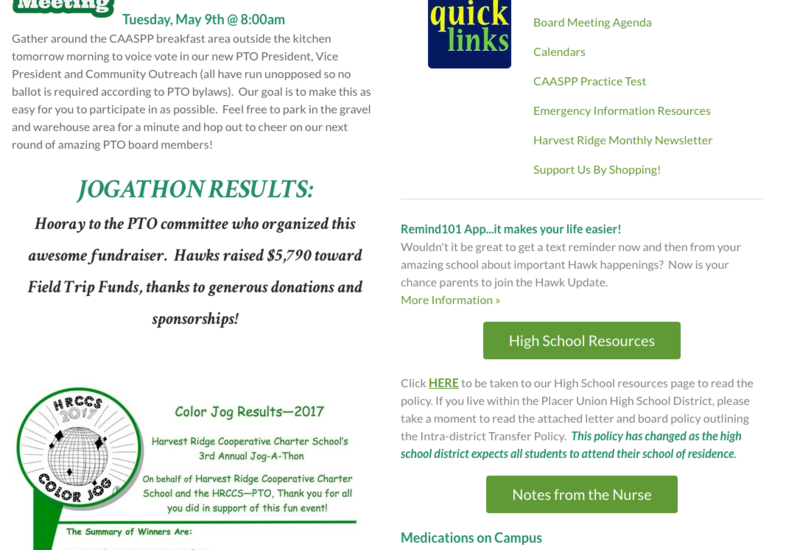 Each year we review our school-wide goals with stakeholders in a variety of ways (PTO meetings, Governance Council meetings, Coffee Talks, Town Hall Meetings, and Parent Surveys). Your input is vital to our continuous growth. Please take a minute to click on the link below to give us your feedback. 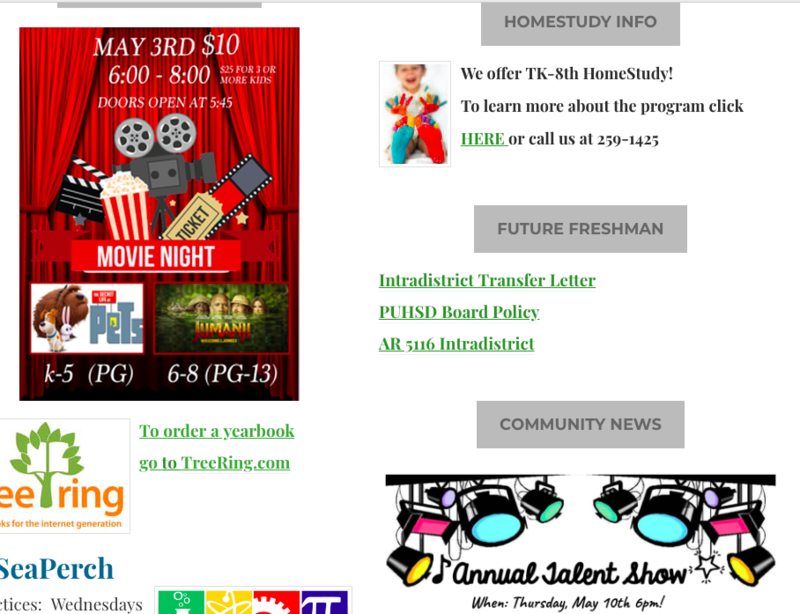 The slideshow presented at the Town Hall meeting is posted here under the more info link. This is our biggest fundraiser of the year! Proceeds will directly support HRCCS Field Trips. Get your tickets online this week! We are so excited about the many ideas families have shared for homemade gift baskets and donations from businesses that have a connection to family. 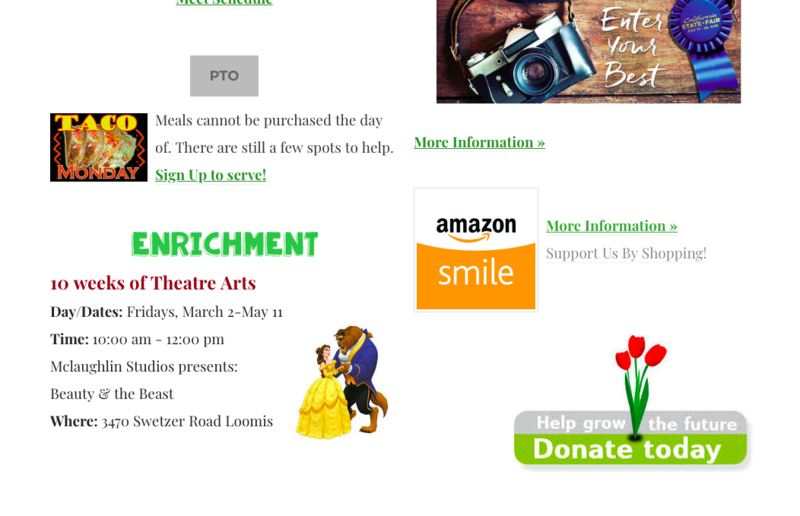 Click HERE to see a list of donation suggestions. Tickets to Six Flags will be delivered to those readers who completed their 6hr goal and turned in their reading log. What a great day we had with our students reading in honor of Dr. Seuss' birthday and the NEA's National Day of Reading on March 2nd. Students were captured on video and audio recordings and the hyperdoc with those videos has been shared with parents via email. 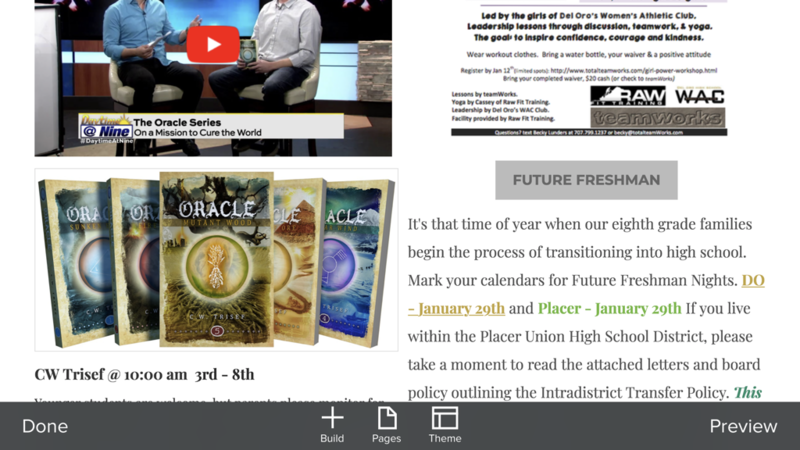 Enjoy the reading fun! Drumline is open to 3rd-8th grade as a FREE after school enrichment. This FREE running club is for 3-8th graders. We will be working toward a group goal of completing a 5k. K-2nd graders are welcome to join if a parent/guardian is with them. This is offered to grades 6-8th and is a FREE after school enrichment. Track and Field Coming Soon! This athletic team is for 5th - 8th graders and will compete in the Loomis Basin Athletic League. Sign-Up to be put on the list to receive more information. We are in need of a parent volunteers(s) to coach this team. Thu. 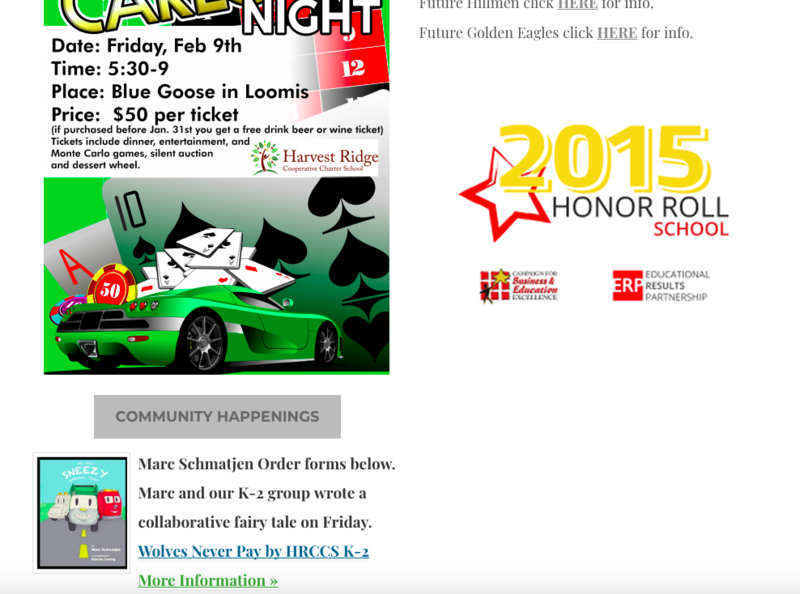 Mar 30: DO WINGS visit to NES & Talent Show! 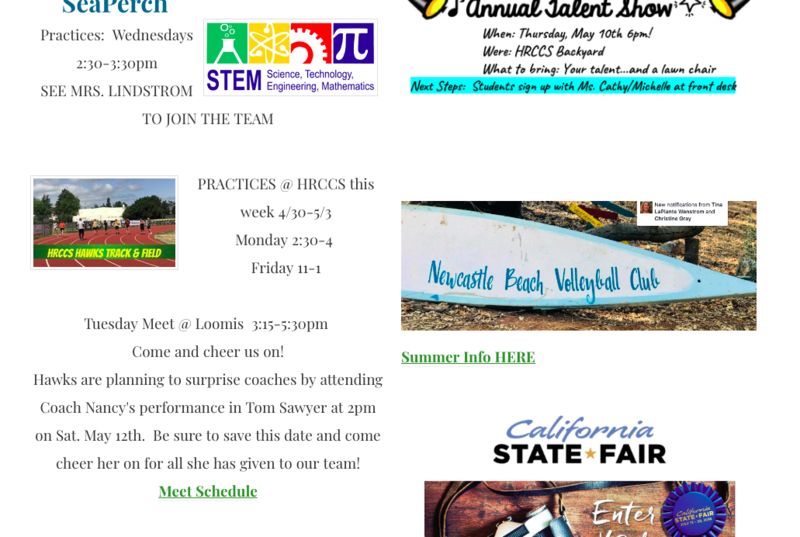 ​Students from HRCCS are invited to participate in Sacramento State's Academic Talent Search (ATS) Program! 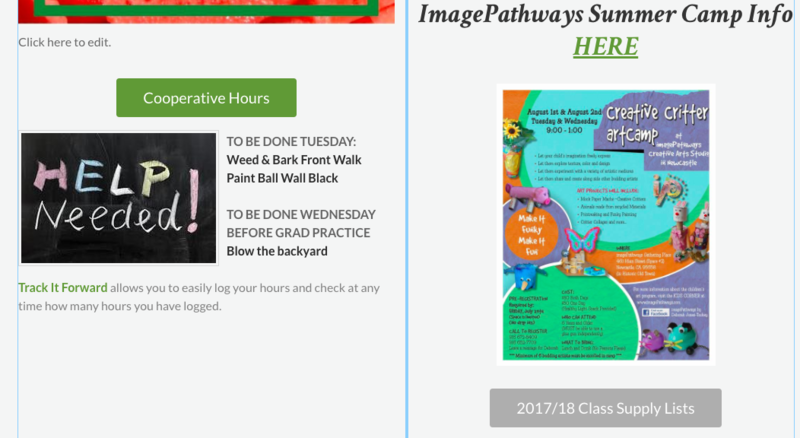 ATS provides 4th-9th graders (grade level as of Jan 1 2017) with over 100 fun interactive and unique summer courses in a collegiate environment. Courses cover traditional subjects as well as new and creative topics not always available in regular school. ATS is a self-supporting, non-profit program that receives no University, state or federal funding. ATS summer courses are specifically designed for two age groups. Grades 4/5 and Grades 6-9th. Current 4/5th graders can explore hands on classes designed to encourage critical thinking, problem solving and analytical skills while engaging with other students who share their enthusiasm for learning. 6-9th graders can accelerate their learning in a University Environment. They will have access to University facilities like the library, student union and campus eateries. To join in on this fun and educational opportunity, students simply take a short exam that automatically qualifies them for the program and no test preparation is required since it is not a pass or fail exam. You MUST take the test to qualify for ATS, but you don't have to apply if you change your mind. HRCCS will be offering the ATS exam on March 8th at 3pm. For more information about signing up and taking the test, contact Bridget Farren at 916-259-1425. See below for more information about ATS. Trimester 2 Minimum Day Conferences are here! This is our final parent teacher conference for the year. End of year grades are given, but conferences are not scheduled at the close of Trimester 3. We look forward to seeing each of you this week to discuss your student/s progress toward academic goals during Trimester 2. Our book fair will be open during conference week so be sure to swing by and scoop up a good book or two. The book fair will be in Mr. Serrano's Room #6. 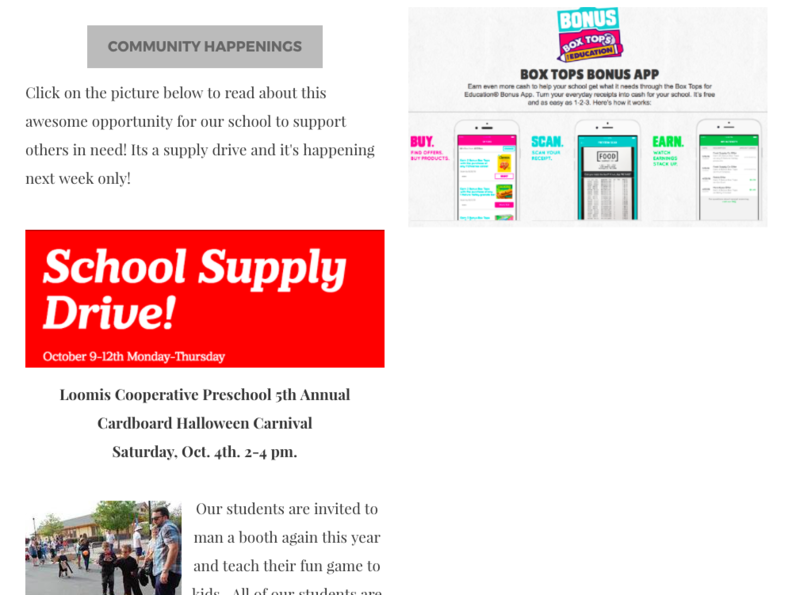 A letter to parents can be found HERE about the Scholastic Book Fair and you can click below for our Book Fair online link. 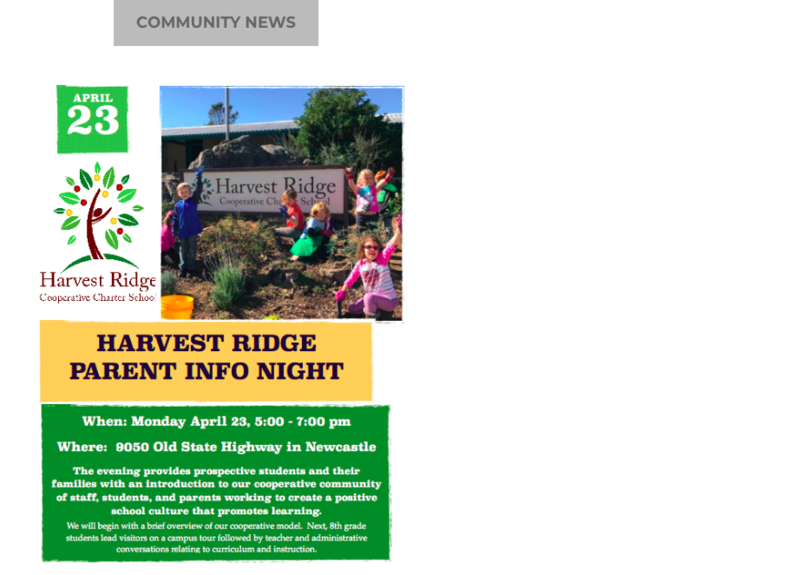 On Thursday night following science presentations, we held a meeting designed for parents to hear an update on our Harvest Ridge Charter School and to gather your feedback as we begin to plan for a new school year. Each year we review our school-wide goals with stakeholders in a variety of ways (PTO meetings, Governance Council meetings, Coffee Talks, Town Hall Meetings and Parent Surveys). Your input is vital to our continuous growth. We would be happy to schedule another Town Hall Meeting opportunity soon. Please email Bridget if you are interested in attending. Please take a minute to click on the link below to give us your feedback. 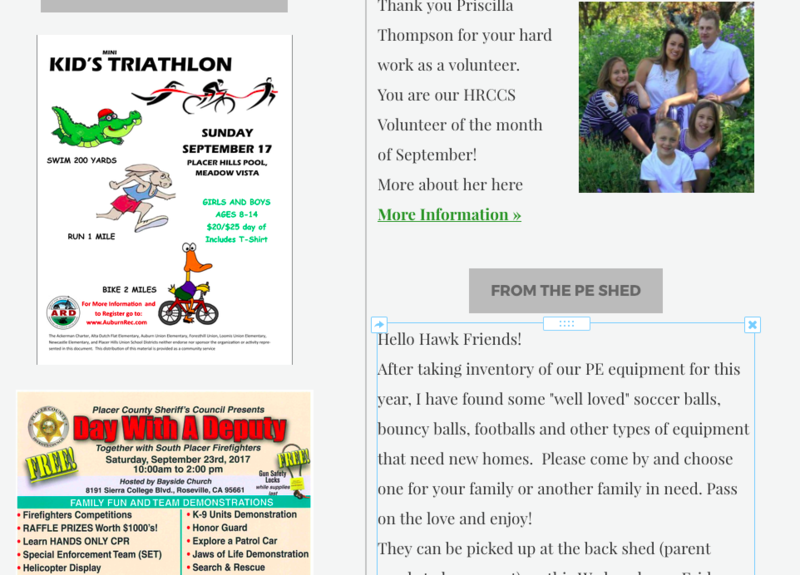 The slideshow presented Thursday by Janet and Bridget is posted here under the more info link. 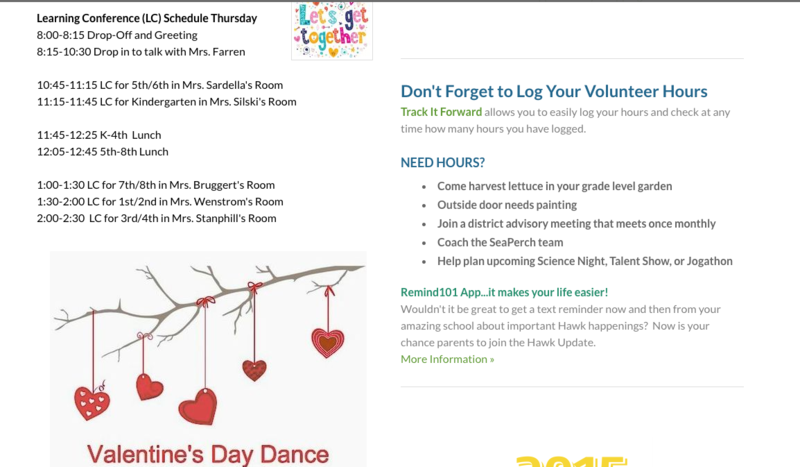 Reading logs were due Feb. 9th but it's not too late to fill out a log and turn it in. Monday is the final day for students to turn in their logs. 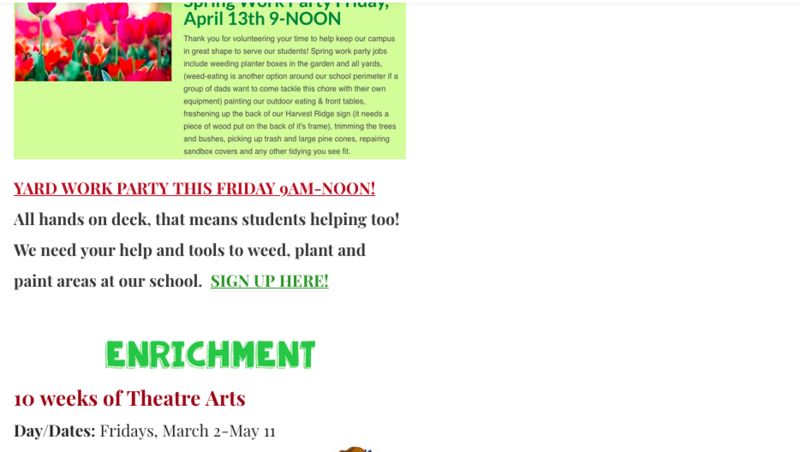 ​Friday Enrichment Session 5 begins this week! Friday, March 3rd 9-12 @ Roseville Theatre Arts Academy - CLICK ON THE MORE INFO LINK BELOW TO GO TO SIGNUP PAGE. We have 25, but they will allow more students to join this week. This athletic team is for 5th - 8th graders and will compete in the Loomis Basin Athletic League. Sign-Up to be put on the list to receive more information. Riley is a professional performer and we are excited to have him entertain us with his humor and musical talents. He will be the highlight of the evening and we will be lucky to have him. Ticket prices go up March 1st! Head to the website to purchase tickets. This is our biggest fundraiser of the year! Proceeds will directly support HRCCS Field Trips. Are you wondering how you can help make our Spring Fundraiser a success? We are so excited about the many ideas families have shared for homemade gift baskets and donations from businesses that have a connection to family. Click HERE to see a list of donation suggestions. Hot Lunch on Wednesdays - Trimester 3 menu is HERE! Our fabulous moms Priscilla Thompson and Dree Gallegos have offered to continue as Hot Lunch Coordinators to the end of the year. Instead of signing up to volunteer via SignUp Genius they have asked each class to take on hosting one hot lunch. 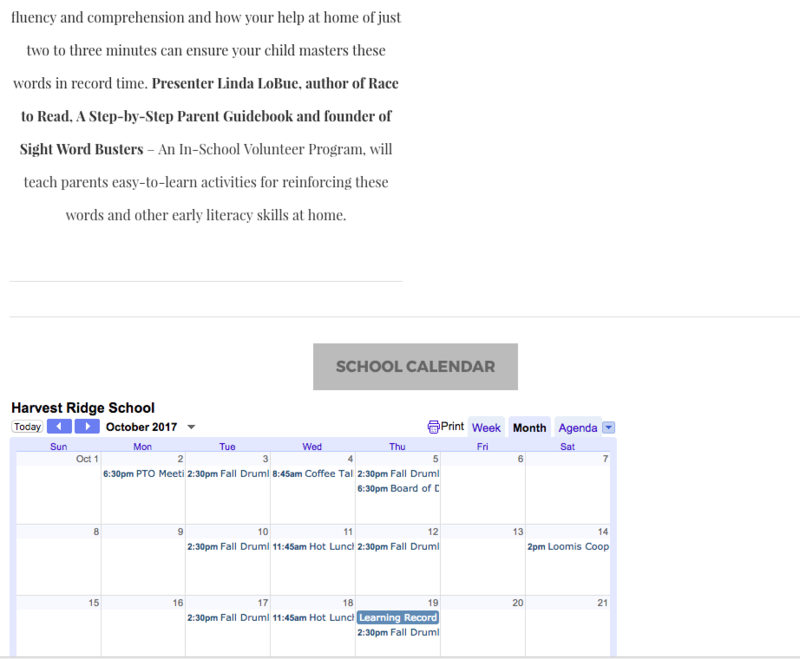 Your room mom will be looking for volunteers when it is your class' week to prepare the meal. 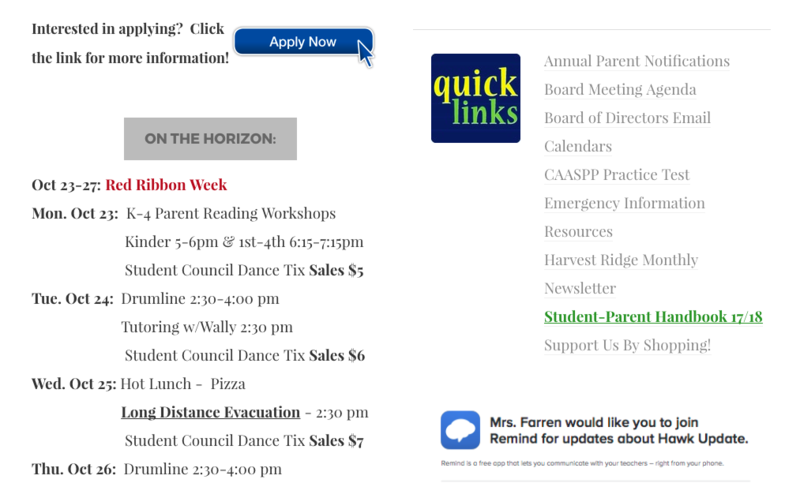 Access the Hot Lunch Menu & Form in the office or HERE . Thank you Hawk families for supporting the taco student council fundraiser on Thursday. We raised $200 thanks to your generous appetites. We apologize for the long line and for running out of food. We thought food for 400 would be plenty. We will continue this dinner option on more of our community events at the school and we will work to make this more convenient and quick for hungry families. We are raising money to purchase a mascot and a marquees this year for our school! No School on Monday in recognition of Martin Luther King Day! Parents are welcome to attend. Class details below. 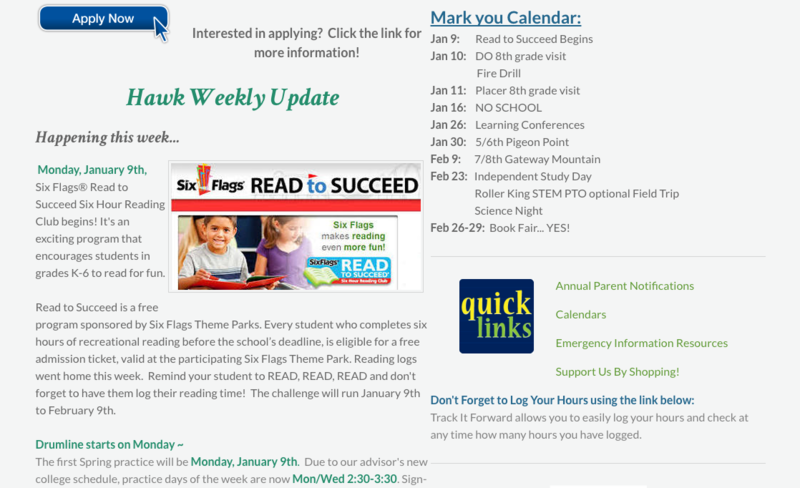 Remind your K-6 grader to READ, READ, READ and don't forget to have them log their reading time! If your student is attending, please be sure to fill out the sign up form below. Drumline is open to all 3rd - 8th grade students as an after school enrichment. This FREE after school enrichment club is for 3-8th graders. Coach Ted Popson and Coach Nancy Hinton are very excited to begin this week, If it is raining we will meet in a classroom to set our goals and plan. If you have a child grade K-2nd who would like to join us please call Bridget for details. Sign up below. 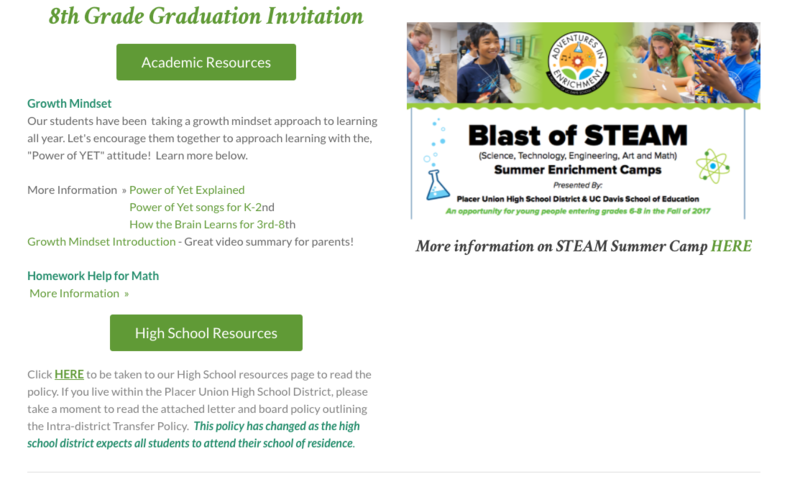 Click HERE to be taken to our High School resources page to read the policy. 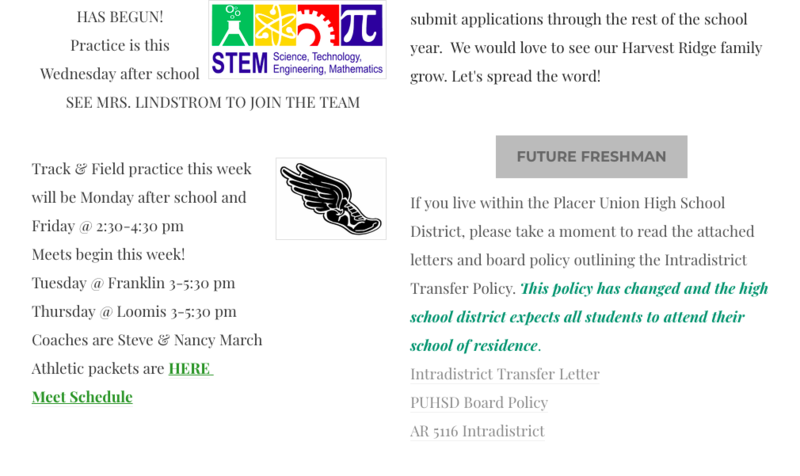 If you live within the Placer Union High School District, please take a moment to read the attached letter and board policy outlining the Intradistrict Transfer Policy. This policy has changed as the high school district expects all students to attend their school of residence. 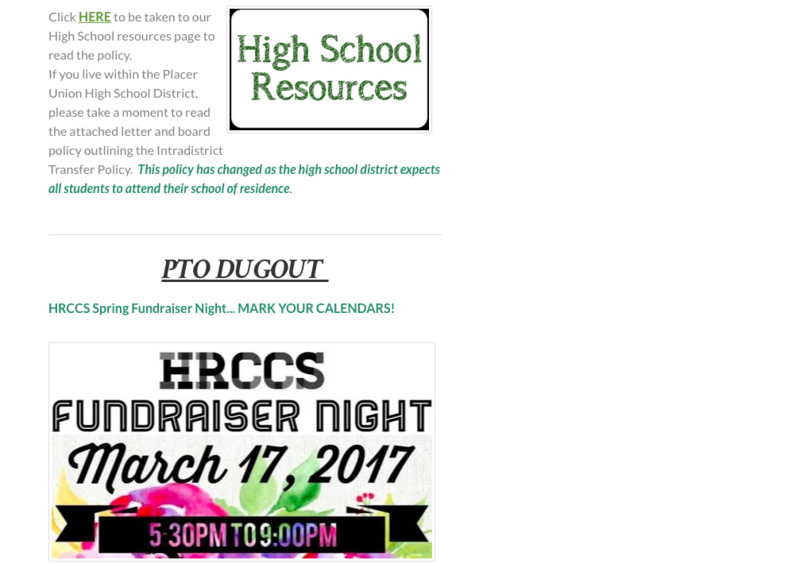 ​HRCCS Spring Fundraiser Night... MARK YOUR CALENDARS! 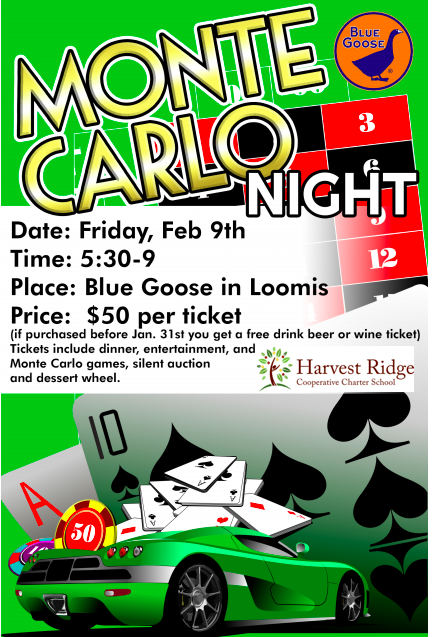 Join us on the luckiest day of the year for the HRCCS PTO Fundraiser Night at The Flower Farm in Loomis. This is our biggest fundraiser of the year! 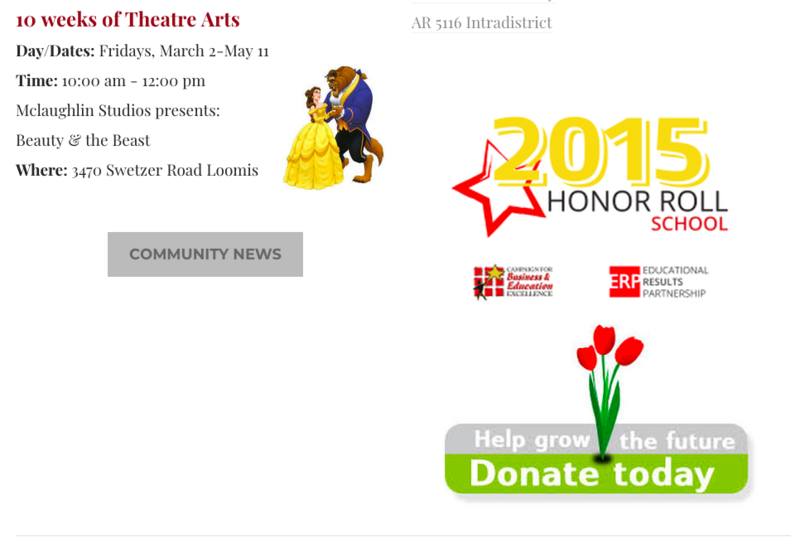 Proceeds will directly support HRCCS Field Trips. There will be entertainment, food and drinks, a raffle, auction, and more. A formal invitation will follow. Wow! Thank you to all who served hot lunch last week. You can sign-up HERE to help create and serve these delicious lunches to our students. 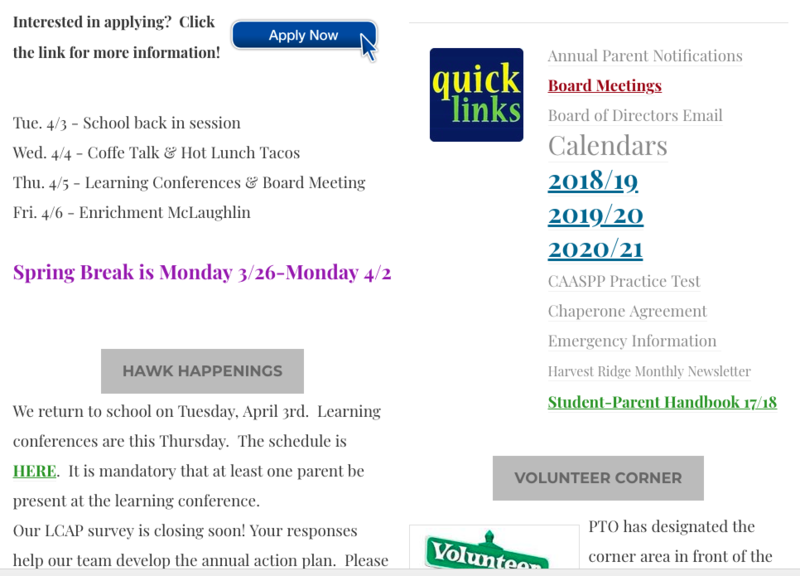 Access the Hot Lunch Menu and Form in the office or HERE . Please be sure to speak with your student if you do not want them to purchase this sweet treat. Remind them to bring their $1 on Thursdays. 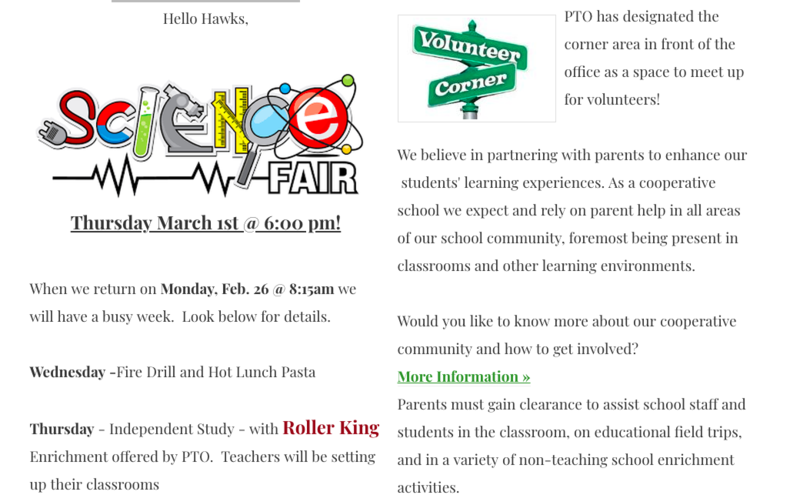 ​Fun activities are also being planned for grades K-5 on February 8th. Feb 26-29: Book Fair... YES! 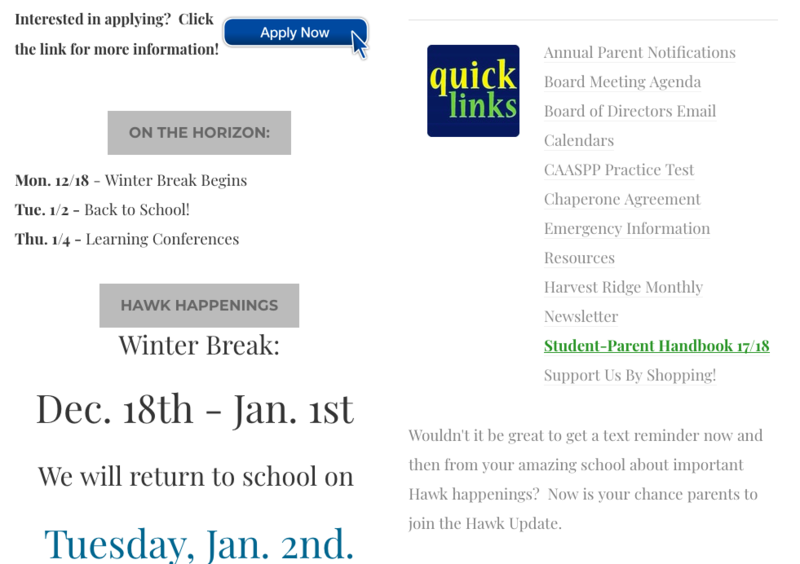 ​Wouldn't it be great to get a text reminder now and then from your amazing school about important Hawk happenings? 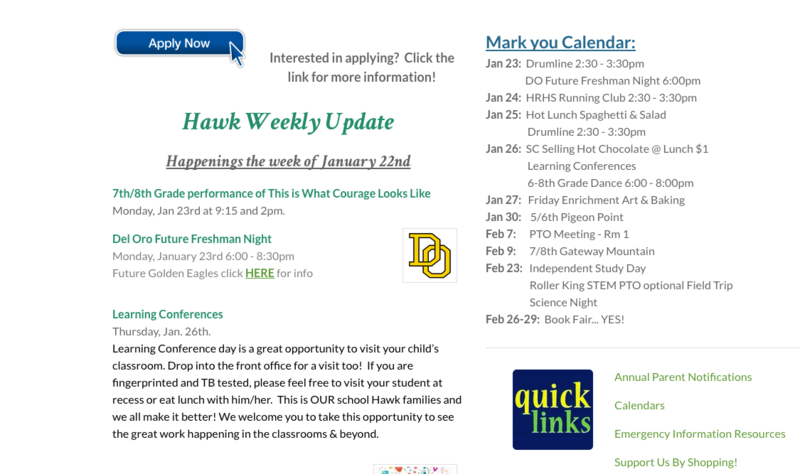 Now is your chance parents to join the Hawk Update. 40 of you have joined and I would like to see all. Directions are below! It's time get off the couch and run. 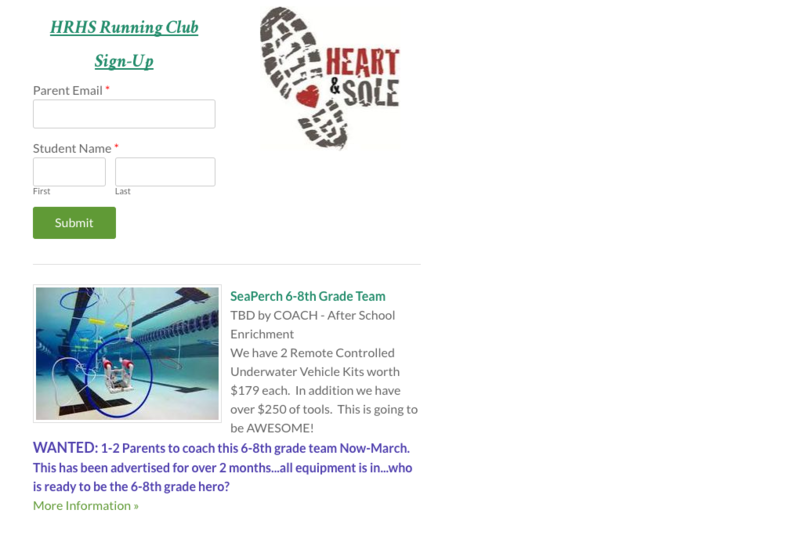 A few parents are interested in starting up this amazing running club and are looking for additional parent volunteers to help ensure student safety on runs. 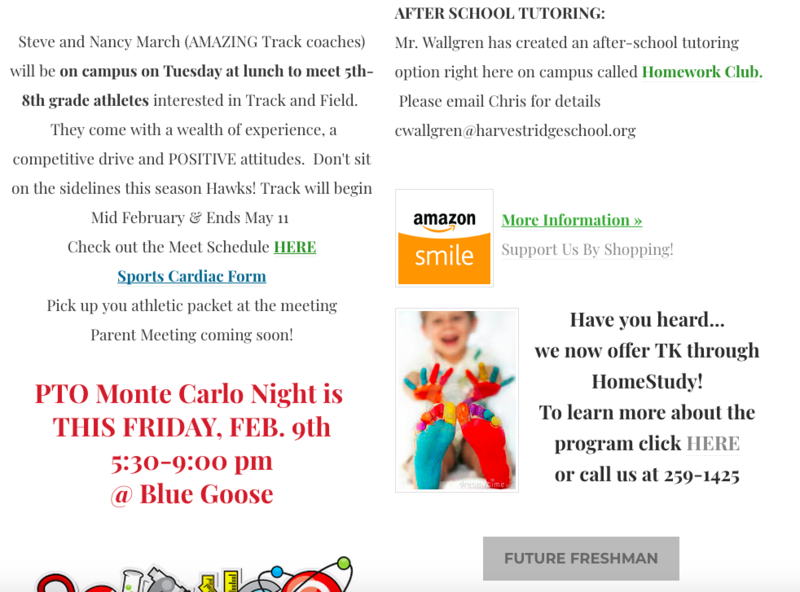 This club will be for 3-8th graders and is open to any other HRCCS younger student runner accompanied by their fingerprinted:) parent/grandparent etc.. Students will be running one day after school and one day before school (weather permitting). Dates and times TBD. We will follow the Couch to 5K running plan and our goal is to begin the week of January 17th and to compete in a in a local 5K event in the late Spring. There is no cost associated with the club except for the entrance fees associated with the 5K run. 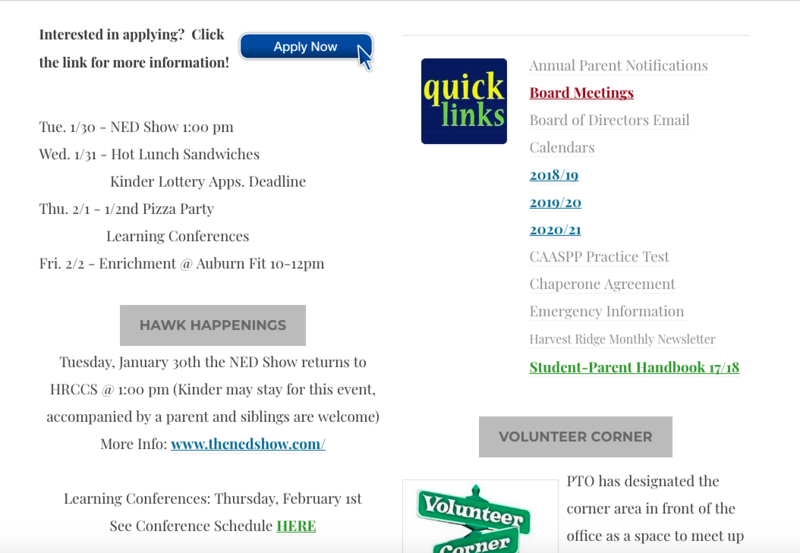 ​Learning Conferences are scheduled for January 26th! It is our tradition to come together as a community of students and parents to celebrate the sciences on this day. 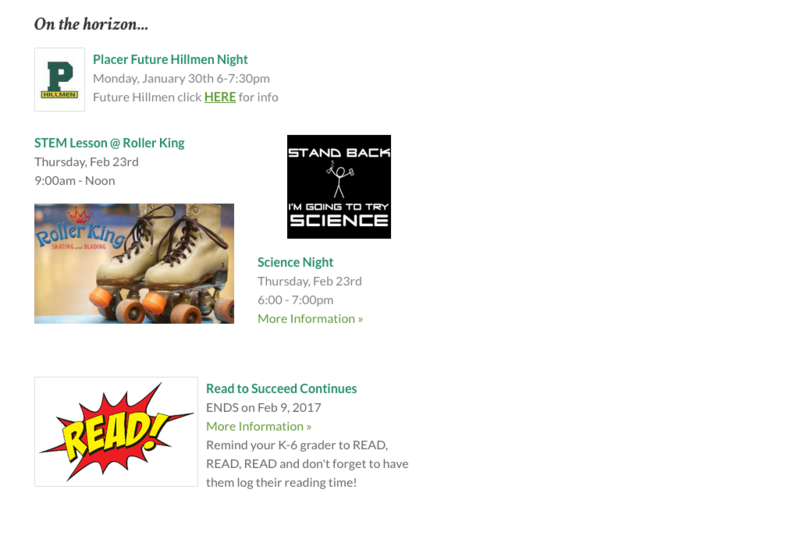 We will begin our science exploration Independent Study Day with a STEM field trip to Roller King from 9-Noon (1 hour of hands on science and 2 hours of skating) The cost of the STEM activity and skating is $9 per skater. Parent skaters are $5 and non-skating parents and children are free. You are welcome to bring in snacks and food to the rink, but there is also a snackbar. 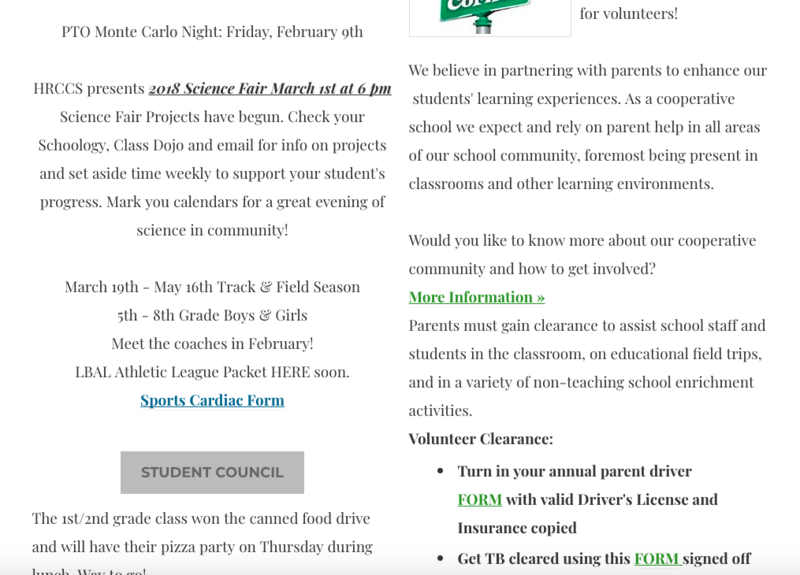 Following our field trip, families will go home and rest up for our Science Exhibition Night beginning at 6pm.Much like our Art Night, this is an opportunity for students to show their knowledge in an area of science that appeals to them. Students will learn more about their project options in the coming weeks. 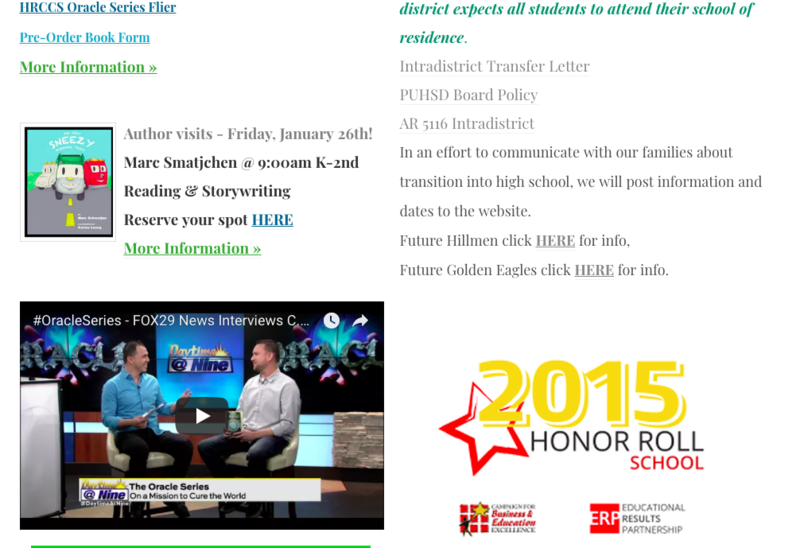 January is the time that our eighth grade families begin the process of transitioning into high school. On January 10th, 8th grade students will be visited by Del Oro Counseling team and on January 11th, the Placer Counseling Team visits. 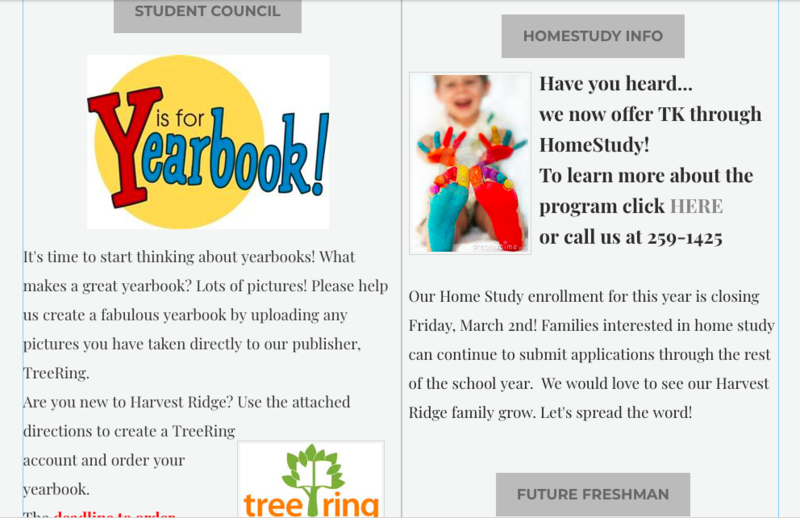 This is during the school day, but mark your calendars for Future Freshman Nights. Information on both schools is below. 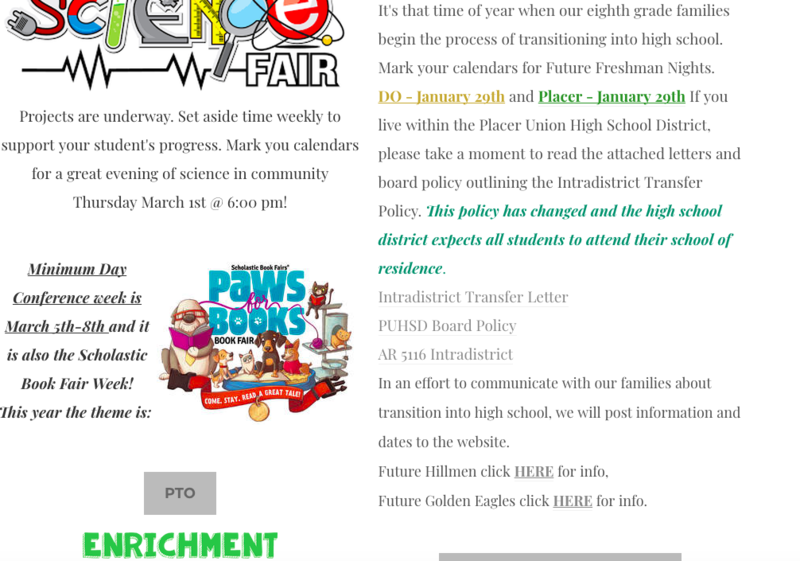 If you live within the Placer Union High School District, please take a moment to read the attached letter and board policy outlining the Intradistrict Transfer Policy. 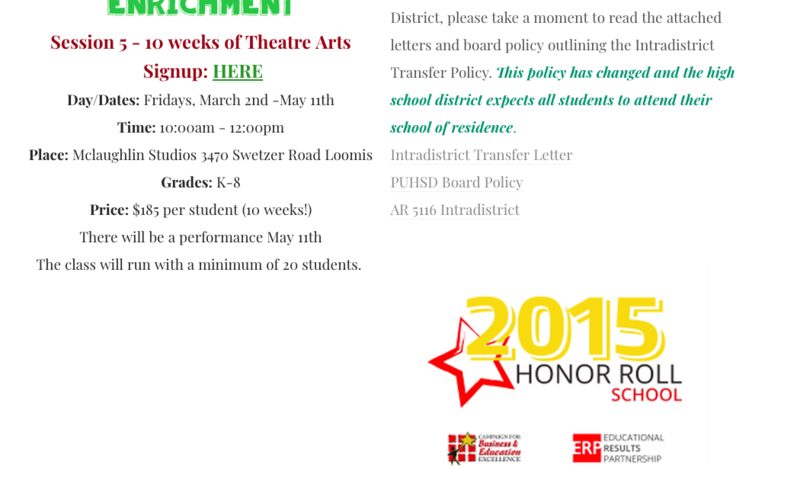 This policy has changed as the high school district expects all students to attend their school of residence. 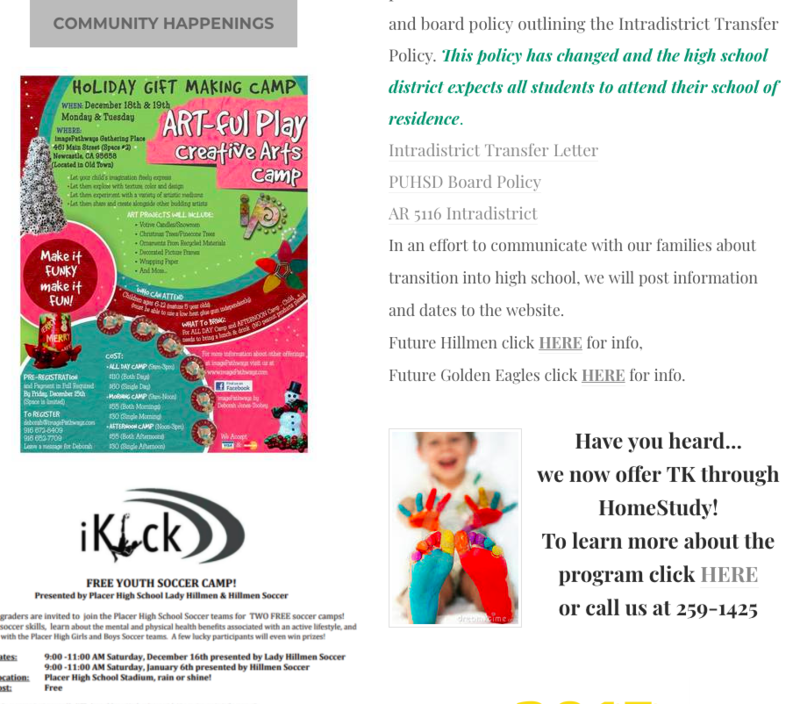 Click HERE to be taken to our High School resources page to read the policy. 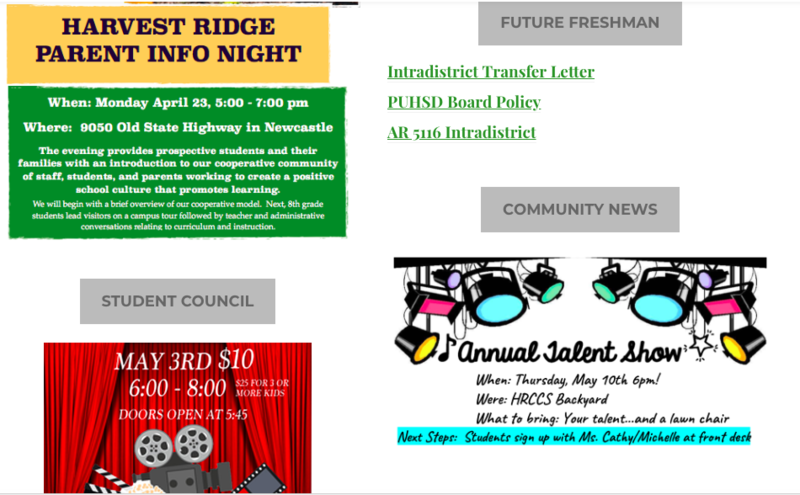 In an effort to communicate with our families about transition into high school, we will post information and dates to the website. Future Hillmen click HERE for info, Future Golden Eagles click HERE for info. 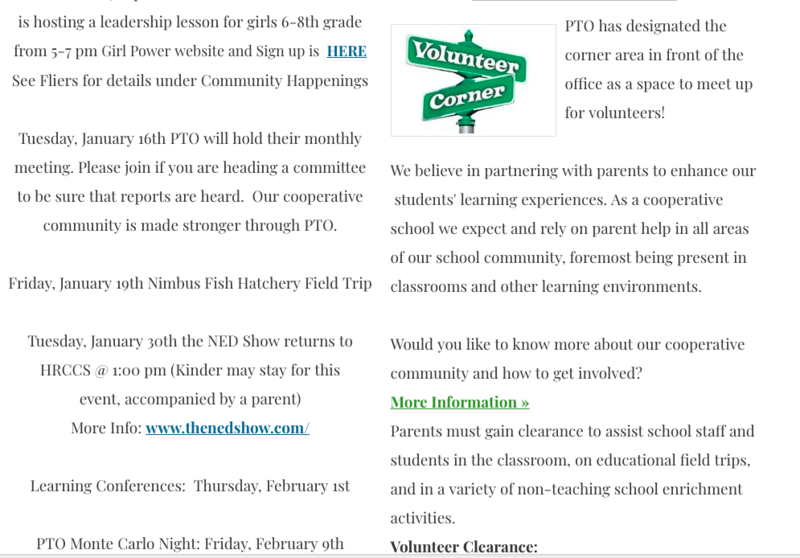 Instead of a PTO meeting this month we will be meeting on Tuesday, January 10th at 2:45 to plan the upcoming Spring fundraiser. ​Student Council will be selling hot chocolate for $1 per cup during lunch on January 12, 19, 26, February 2 and 9th. Our canned food drive was a success! Overall we collected 448 food items. Congratulations to Mrs. Wenstrom’s class for winning our contest with 127 cans. As a reward they enjoyed hot chocolate and a homemade cookie. Student Council is currently hard at work preparing for Valentine’s Day. 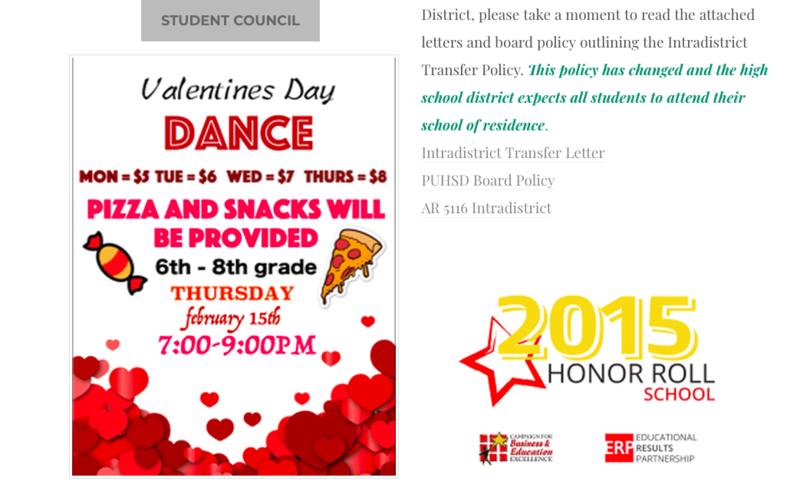 There will be a Valentine’s dance for grades 6-8 on January 26th. 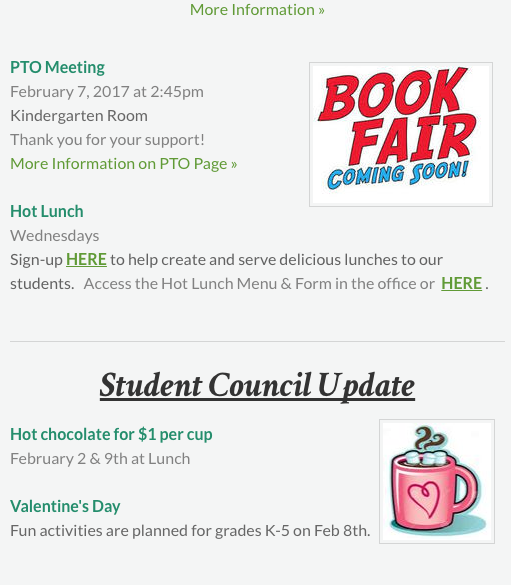 Fun activities are being planned for grades K-5 on February 8th. Stay tuned for more details! 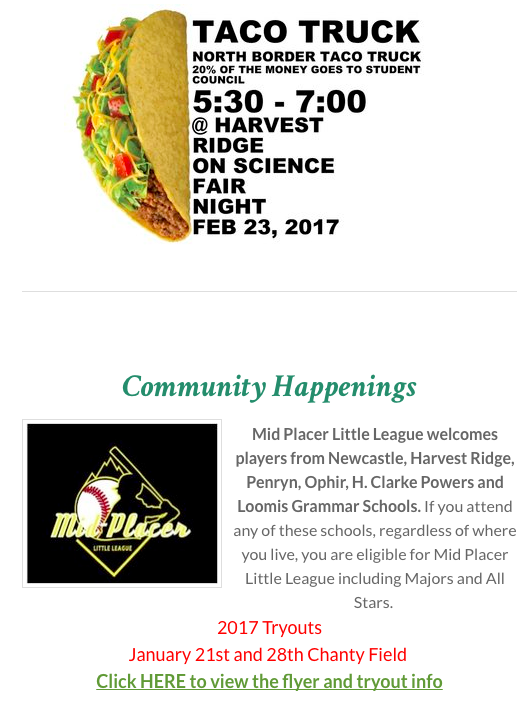 ​​Mid Placer Little League welcomes players from Newcastle, Harvest Ridge, Penryn, Ophir, H. Clarke Powers and Loomis Grammar Schools. If you attend any of these schools, regardless of where you live, you are eligible for Mid Placer Little League including Majors and All Stars. Theme: HRCCS Neon Christmas ~ Let's be BRIGHT! 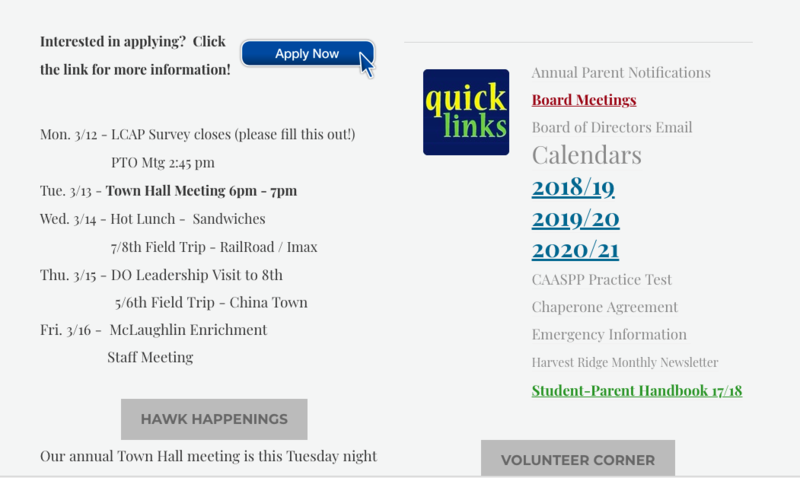 ALL Hawks are welcome to walk behind the float AND MUST BE ACCOMPANIED BY A PARENT/GUARDIAN at all times during the parade. Staff will not be in charge of parade walkers this year. Drumline will be performing on the float and will have special parade instructions given to parents after Thursday practice. DONATIONS OF CHRISTMAS LIGHTS AND GLOW STICKS ARE NEEDED AND CAN BE DROPPED BY 12/1 TO THE OFFICE...THE FLOAT MUST BE LIT AS A REQUIREMENT FOR PARADE ENTRY. BRING IN THOSE LIGHTS HAWKS! Practice this week will be Tuesday/Thursday 2:30-3:30. 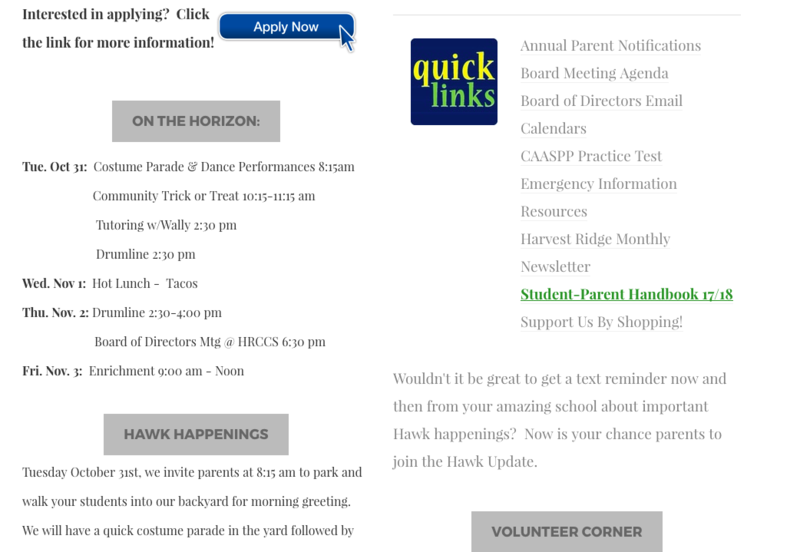 A quick parent meeting following practice on Thursday will be held in the backyard to review parade details. Enrichment Session 3 has filled and is closed. The 3 week enrichment will be all pottery at Peace of Art Studios, 1472 Grass Valley Highway Auburn Ca 95603. 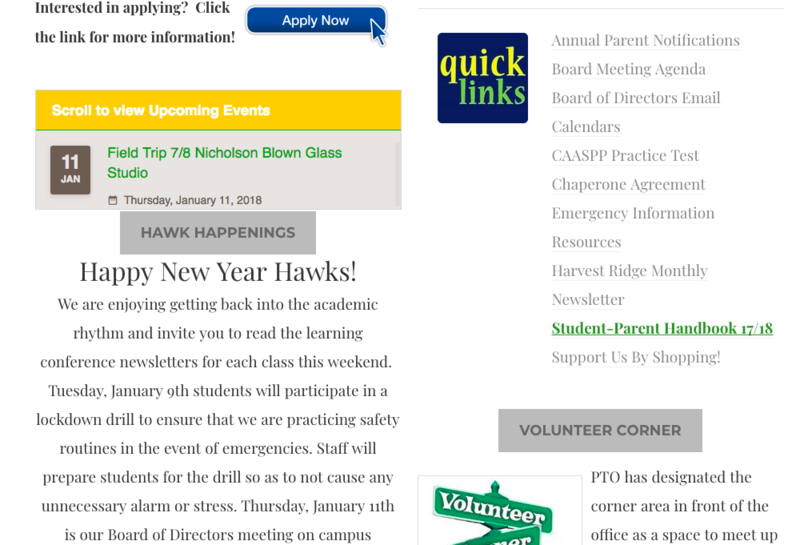 Just a reminder that the December Learning Conferences will be inNewsletter form and will not require a classroom meeting. Sign-Up HERE soon to help create and serve these delicious lunches to our students. 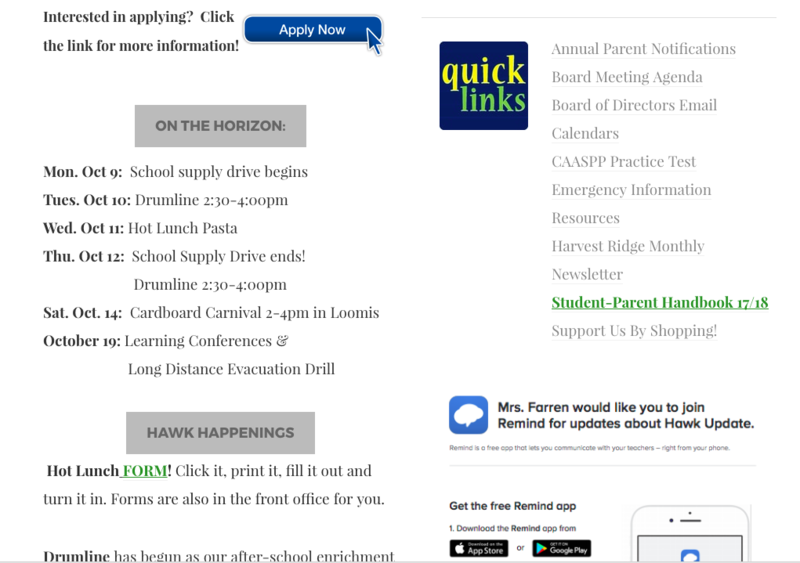 Access the Hot Lunch Menu and Form in the office or HERE . 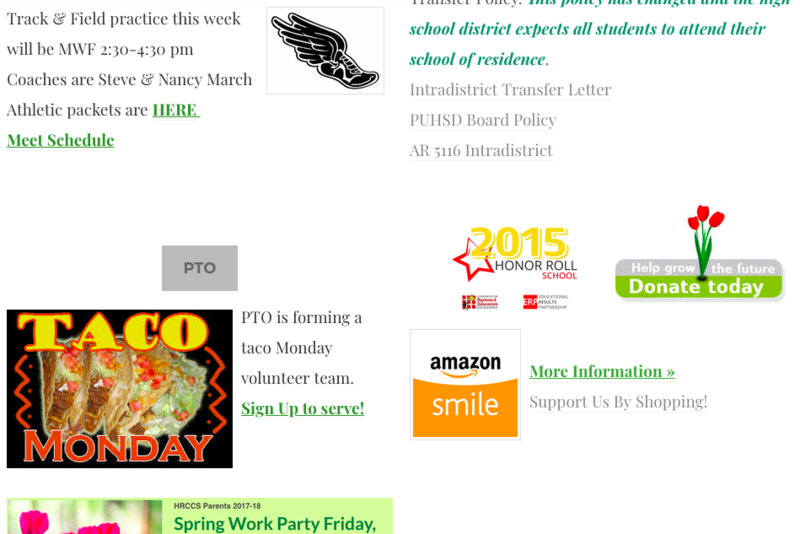 PTO DUGOUTOur next PTO Meeting ~ is scheduled for Tuesday, December 6th at 2:45pm. 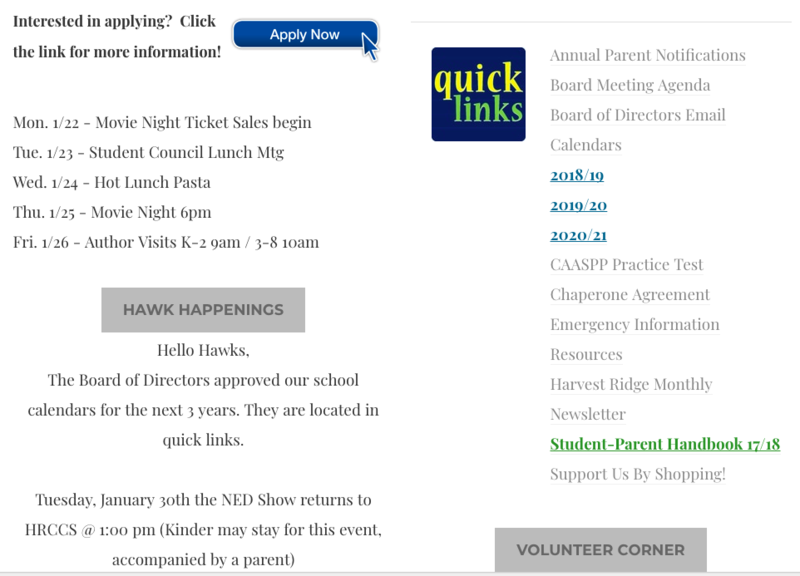 ​Hawks Dinner Out is on 12/8 ~ See Below for details! 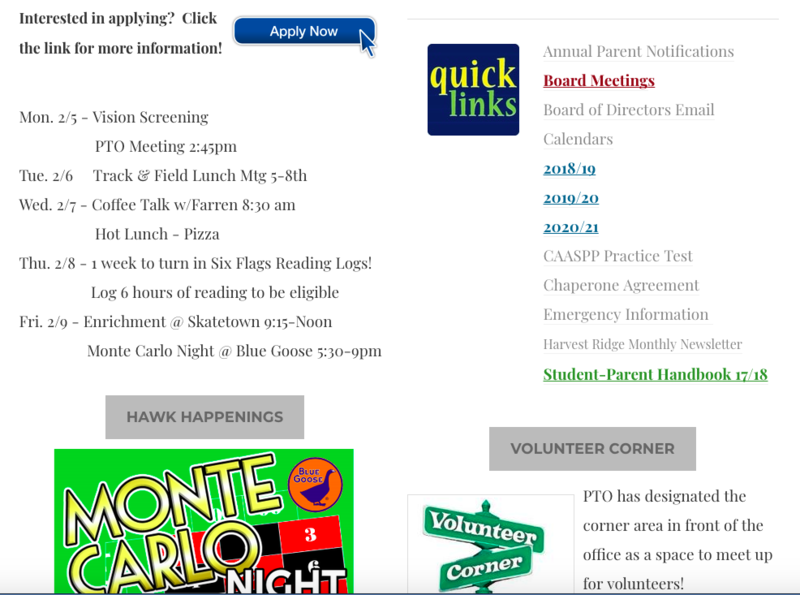 Check out what Student Council has planned for our Hawks! Student Council will be hosting a canned food drive from December 5th-14th. All items collected will be delivered to the Auburn Interfaith Food Closet. Click HERE to see a list of the items they need most. The class who collects the most items will receive a hot chocolate and cookie party. The conference schedule is open and can be accessed HERE . That week will be MINIMUM DAYS for students, and ALL students will be dismissed at 12:00 noon. Enrichment Session 3 is open! ( 3 wks of December ) ~ Dana is back and so is Peace of Art Pottery and Intro to Characterization and Costume Design! Students can use this time to make art projects to be used as holiday gifts. The clay project will be fired and brought back to school after Thanksgiving Break. Drumline continues Tuesdays and Thursdays from 2:30-3:30pm. During mini day conference week T/TH practice will be 12-1 (pack a lunch for Tuesday). Do you want additional after school enrichment for your students like Chess, Math, Music, Spanish or Running Club? 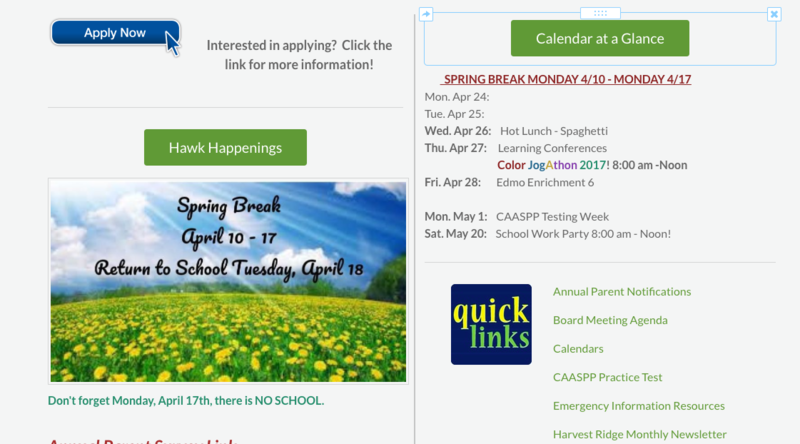 Click the green button below titled, Enrichment Opportunities, to be taken to a list of enrichment ideas and survey links. So far two families have filled out two surveys. It's time to take a hike again! The next hike will be at Hidden Falls in Auburn 7/8th meet at the school at 8:30am and we will meet other hikers with their families at 9am in the parking lot of Hidden Falls. We will open this one up to all ages, because there is a break between enrichments. Parents are welcome to attend for 7/8th grades, but are not required. Any other younger student must be accompanied by a parent or another adult willing to be responsible for that student. 7/8th will finish the day at the Cheese Shop for lunch (bring money for that treat) and parents of 7/8 hikers pick up at Cheese Shop. 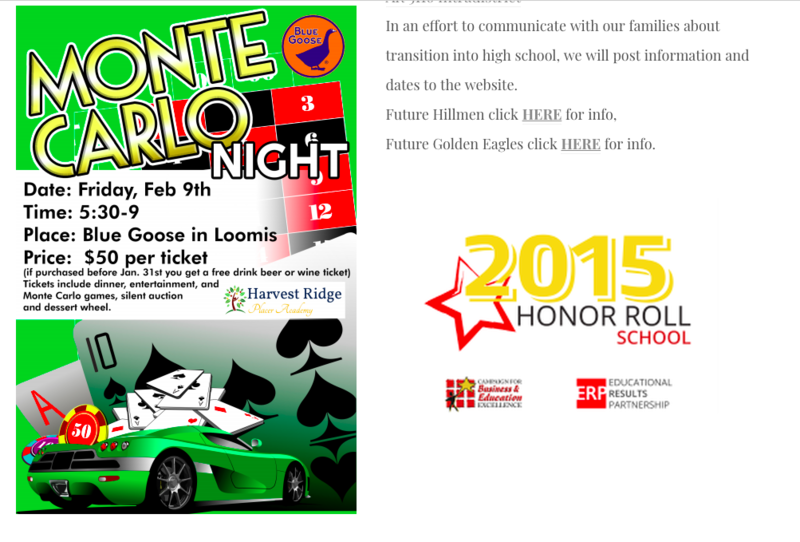 Hike for 7/8th is $3 and will pay for gas for those parents who offer to drive. 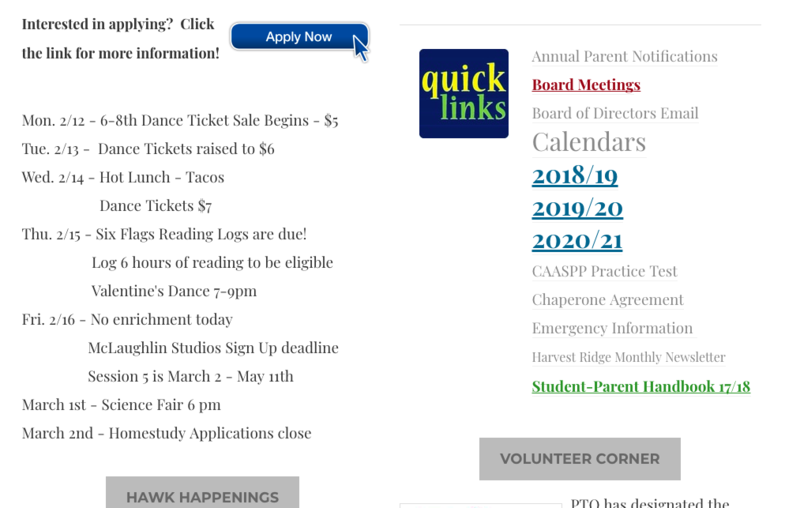 No fee for K-6th hikers with parents. Click HERE to sign up. 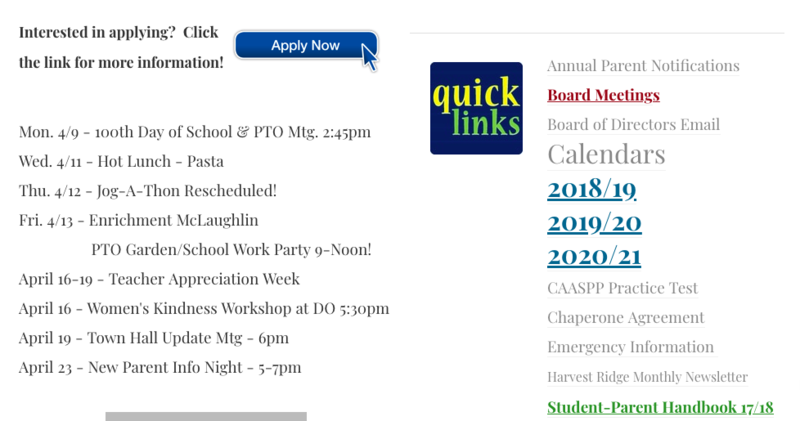 PTO Meeting TUESDAY, Nov. 8th @ 2:45pm! 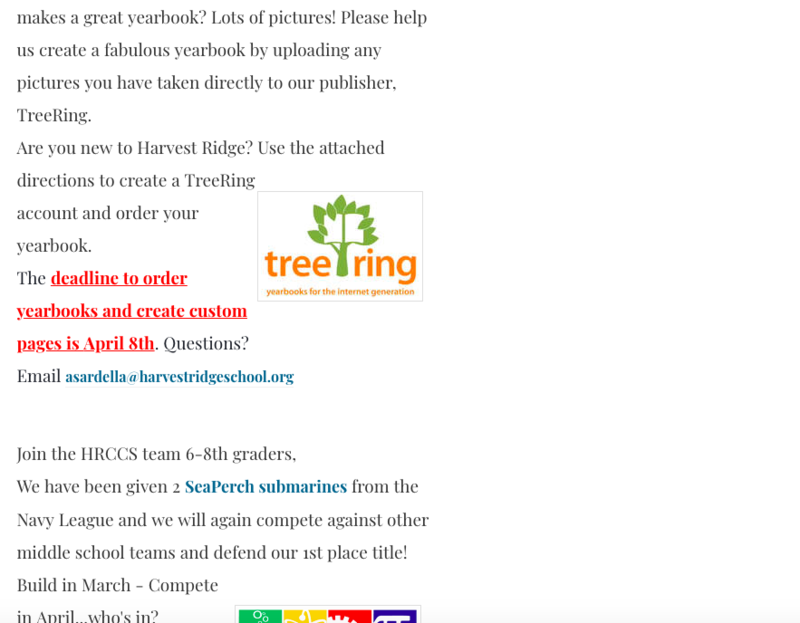 ​ MANDARIN FUNDRAISER ORDERS DUE NOV. 14TH! Delivery of orders is on the 16th. Since the order due date is so close to the delivery date, late orders WILL NOT BE ACCEPTED. Roseville Friday Flicks presents "Finding Dory"
Movie starts at 6:30 p.m. or sunset (whichever is later). Grab a blanket, lawn chair and the family for a movie under the stars! In the square, weather permitting. Free movie. Concessions available for purchase. Monday, October 31st in keeping with HRCCS tradition, we invite all students to come dressed in costume for the day. Please keep costumes appropriate to the school environment. We ask that you steer clear of super scary or bloody costumes (no clowns this year) and to keep your costume weapons at home for the day. Parade and Costume Contest-first thing in the morning, the students will be parading around the playground in their costumes. Student Council will be choosing one winner per class! Trick or Treat Parade in downtown Newcastle-Students will be visiting the Newcastle merchants and showing off their fabulous costumes. Classes will be ready to head out at 10:00am. We welcome parents to join us! We do ask that you be fingerprint and TB cleared. If Halloween is not your thing, families are welcome to communicate with their child's teacher and work from home for an Independent Study day on this day. ​District Advisory Council members NEEDED! We are in need of a primary rep and an upper grade rep who would commit to attending the Newcastle district advisory meetings once a month. This is a great opportunity to share with NESD our parent perspective for HRCCS and to gain perspective from the district to bring back and share out to our team. Please contact Bridget for the meeting schedule. Volunteer hours with little work involved! 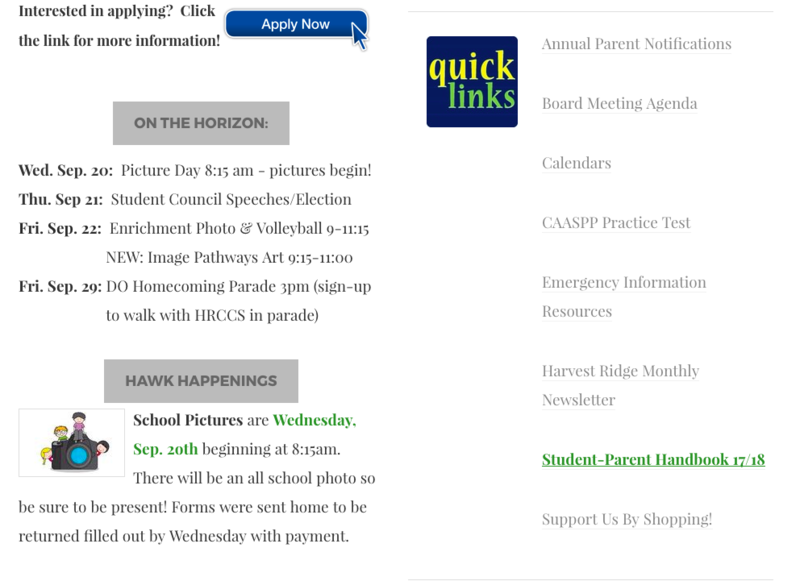 Fall Parent Conference Open Monday! Enrichment Session 3 is open! ( 3 wks of December ) ~ Click HERE to sign up for this short session will feature pottery making with Peace of Art and an introduction to Baking. Students will have the opportunity to create homemade holiday gifts. 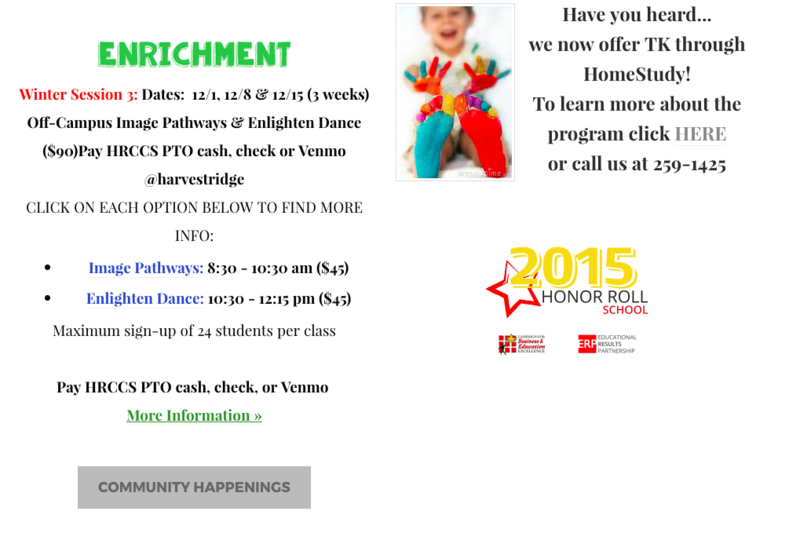 Have you been wanting after school enrichments? 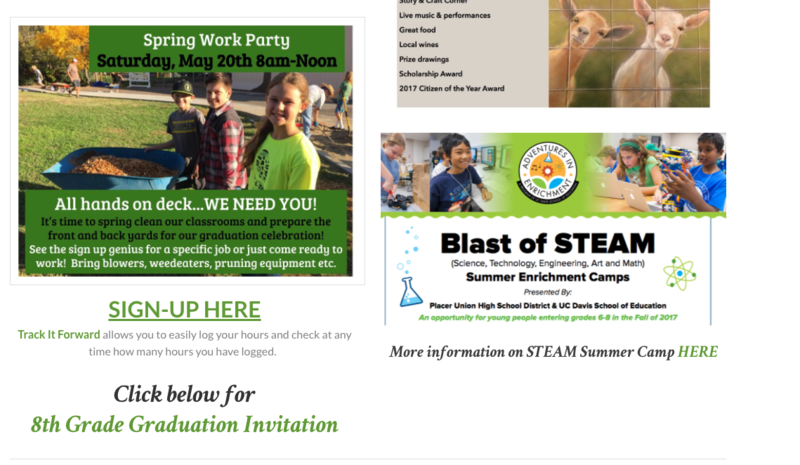 Click the green button below titled, Enrichment Opportunities, to be taken to a list of enrichment ideas and survey links. Together we can continue to build meaningful enrichment opportunities for your students. Hot Lunch Trimester 2 Begins Wednesday, Nov. 30th ~ Thank you again to all of the lunch ladies and gentlemen of Harvest Ridge past, present and future. Details will be added as our Trimester 2 Co-Coordinators, Mrs. Gallegos and Mrs. Thompson, get them finalized. BLAST PIZZA FUNDRAISER is Wednesday 5pm - 9pm! ​Blast 825 Pizza will host a pizza night fundraiser for Harvest Ridge. Conveniently located in the Target shopping center right off of Sierra College, Blast 825 Pizza willdonate 30% of the pizzas purchased November 2nd to our school. 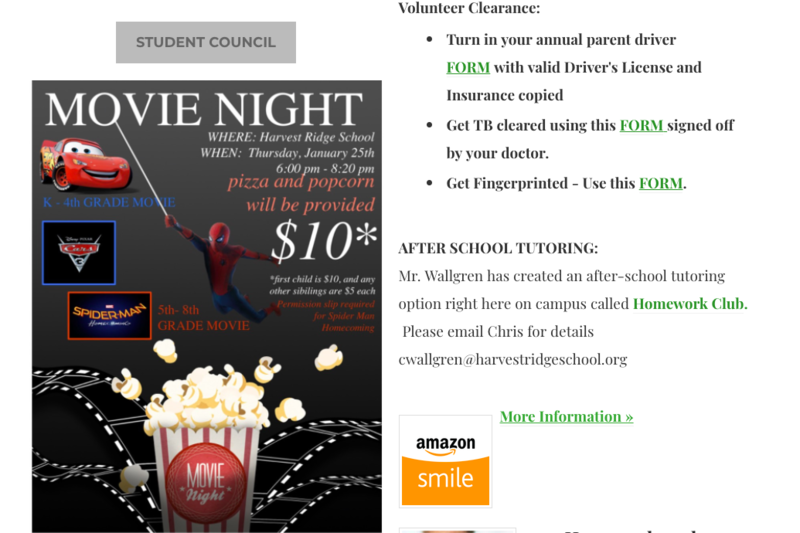 You must have the flier with you to get credit for our school on Wednesday! It's almost time for mandarins, oil, brittle, oh my! Order forms will go out on November 3rd. Orders will be due on the 14th and delivered on the 16th. Since the order due date is so close to the delivery date, late orders WILL NOT BE ACCEPTED. We planted promises this week ~ Thank you to all who donated bulbs and time for planting with students. We are excited for April to see our red tulips grow in the north corner of the lawn reminding us to make healthy choices. 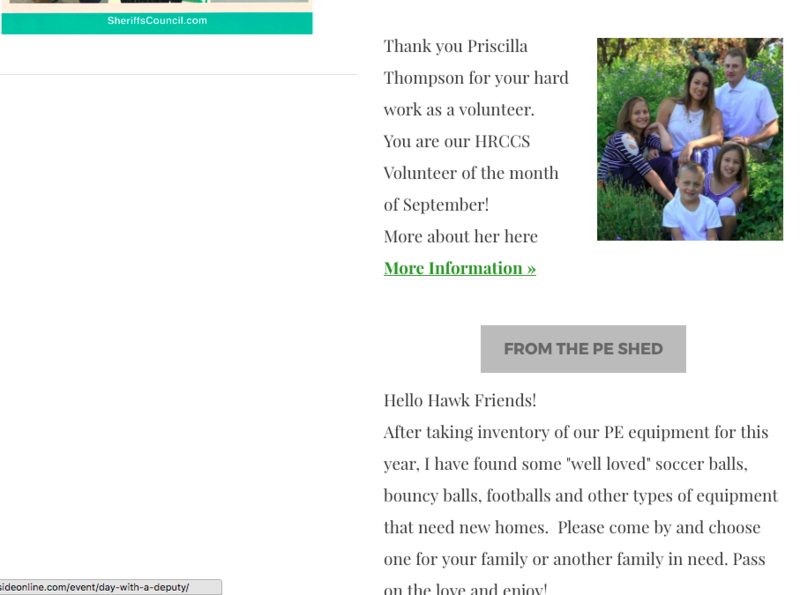 ​Hawks at work in our community ~ 8th Grader Maicee is hard at work on her community service project and this week she needs your help. Bring in your empty cereal boxes for her to collect. Read more about Maicee's project HERE. GIRL POWER! Last Tuesday the Del Oro Women's Athletic Club met with young ladies and their moms to work out together in honor of Women's Empowerment month. It was incredibly uplifting to see teens modeling healthy positive relationship building skills with our young ladies in the community. Our up and coming running club was mentioned and we look forward to starting this up. 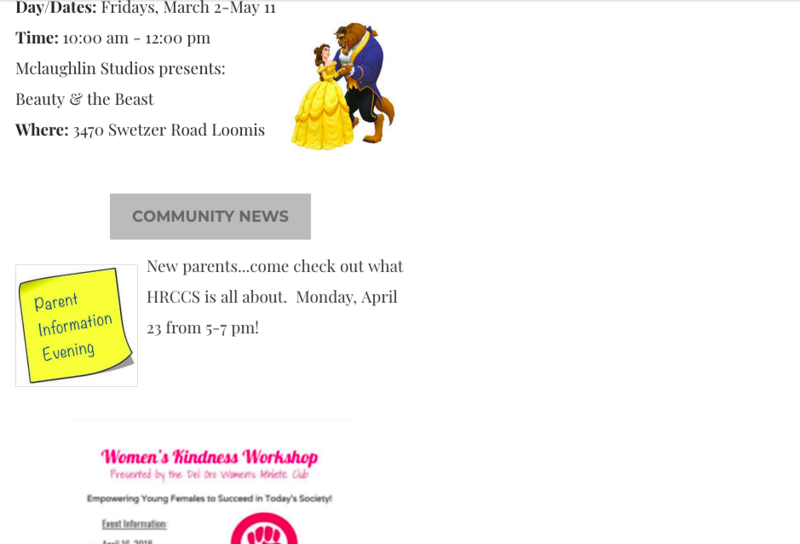 It will be titled Harvest Ridge Heart & Sole and will be open to boys and girls. Otter Pops for the class with the most of their class color. Dress in your favorite outfit and be ready to smile for you annual school photo. Thursday: School Spirit! Wear your Hawk Gear and Green, Black & Gold! Otter Pops to one person in every class who shows the most school spirit. 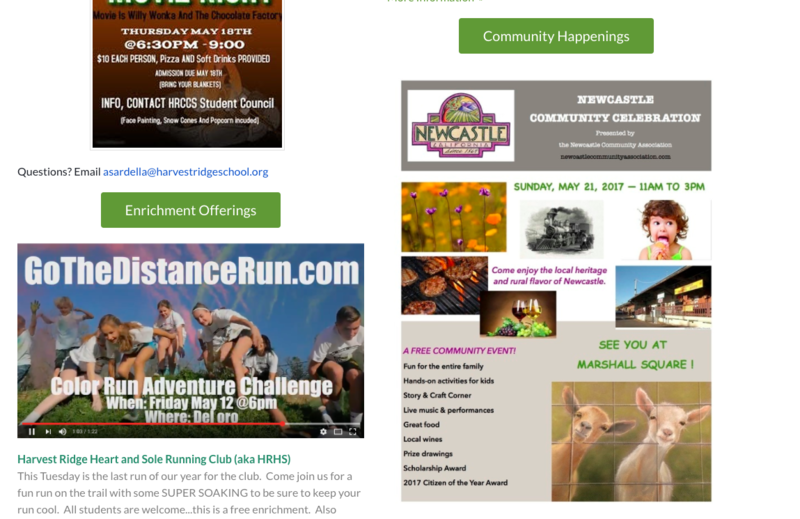 The Newcastle district is asking each school administrator to invite parents to join their advisory team. We are looking for a primary rep and an upper grade rep who would commit to attending the district meetings that happen once a month. 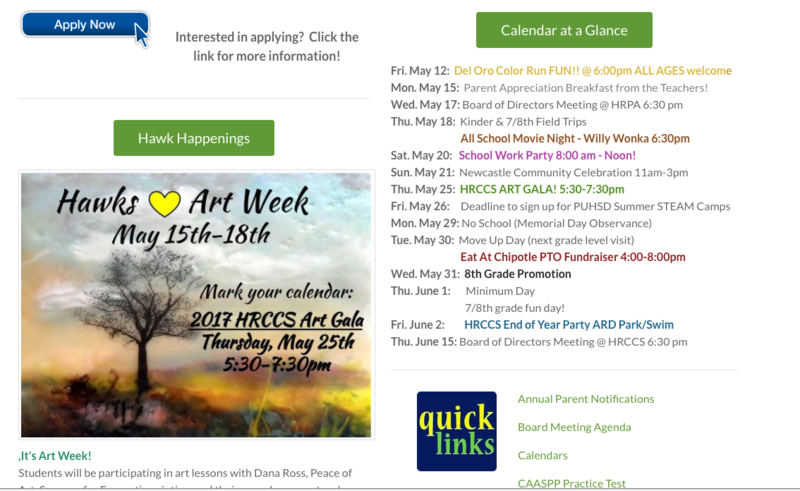 This is a great opportunity to share with NESD our parent perspective for HRCCS and to gain perspective from the district to bring back and share out to our team. Please contact Bridget if interested. 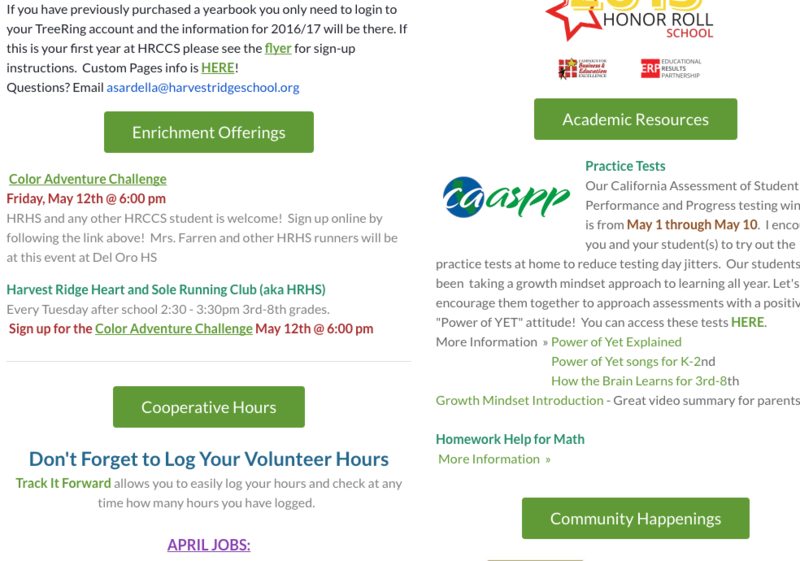 This is also another way to log volunteer hours! 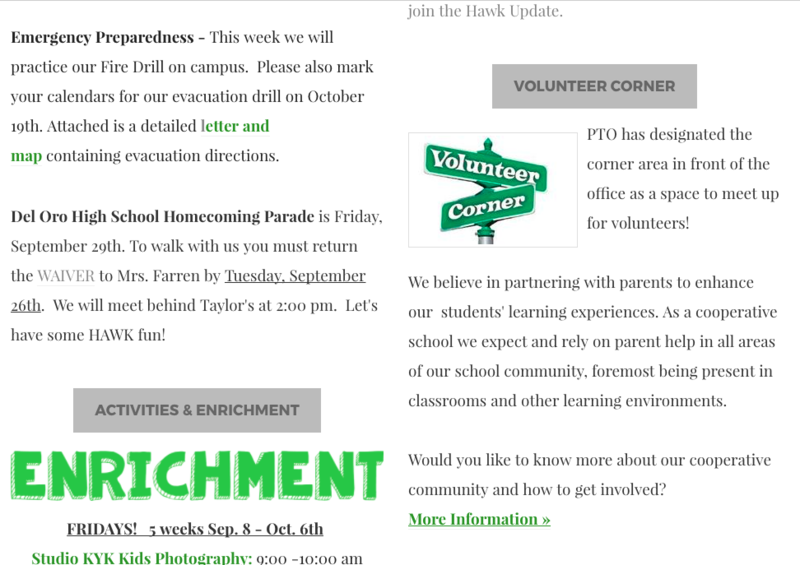 In an effort to better serve the students and families of Harvest Ridge, enrichment opportunities will continue to be offered in full on Fridays and will be periodically added before and after school. Drumline enrichment is back this Fall two days a week after school and has been extended to 3-8th grades. 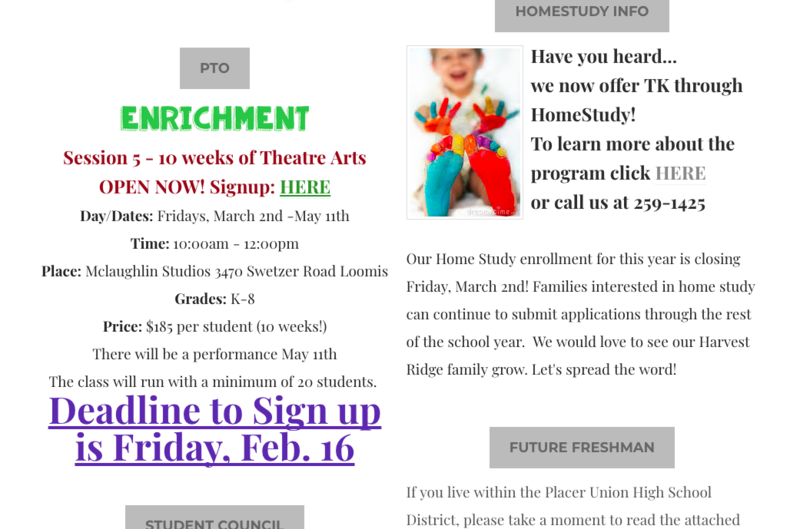 Other enrichment opportunities will be added based on survey results and sign-ups, see survey links below. Some enrichments like drumline have already been budgeted for this year and will remain free. Other enrichments will have a fee associated with them to cover the cost of the advisor and will be based on enrollment. I am excited to continue to listen to you and learn of enrichments that would interest our families. 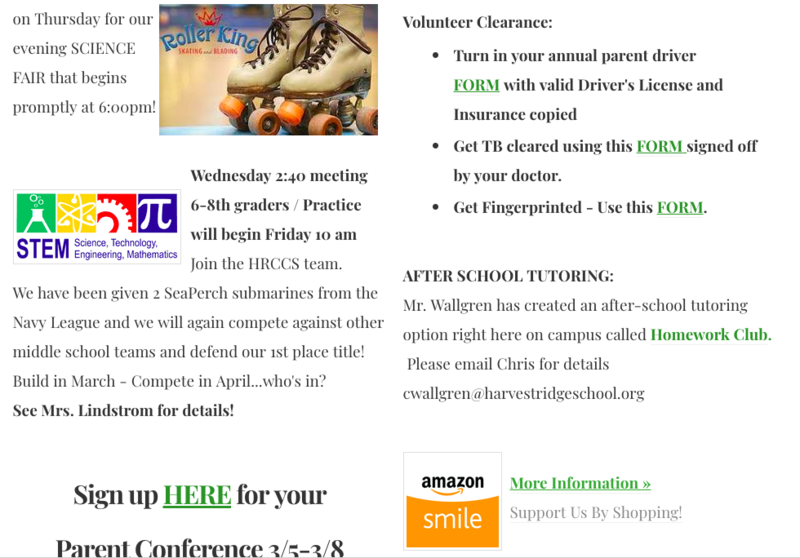 If you are interested in becoming an after school enrichment volunteer or advisor, see me. Chess Club Click HERE to fill out the Chess Club Survey. 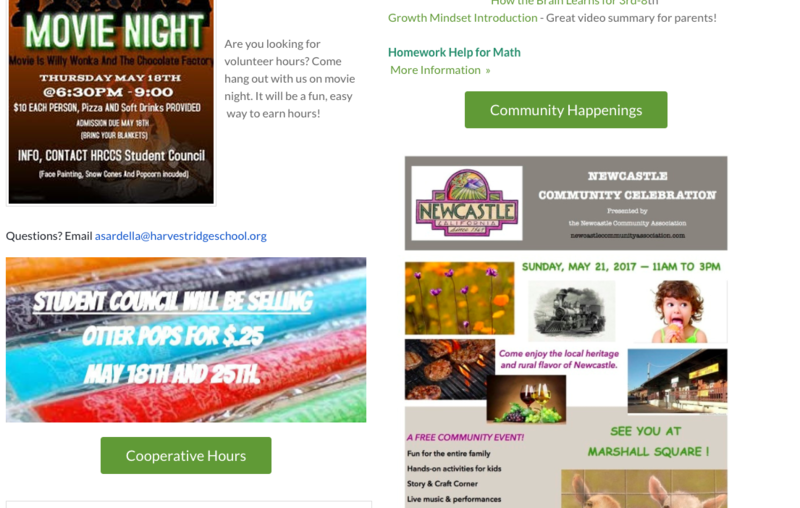 Math Help Click HERE to fill out the Math Homework Help Survey. SeaPerch Click HERE to fill out the Seaperch Enrichment Survey. Spanish TutoringClick HERE to fill out the Spanish Enrichment Survey. 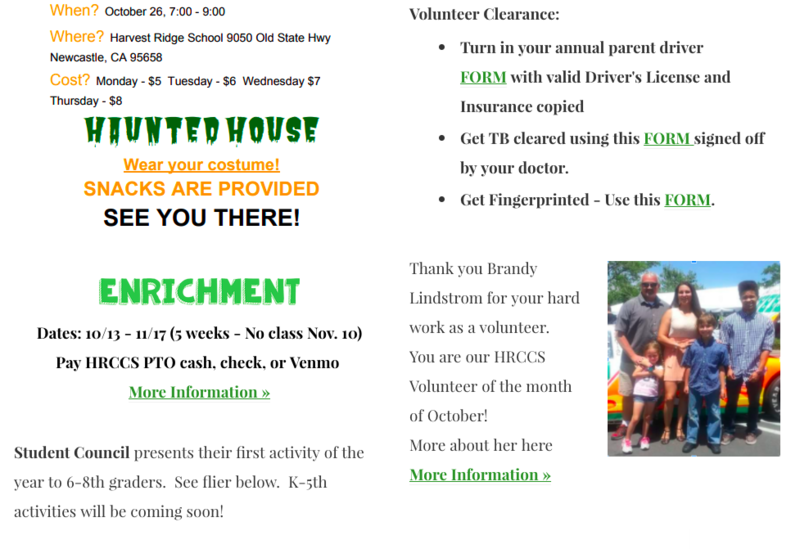 The council has been busy organizing events for this month including the Halloween Dance on October 27th for Grades 6-8 which will be held in the backyard complete with a haunted hallway and songs picked out by each student who attends! Get your ticket early (by Wednesday) and pay only $5. Tickets at the door will be sold for $8. The night includes a pizza dinner and many other snacks. Hot Lunch Update : November 3rd is the final hot lunch of our Trimester. This week's lunch is pizza! We want to send out a special thank you to Season and her team of culinary moms and dads who have made hot lunch possible each week so far this year. To prepare for the next wave of hot lunches we need: 1 Volunteer Hot Lunch Coordinator for Trimester 2 to step forward and lead the next team to more culinary goodness. Join us on Tuesday, October 25th right after school for 30 minutes as we brainstorm our next menus. 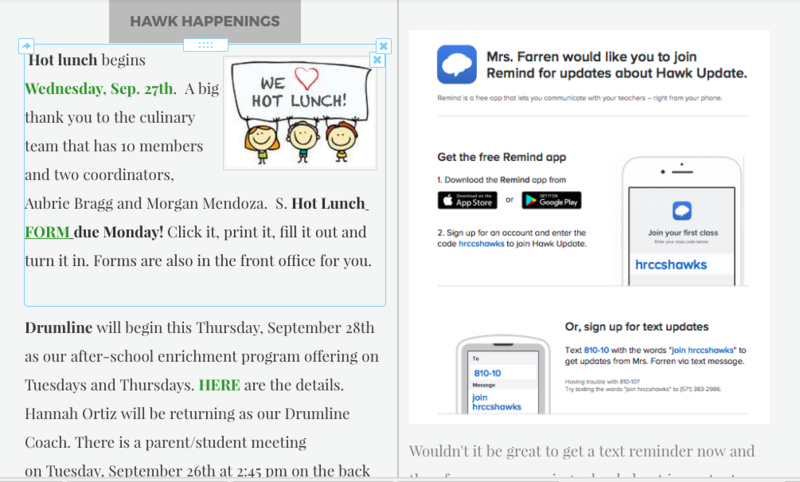 Parents, the staff will be asking students what their favorite hot lunch menu items are during the week, so that we can be sure to share these out in the brainstorm session. Serving healthy and delicious hot lunch to over 100 students, in a 30 minute window of time, from a very tiny kitchen, is no easy task. Please consider volunteering your time to plan and serve this weekly meal for the next trimester. Many hands make light work! ​Learning Conferences are November 14-17th ~ Mark your calendar! Look back here this week for the Sign-Up Genius link to schedule your learning conference time. Keep them coming! They are due on October 27th. We will take the average per student to calculate the winner. That time of year is quickly approaching! Brittle is being added this year. If you didn’t get a chance to taste it at the Learning Conference, it’s delicious! Order forms will go out on November 3rd. Orders will be due on the 14th and delivered on the 16th. Since the order due date is so close to the delivery date, late orders WILL NOT BE ACCEPTED. On Wednesday, November 2nd between 5pm and 9pm, Blast 825 Pizza will host a pizza night fundraiser for Harvest Ridge. Conveniently located in the Target shopping center right off of Sierra College, Blast 825 Pizza will donate 30% of the pizzas purchased November 2nd to our school. Many of the students have already received the BLAST flier that you will need to present on 11/2 @ Blast. 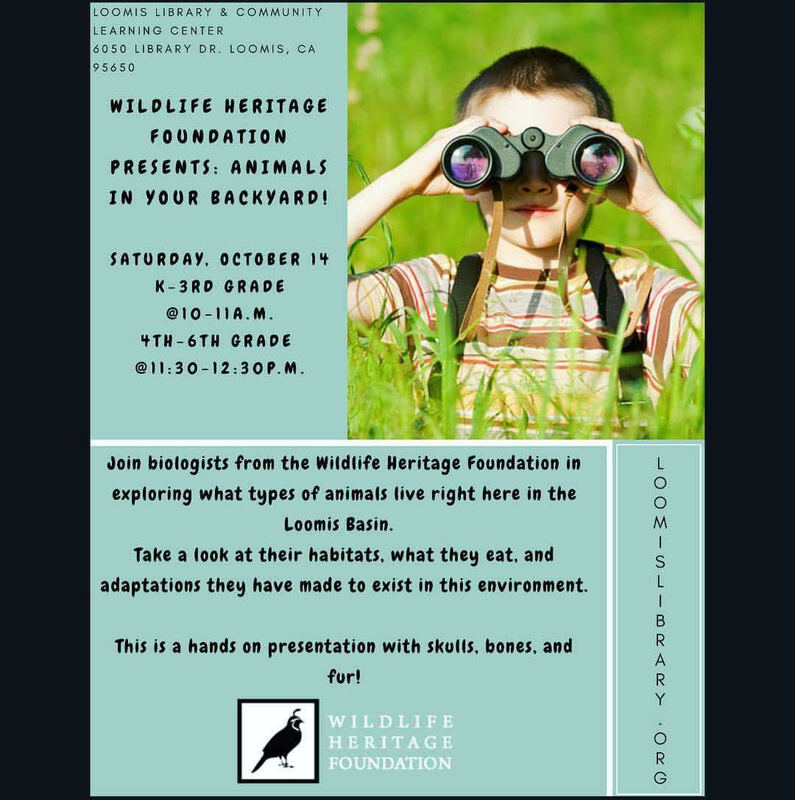 The flier went out too early in K-6th grade folders. Find that flier and put it in your car for safe keeping! We will pass out some extras the day of the fundraiser. ​​WHAT IS RED RIBBON WEEK? It is an ideal way for people and communities to unite and take a visible stand against drugs. WHY? The Red Ribbon Campaign® was started in 1985 following a terrible loss of law enforcement in a drug-trafficking incident. This began the continuing tradition of displaying Red Ribbons as a symbol of intolerance towards the use of drugs. The mission of the Red Ribbon Campaign® is to present a unified and visible commitment towards the creation of a DRUG - FREE AMERICA. WHO? National Family Partnership is the sponsor of the National Red Ribbon Week® Celebration. We are helping citizens across the country come together to keep children, families and communities safe, healthy and drug-free, through parent training, networking and sponsoring the National Red Ribbon Campaign® WHY SUPPORT THE NATIONAL THEME? A theme unifies each year’s campaign and helps to broadcast one message, creating a tipping point to change behavior. WHAT WE WILL DO THIS WEEK AT HRCCS ~ In honor of Red Ribbon Week we will promote conversation about how to make safe and healthy choices. Monday, our school resource officer will kick off the week with a greeting to our K-4th graders emphasizing our promise to make healthy choices and a red ribbon bracelet will be passed out to each student. 5-8th graders will hear the National theme of YOLO this year, which means You Only Live Once so make safe and healthy choices and make the drug free choice. Tuesday, the Newcastle Fire Dept. will stop by to remind students how to prevent and stay safe during a fire. To close the week each student will be given a red bulb to plant in our front yard to symbolize their promise to make healthy life choices. Can you help plant a promise this week? In honor of Red Ribbon Week each student will plant one red bulb and in April, when the red blooms grow we will be reminded of our pledge to make healthy choices. Donations of red bulbs will be accepted through Tuesday. See Bridget for details. We only need 110 bulbs. 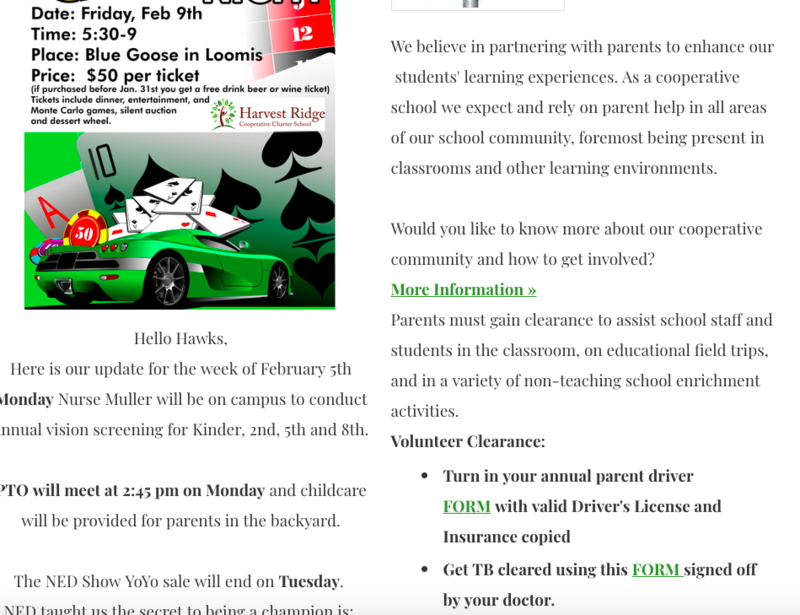 ​Loomis Community Preschool Carnival Reflection. Several students volunteered their time building and manning their carnival game called Ghost RIP at the carnival this last Saturday. We had a great time sharing with the greater community all about our awesome school! GIRL POWER! This TUESDAY, October 25th from 5-7pm we have another community event for girls ages 5th grade and up and their moms. Join us for a workout at RawFit @ 3137 Swetzer Rd. in honor of Women's Empowerment month. Click the link below to see their flyer! The Kaufman family (owners of RawFit and the Women's Athletic Club of Del Oro have teamed up to bring our community of awesome young ladies and their moms together to play, sweat and encourage one another. This is a donation event so come work out and bring a few dollars. This money will go to WAC and they have heard of our desire to start our own running club called Harvest Ridge Heart and Sole (more on this 5-8th grade running club soon). They want to meet us and encourage our girls! Be sure to arrive 15 mins early to sign your waiver and be sure your mom comes to watch or sweat alongside you. ​Our students continue to learn about growth mindset in daily lessons. If you haven't had the opportunity to dig deeper with this concept at home, read this article from Huffington Post. The three questions posed are a great conversation starter at home. Bravery, kindness and the courage to keep trying when things get tough are attributes we often see in successful people. These are the attributes we want to foster and affirm in our Hawks! Friday drop-off is at 8:30am, classes run 9:00am-12:00pm. 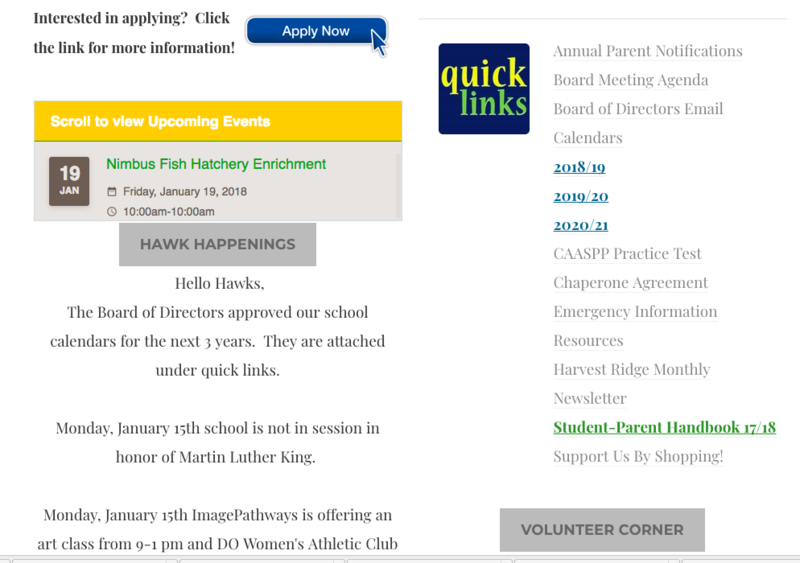 Click the green button below titled, After School Enrichment Opportunities, to be taken to a list of enrichment ideas and survey links. Together we can continue to build meaningful enrichment opportunities. Boys 4-6 Underwear, socks, shorts/pants and 6-8 underwear are needed to stock up our spare clothes drawers at school. Volunteers are always welcome. Click HERE to sign-up. We had a great turnout at the cook-off! Thank you for the wonderful company and food. I loved watching everybody crowded around the tables talking. We raised $1,200 for field trips, but more importantly, grew closer as a community. Congratulations to all of the winners! We will do a family friendly out and back hike from Rattlesnake Bar on October 20th right after school, weather permitting. pizza night fundraiser for Harvest Ridge. Conveniently located in the Target shopping center right off of Sierra College, Blast 825 Pizza will donate 30% of the pizzas purchased November 2nd to our school. Details to come next week! 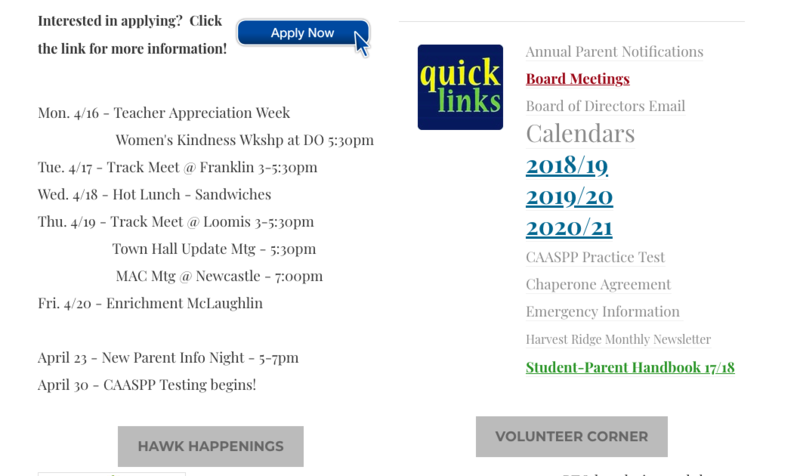 The council has been busy organizing events for this month including the Halloween Dance on October 27th for Grades 6-8 and the DO Homecoming Parade float design. This year the theme for the float will be Space Mountain. Just a reminder that all parents who are on campus during school hours and working with students, MUST have their fingerprint and TB clearance through our District. The fingerprint form is available HERE or in the school office. We LOVE having you a part of our school day, so please get fingerprinted and TB cleared and come join the fun! Come help your student's class plan, plant and grow food in their class garden box. See Sara Mattia for details or contact your student's teacher. ​Drumline start Tuesday! T/Th 2:30-3:30pm, Sign-up HERE for Fall Drumline or in the office this week. Coach Hannah Ortiz is excited to pick up the beat after school for all interested 4-8th graders. We plan to perform at the DO Homecoming Parade, the Light Parade in Auburn and at our Holiday Show. No cost this week for Drumline. Check it out FREE this week! Fall Drumline will run for 8 weeks up to Winter break. 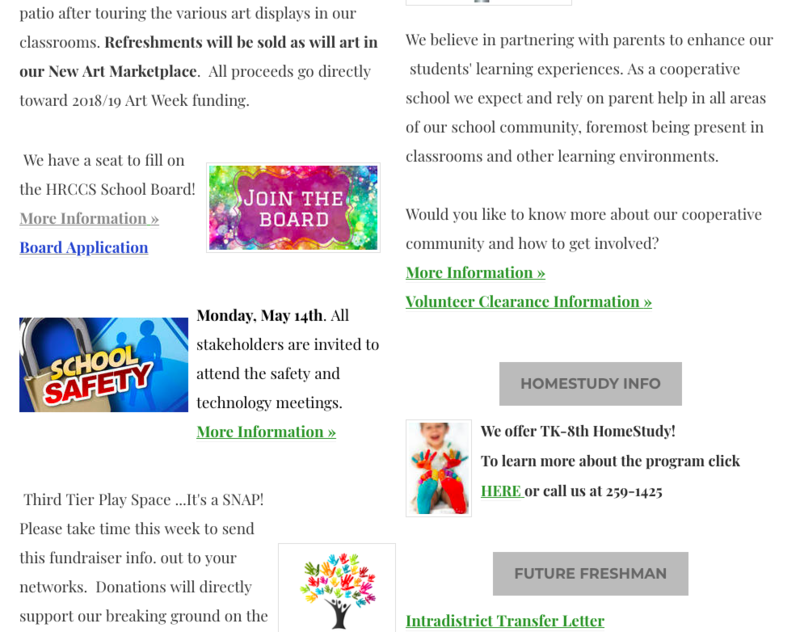 District Advisory Council members wanted! 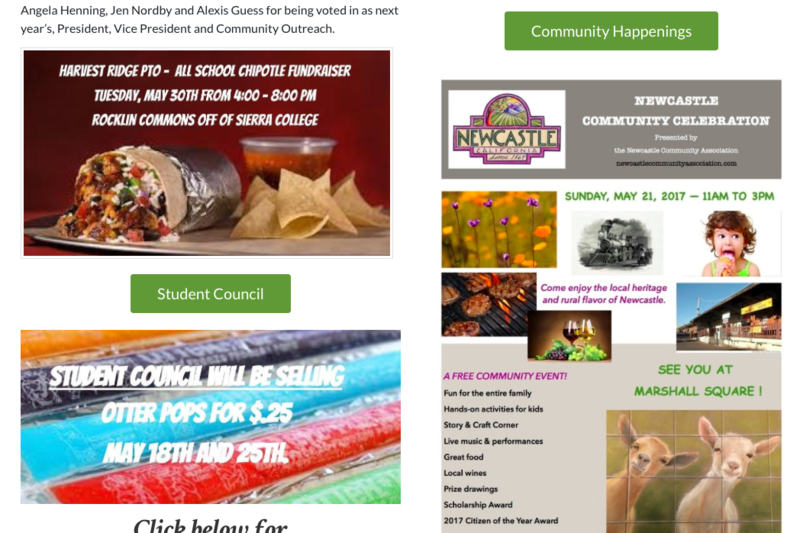 The Newcastle district is asking each school administrator to invite parents to join their advisory team. We are looking for a primary rep and an upper grade rep who would commit to attending the district meetings that happen once a month. This is a great opportunity to share with NESD our parent perspective for HRCCS and to gain perspective from the district to bring back and share out to our team. Please contact Bridget if interested. Enrichment ~ Session 3 info coming soon! Friday drop-off is at 8:30am, classes run 9:00am-12:00pm. Hand me downs still needed: Boys 4-6 Underwear, socks, shorts/pants and 6-8 underwear are needed to stock up our spare clothes drawers at school. Hot Lunch served every Thursday ~ Chicken Burrito Bowl this week. 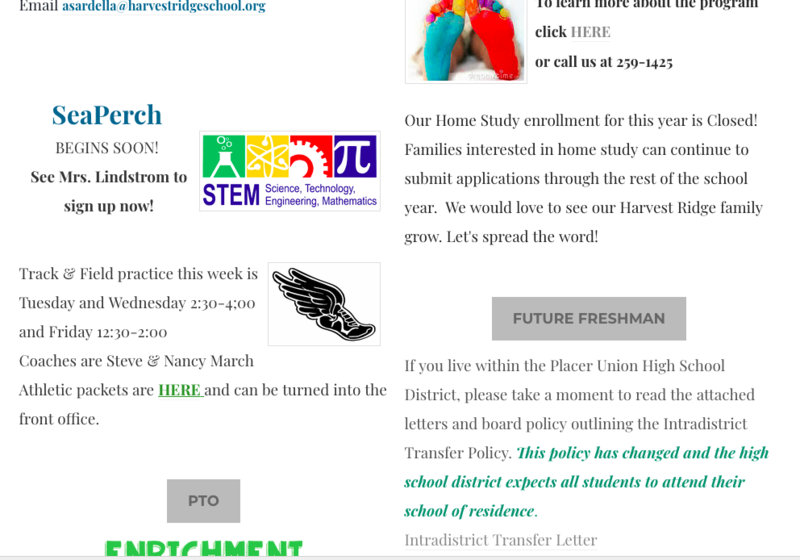 Parents at Harvest Ridge have a unique opportunity to meet with other parents and their child's teacher for occasional updates on what's happening at school. Our first daytime Learning Conference will be held Thursday, October 13th. Please mark your calendar and make a commitment to attend. Teachers rely on your attendance to share with you important information, and when you miss a conference, you miss a lot. See you there! 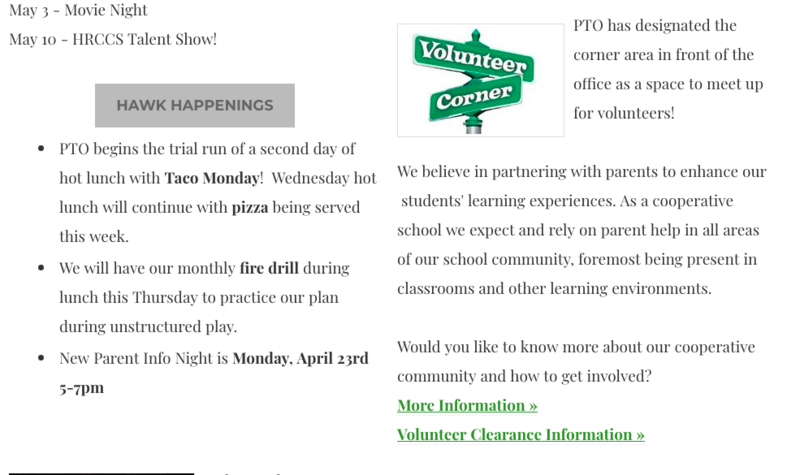 PTO DUGOUT ~ This month we will mix it up with a hike - Info coming soon! 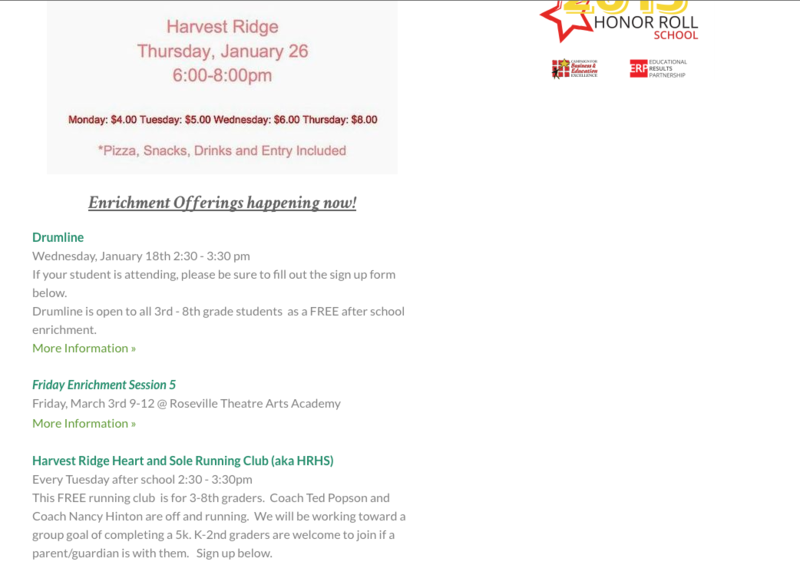 Please feel free to email me at rsilski@harvestridgeschool.org with any questions! 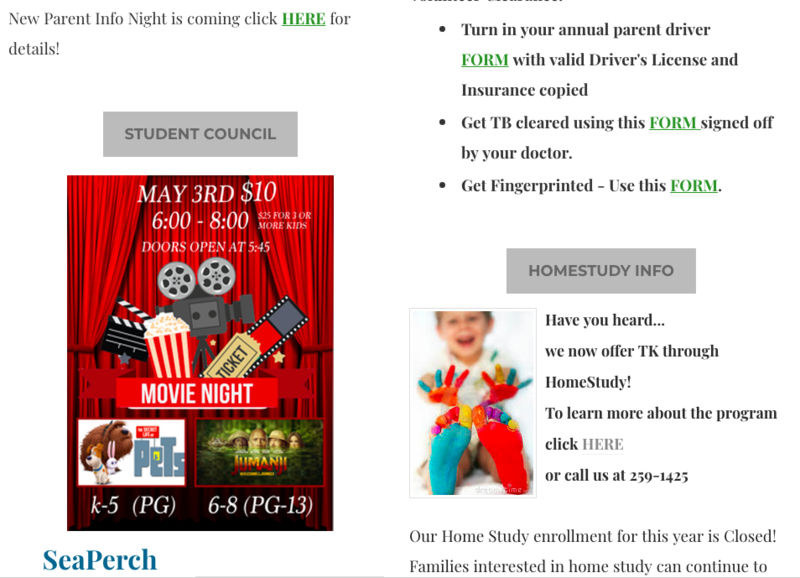 TB Clearance & Fingerprint ~ Just a reminder that all parents who are on campus during school hours and working with students, MUST have their fingerprint and TB clearance through our District. The fingerprint form is available HERE or in the school office. We LOVE having you a part of our school day, so please get fingerprinted and TB cleared and come join the fun! Come help your student's class plan, plant and grow food in their class garden box. See Sara Mattia for details or contact your student's teacher. Vermicrop has donated and delivered rich soil for our school garden and we have excess. Come pick up some free soil for your own garden! Cook-Off & Fundraiser Thursday, Oct 6th @ 5:30pm. The weather is finally turning cool making our Thursday evening gathering the perfect time to celebrate Fall at Harvest Ridge. The PTO has organized an evening for our families to enjoy a meal together right here on our playground. Be sure to enter your favorite Fall recipe in the cook-off so that we have plenty to eat while we mingle and play. Click HERE for entry form. Awards will be given! This evening meal is $5 per person or $20 per family (student and parent cooks/bakers will get free admission!) Extended family and friends are welcome to attend our event. The Giving Tree will be on display through Thursday. 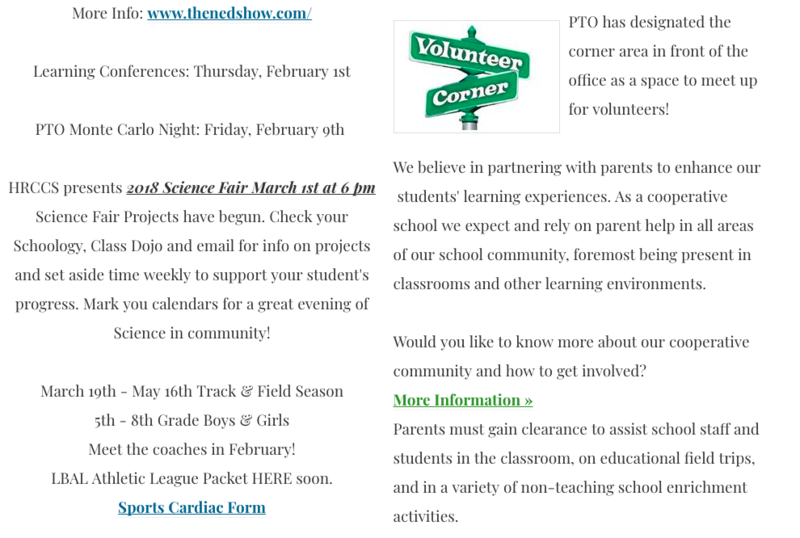 Read the PTO section below to learn more about our fundraiser. 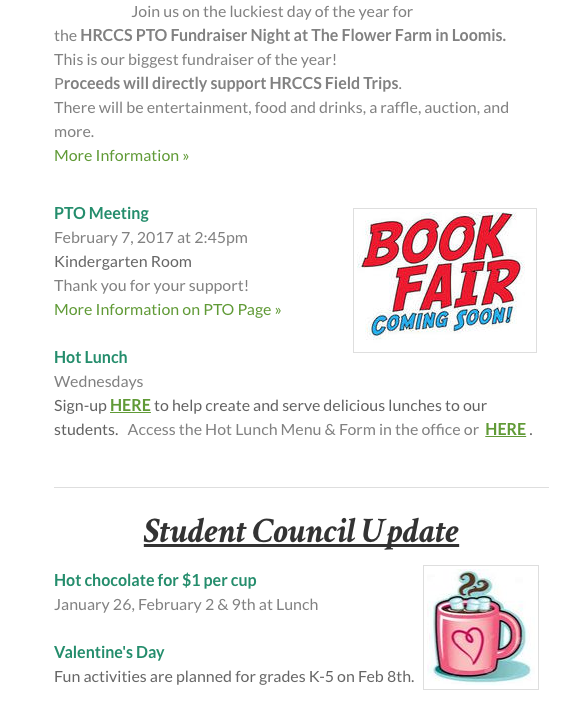 Tax-deductible donations will be collected at the cook-off or checks can be made out to HRCCS PTO in advance. 501(c) 3 Public Charity: EIN # 27-3423581. Thank you for your generosity and support of the student field trips. All proceeds Thursday go directly to lower the cost of the remaining field trips for the year! Drumline is back! 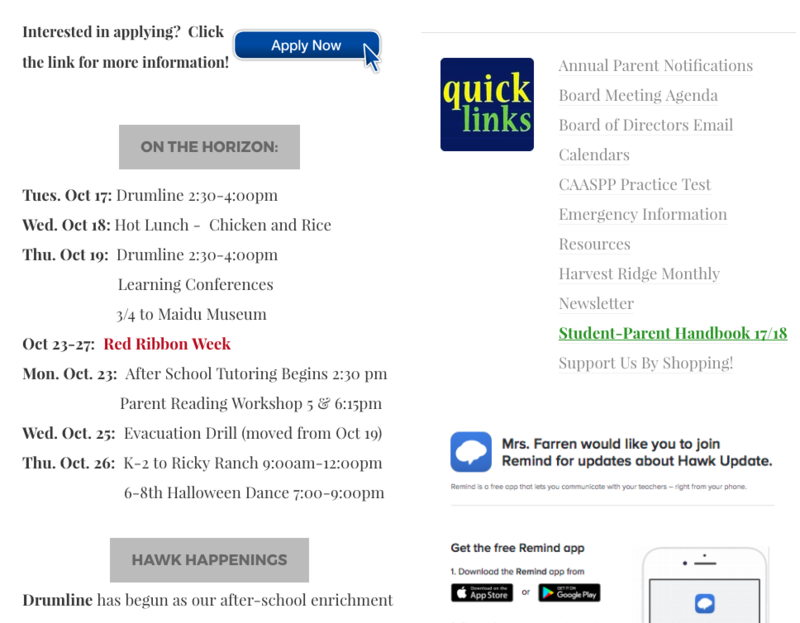 T/Th 2:30-3:30pm beginning next Tuesday, Oct 11th ~ Sign-up HERE for Fall drumline or in the office this week. Mr. Serrano has decided to step back from drumline this Fall as he builds our new upper grade math program. Have no fear Hannah Ortiz is here! Hannah was so excited when she heard we were looking for a drumline advisor. She comes to us with a wealth of band leadership experience. She was the Drum Majorette (leader of the Golden Eagle Marching Band) for Del Oro in 2015/16. Being a recent graduate and current coach for DO Band, Hannah will be sure to bring us exciting new music and ideas. If you are a 4th-8th grader and you have been a part of drumline or are looking to learn something new, now is your chance to make it happen! 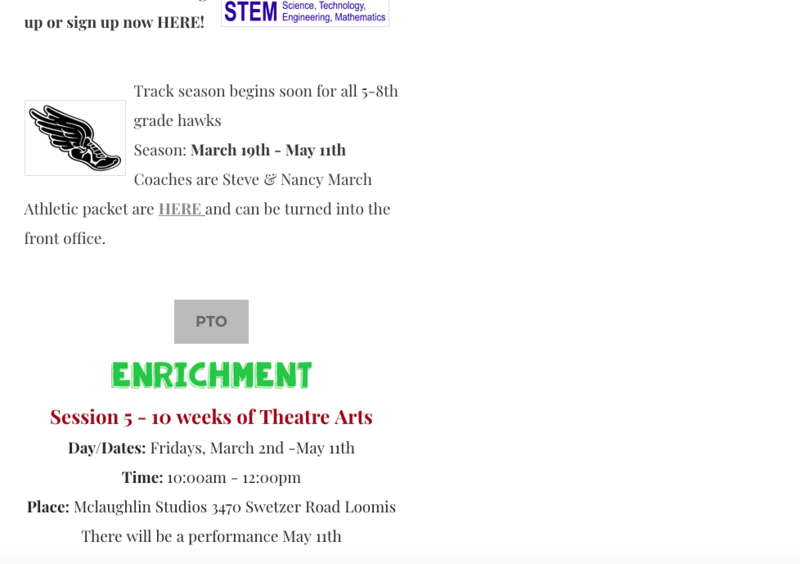 Enrichment ~ Session 2 EDMO starts on Friday! Click HERE to sign-up. Science and Technology Session (2) is Oct 7-Nov 4. EDMO is the leading vendor for computer programming, robotics and coding. Let's get on board with introducing our students to enriching learning opportunities with this high quality new vendor. K-2 Spy Maker & Science Maker Mash Up (Is full and closed) Develop your detective and spy skills by designing gadgets, dusting for fingerprints, making secret codes and hideaways. Science- matter, electricity chemical reactions, oh my! 5-8 Coding and Fab Lab Learn to create and code your own game. Build your very own game world! Fab lab- design process. Engineering design, prototype , test, update and advertise a product of their creation. Hand in your hand me downs to the office ~ We are in need of a few gently used clothing items for our spare clothes cubby. Girls size 4-6 or 6-8 underwear, socks and leggings are items we need. Boys 4-6 Underwear, socks, shorts/pants and 6-8 underwear are needed. Hot Lunch served every Thursday ~ Asian Chicken Bowl this week. Click HERE to pay online for lunches @ $3.50 each. Volunteers are always welcome. Click HERE to sign-up. Thank you to Season and the culinary crew! Hot lunch was a hit and your hard work in getting it off the ground is appreciated. Long Distance Evacuation ~Thursday, October 6th students will be participating in a long distance evacuation drill. This simulation will require you to participate too. All students will be walked up to the Newcastle United Methodist Church 410 Buena Vista Ave, Newcastleat the conclusion of their school day, and they will be picked up outside the church. Kindergarten students will be picked up at the church at 1:00pm, and students in grades 1-8 will be picked up at 2:30pm. We practice this process at least once a year so that we are prepared in case of an actual evacuation. Please click HERE to read more about our emergency/safety procedures. 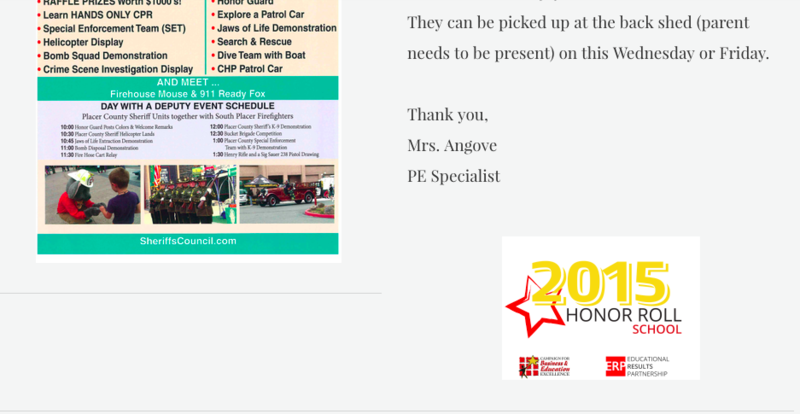 Make sure to review the maps attached to the letter on the link for pick up. We are asking parents to ENTER from Old State Highway via Taylor Road, and turn left onto Buena Vista. Please wait patiently as we check students off and load them into vehicles. You will continue on and out of the neighborhood going one way. Just a reminder that neighbors are out and about, so we need to be courteous as we wait. The church has graciously provided their parking lot for us. Please be mindful of those patrons of the church who may be arriving or leaving the parking lot during our pick up times. 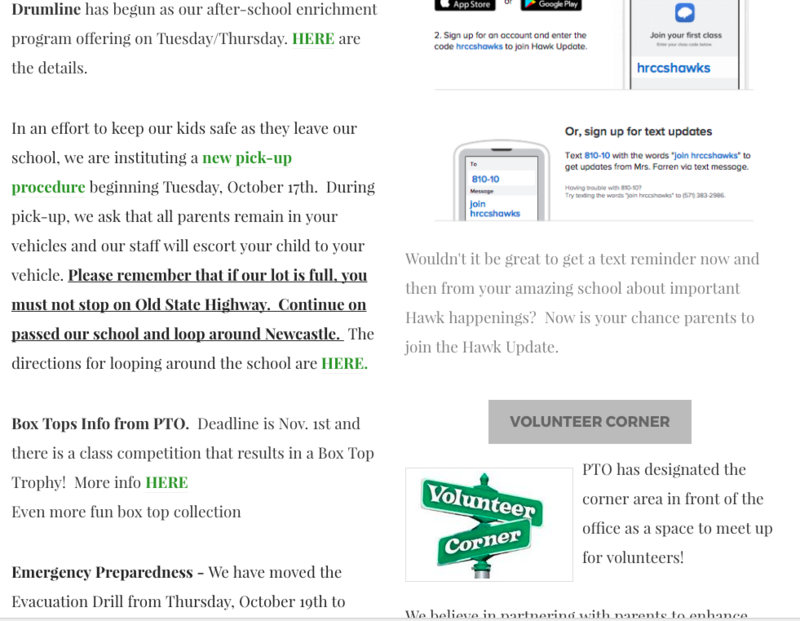 If we need to reschedule the drill due to weather, we will text and/or email you prior to pick up. PTO DUGOUT ~ The due date for entering the cook-off is on Monday, Oct 3rd. Please make sure you turn in a copy of the recipe as well. Extra entry forms are in the office. The Giving Tree is ready for donations. It is in front of the office and it will become the focal point of the fundraiser. The tree is filled with flags that have dollar amounts that will help fund this year's field trips. Our goal is to make the tree bare. If you are unable to make it to the fundraiser, you can tear off a flag and donate that dollar amount in the office. Be sure to tell grandma and grandpa about our Giving Tree and Fall Cook-Off. Volunteer Hours ~ Join us for dinner Thursday at the Flavors of Fall Cook-Off as we create a stronger community on campus! Click HERE if you would like to lend a helping hand to make the event a success. 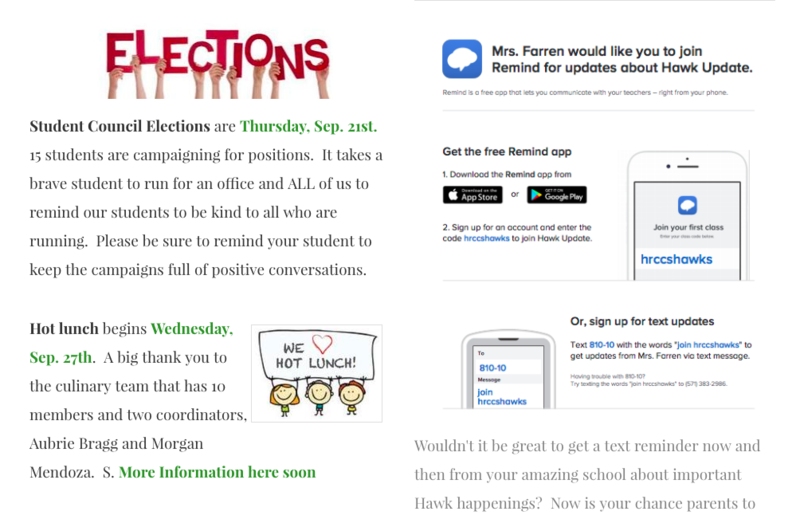 Campaign Week for Student Council~Elections Thursday, September 29th. We are excited for our week of student council candidate campaigns. Officers will be elected by the students and will work together to organize and run a variety of student events and activities throughout the school year, Leadership through student council is one way to promote school spirit and help build student involvement in our community. Be sure to cheer on all students campaigning. This is a week where many young citizens on our campus are stepping outside of their comfort zones, public speaking and growing! Cross Country Hawks Final Meet Wednesday~ Join us at H. Clarke Powers school at 3:15 to cheer on our runners in their final races this year. Runners will be dismissed at 2:15pm and will wear their jerseys to school to be recognized on Wednesday. View the Meet Schedule here. Cross Country families we will celebrate our season right after the meet at The Yogurt Shop in Loomis Raleys shopping center to hand out awards. 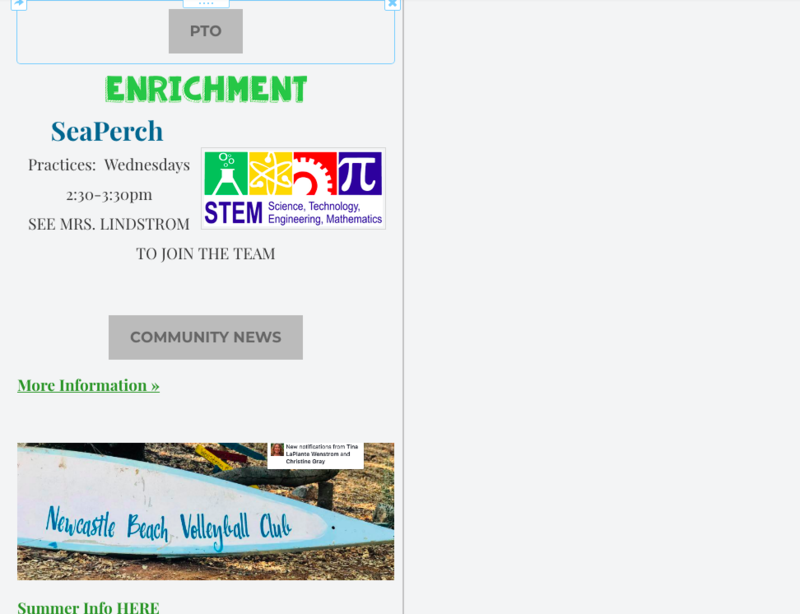 Enrichment ~ Registration for Session 2 EDMO is NOW OPEN! Click HERE to sign-up. Science and Technology Session (2) is Oct 7-Nov 4. K-2 Spy Maker & Science Maker Mash Up (Almost full!) Develop your detective and spy skills by designing gadgets, dusting for fingerprints, making secret codes and hideaways. Science- matter, electricity chemical reactions, oh my! Hot Lunch served Thursday, September 29th ~ Chicken Burrito Bowls! Lunches are $3.50 each. We encourage you to go on to the Sign-Up Genius link HERE . Volunteers still needed. Click HERE to pay online or bring in your payment by Thursday to be included in next weeks count. 7/8th reduced because of field trip absence Oct. 20th. 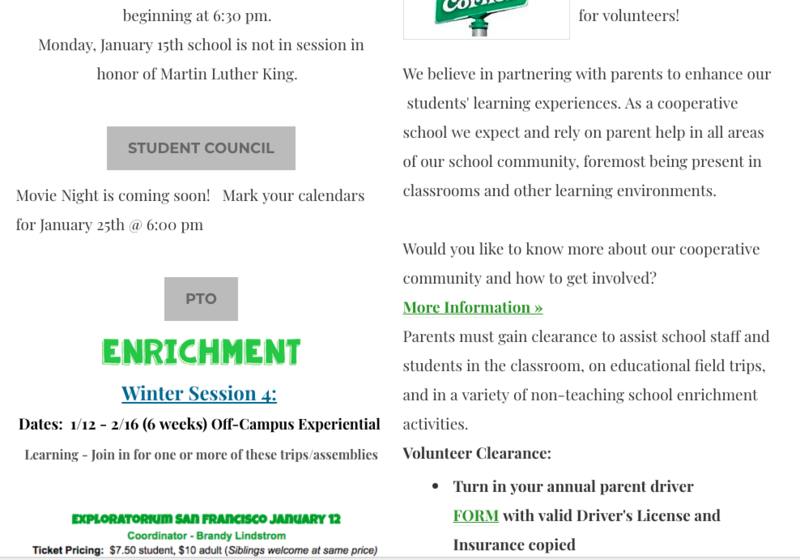 ​Parent Driver Update ~ Stop into the office this week to update your parent driver information on file. This info needs to be updated annually and field trips are just around the corner. Each trimester the classes will compete to be Box Top Champions! If you’ve been collecting Box Tops, send them in to your child’s teacher. 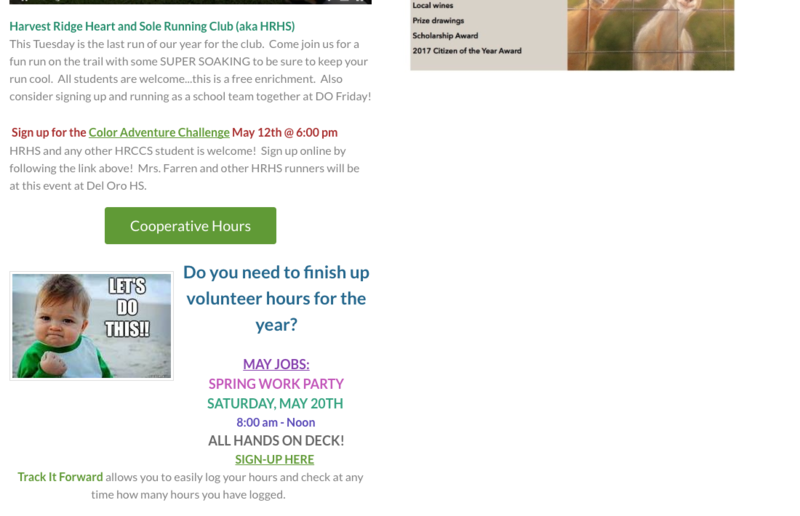 Volunteer Hours ~ Connect with our cooperative school through volunteering alongside students and staff or take on a job with another family! Click on the job below to sign up for a date and time to complete it. ​Annual School-Wide Learning Experience is this Thursday, September 22nd. The directions are embedded here at - Tahoe Treetop Adventure Park, Granlibakken. 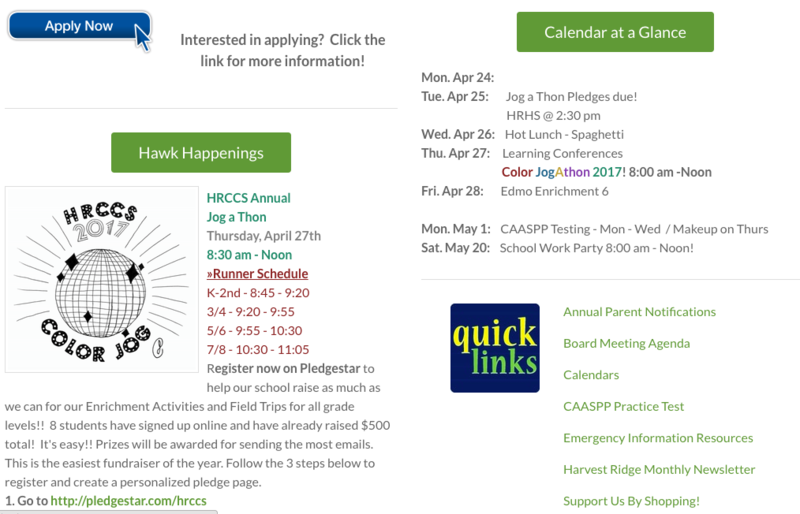 HRCCS prides itself on offering students learning opportunities beyond the classroom. Don't miss your chance to make a memory with our students. This IS day is always a HUGE day of overcoming challenges. Please join us. Grades K-2: Flying Squirrel Ropes Course and Zip Lines, 9:30-12:30. Bring a sack lunch. K-2 will be finished at 1:00. $25/student, $25 limited adult spots. Grades 3-8: Team building activities from 9:30-12:00, ropes course from 12:30-3:30pm. Students may choose from Flying Squirrel or Monkey Course, but must be over 56 inches tall for the Monkey Course. Adults may participate in the ropes course. $40/student and $50/adult. *This is a parent sponsored field trip. Please make your own car arrangements. Bring a sack lunch, wear comfortable layered clothing, tennis shoes, and sunscreen. Bring gloves, hats and jackets too! If your student is not attending the ropes course, please check in with his/her teacher for Independent Study for the day. Click HERE for release form. Please turn in payment with form by 9/19 to the PTO file located in the office. 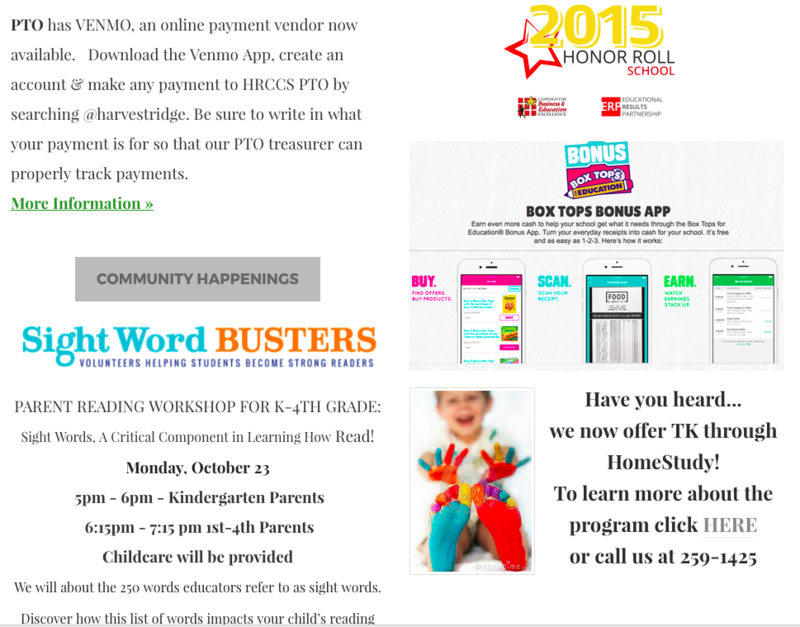 Make checks payable to HRCCS PTO. Cross Country Hawks 2 more weeks ~ This week the meet is at Loomis Basin Charter School and students will leave at 2:10. View the Meet Schedule here. K-2 Spy Maker & Science Maker Mash Up Develop your detective and spy skills by designing gadgets, dusting for fingerprints, making secret codes and hideaways. Science- matter, electricity chemical reactions, oh my! Hot Lunch ~The Culinary Team has assembled. 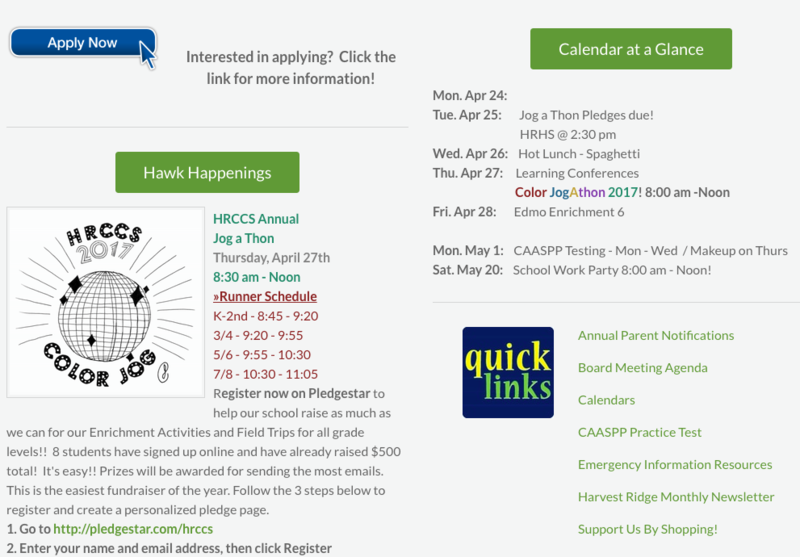 We encourage you to go on to the Sign-Up Genius link HERE and take a look at the spots that are still needed to make HOT LUNCH happen. Hot Lunch is starting Thursday, September 29th with a chicken burrito rice bowl. Yum! The first set of hot lunches is a flat fee of $21(6 lunches @$3.50). We are asking for a 6 meal buy in to streamline this process for the small team of volunteers that have taken on serving for our all school hot lunch program. Click HERE to pay online or bring in your payment by 9/21. 7/8th reduced to $18.50 for field trip absence Oct. 20th. This is a family friendly event. Come unwind and eat dinner! 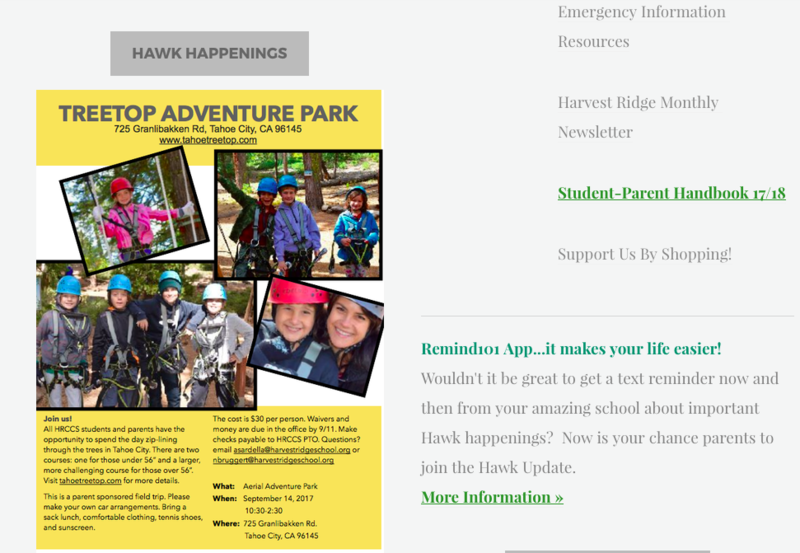 ​Annual School-Wide Learning Experience is Thursday, September 22nd at Tahoe Treetop Adventure Park, Granlibakken. Don't miss this opportunity for experiential growth with your student. A day of simulated challenges is a powerful way to teach our kids to persevere when something is tough or scary. The park is comprised of a series of courses linking tree platform to tree platform with a variety of bridges and zip lines suitable for 5+ and all levels of athleticism. Grades K-2: Flying Squirrel Ropes Course and Zip Lines, 9:30-12:30. Bring a sack lunch. K-2 will be finished at 1:00. $25/student, $25 limited adult spots. Grades 3-8: Team building activities from 9:30-12:00, ropes course from 12:30-3:30pm. Students may choose from Flying Squirrel or Monkey Course, but must be over 56 inches tall for the Monkey Course. Adults may participate in the ropes course. $40/student and $50/adult. *This is a parent sponsored field trip. Please make your own car arrangements. Bring a sack lunch, wear comfortable clothing, tennis shoes, and sunscreen. Questions? Contact Bridget Farren. If your student is not attending the ropes course, please let your teacher know so that your child receives their Independent Study for the day. Click HERE for release form. 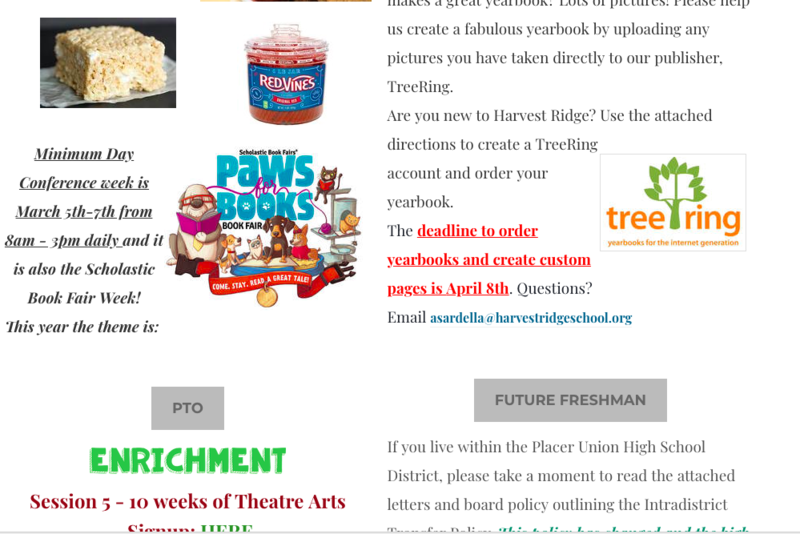 Please turn in payment with form by 9/18 to the PTO file located in the office. 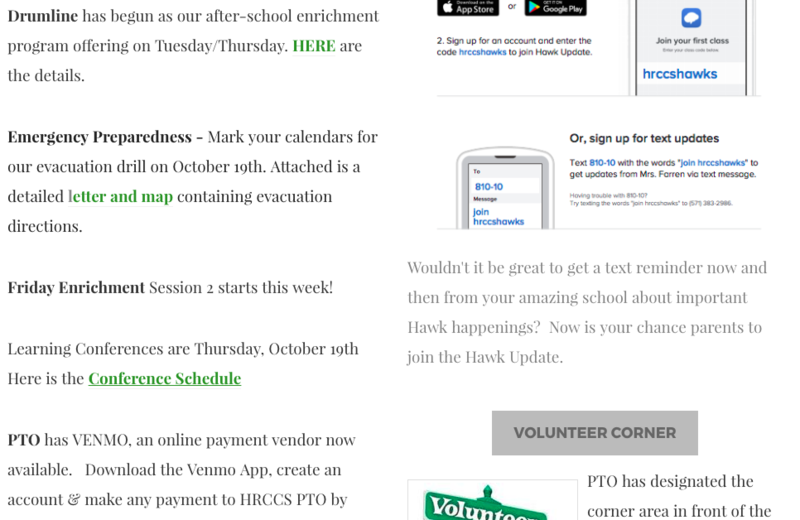 Make checks payable to HRCCS PTO. 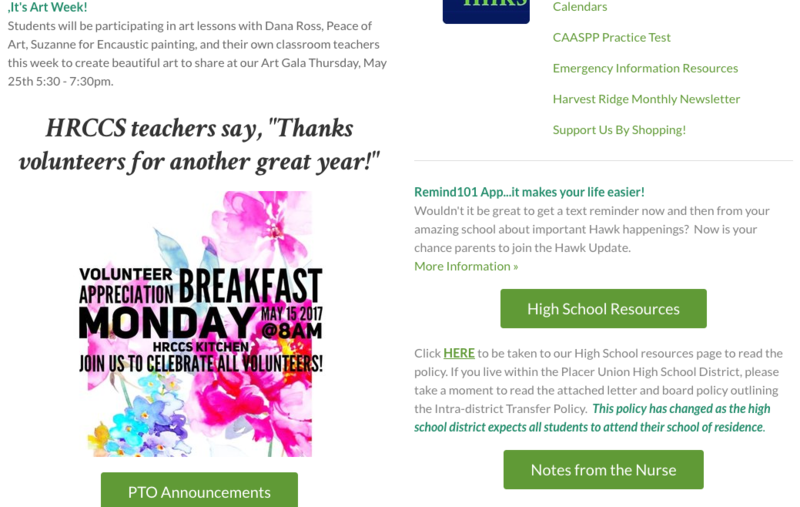 CAASP Results are in and we made the Auburn Journal ~ Click HERE to read the article. 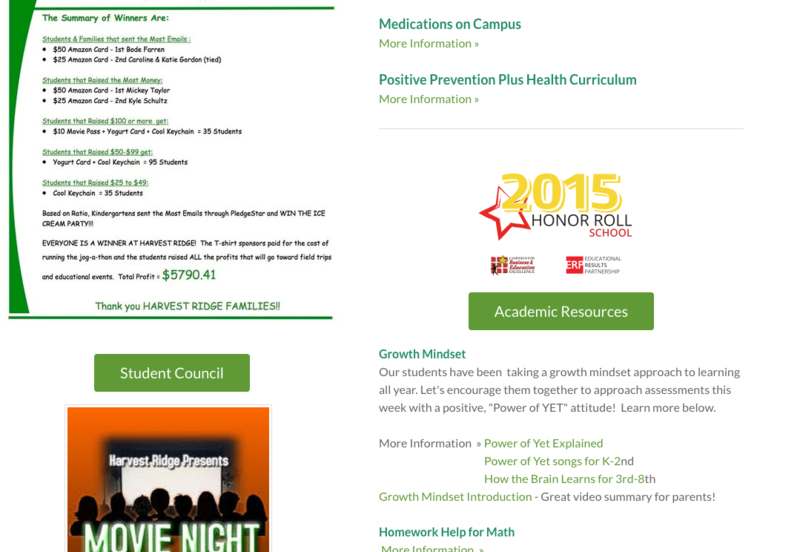 Harvest Ridge had a significant increase in our ELA and Math scores from last year. Cross Country Hawks are on the run ~ Practices are Mondays and Thursdays from 2:45pm-3:45pm & Tuesdays 7:30am-8:00am. The meet this week is at Newcastle School. Students will walk with coach to the meet. It is not too late to join our team. Pick up a packet in the office today. To view the LBAL Cross Country Rules click HERE. View the Meet Schedule here. First priority goes to enrichment 1 enrollment students. 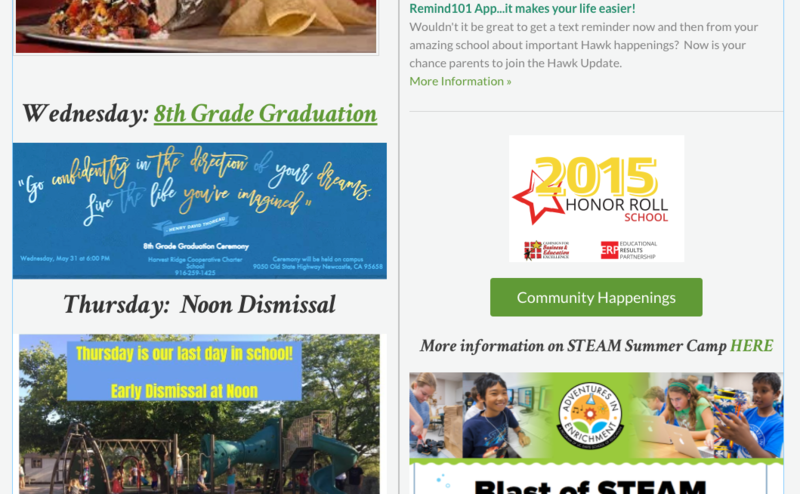 Growth Mindset & Hawk Wings~ Last Thursday's Hawk Wings Assembly was a hit! We learned about growing from mistakes and challenges. Click HERE to review our assembly slideshow and to watch the embedded videos. Thank you to the 7/8th grade class for helping with the skit for this assembly and a shout out to the team of Big Kids who created the parking lot safety video presented to parents at Back To School Night. 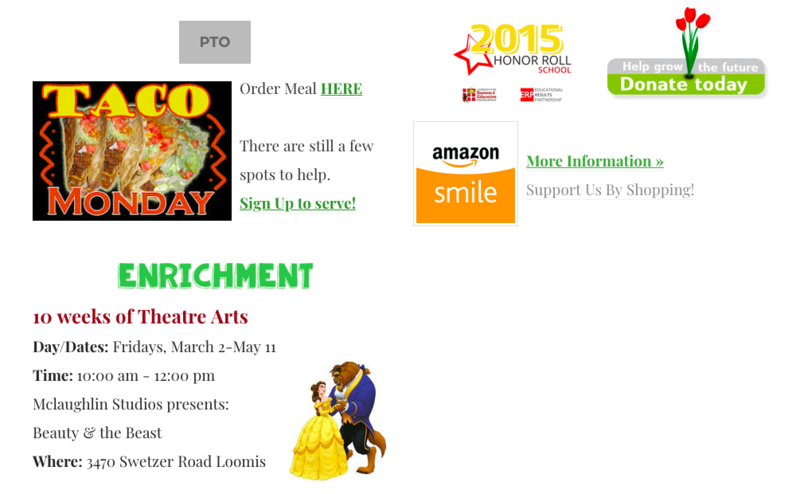 Hot Lunch ~ Is almost ready to launch for another year. It has been moved to Thursdays! We have a few parents organizing meals beginning Thursday, Sept 29-Nov 3 (Trimester 1) and they are looking for volunteers to round out the hot lunch serving crew. Join the Culinary Team by clicking HERE. Lunches will be $3.50, a link is coming soon to Paypal. Let's make Thursday lunches special for our kids! PTO DUGOUT ~Thank you for the great turnout at our first PTO meeting! There were a lot of great ideas generated and we approved a budget so we can start to make things happen. 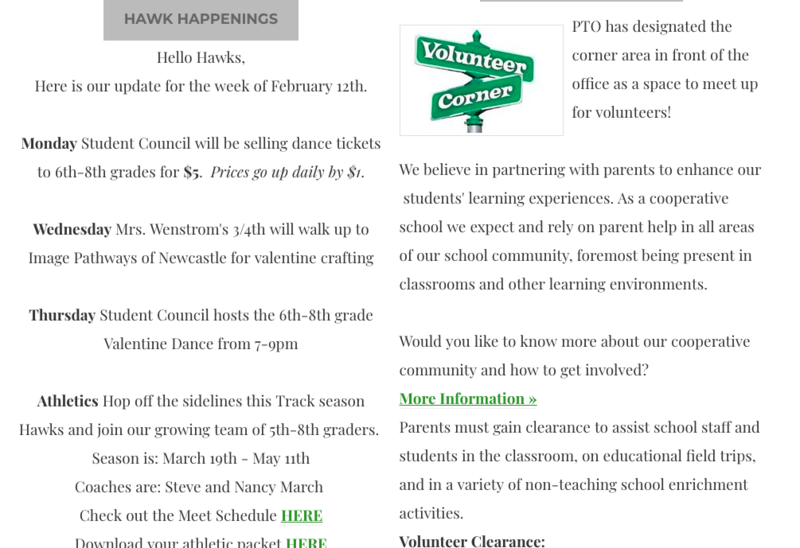 It was decided to go with the conservative budget and have a Fall Fundraiser dedicated to field trips. So, on October 6th at 5:30 there will be a Flavors of Fall cooking competition with the following categories: soup, dessert, and pumpkin. Stay tuned for more details. Head over to NCP after drop-off for some adult conversation. Hot lunch has been moved to Thursdays and is $3.50. Sign-ups to come! School Safety ~ Wednesday, September 14 we will conduct our first fire drill. This will take approximately ten minutes and all students will remain on campus. A long distance evacuation drill will be conducted later in our school year. We are very excited for our first day of class Monday, August 29th. Arrival and Dismissal ~ In order to insure the safety of our students and our neighborhood community, we ask that you adhere to the following guidelines when dropping off and picking up students. Students are to arrive with time to put their backpacks and personal belongings away before classes begin promptly at 8:15 am. Students should not be dropped off prior to 8:00 am. ​Only use the curbside lane to drop students. If your student is not quite ready, please continue around the circle, so as to avoid a long delay at the curb. Upon arrival, students will walk to the playground by using the sidewalk. They should not enter the classrooms or go through the office. Follow our fun, red carpet tomorrow! Students should hang their backpacks on a hook outside classrooms before playing. When the whistle blows twice, everyone FREEZES and looks at the yard duty who will pause and give instruction. When the whistle blows one more time, student will walk to their lines, and wait. A morning greeting and the Pledge of Allegiance will follow. Teachers will lead students into their classrooms. Students who arrive after the 8:15 am starting time will need to check in at the office to receive a tardy slip before moving on to class. At 1:00 pm and 2:30 pm, students will be brought to the parking lot curb for pick-up. Use BOTH traffic lanes to drive in and wait for your child. If you are not able to enter the parking lot, do not sit and wait on Old State Highway. CIRCLE AROUND through the neighborhood to allow time for vehicles to exit. The Highway Patrol will ticket vehicles obstructing the flow of traffic on Old State Hwy. Pull ALL THE WAY FORWARD - please do not leave big spaces between vehicles. DO NOT leave your vehicle unless you are parked in a designated parking spot. When loading your child, please load quickly without leaving your vehicle if possible. If you or your child needs to speak with your child’s teacher, the office, or another parent, please park in a designated parking spot. Wait to speak with school personnel until pick up process is finished. Staff is focused on safely loading students at this time and will be available AFTER students are cleared from the school. When exiting the parking lot, STOP at the parking lot exit stop sign before proceeding onto Old State Highway. Classroom Supply Lists ~ Click on the class below to access lists of supplies. Cross Country ~ Hawks Let's Run! 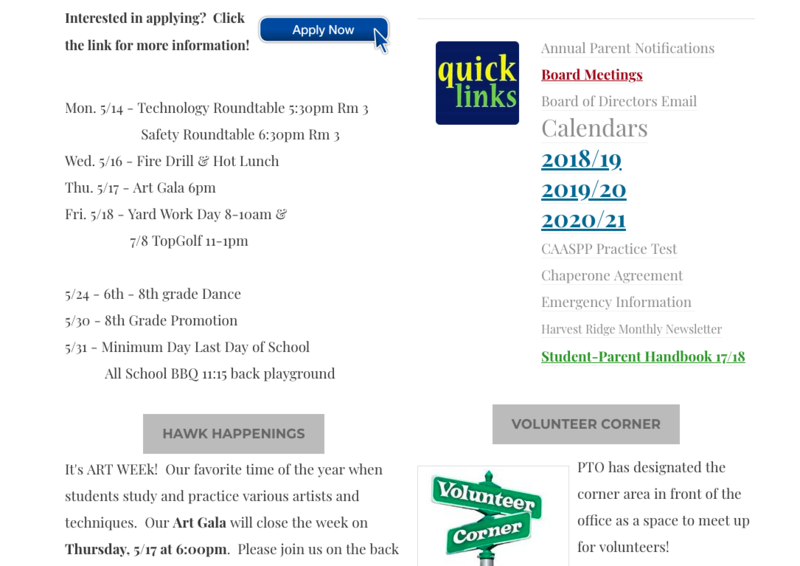 All Harvest Ridge Hawks 4th-8th grade have been invited to participate again this year in the Loomis Basin Athletic League for Cross Country Season (Aug 30-Sep 28). Practices will be held after school on Mondays and Thursdays from 2:45pm-3:45pm (mandatory) with a morning optional training session on Tuesdays 7:30am-8:00am. The first team meeting will be Tuesday, August 30th from 2:35pm-3:00pm and we will not be running. Gather on the back patio near the 5/6th picnic table. 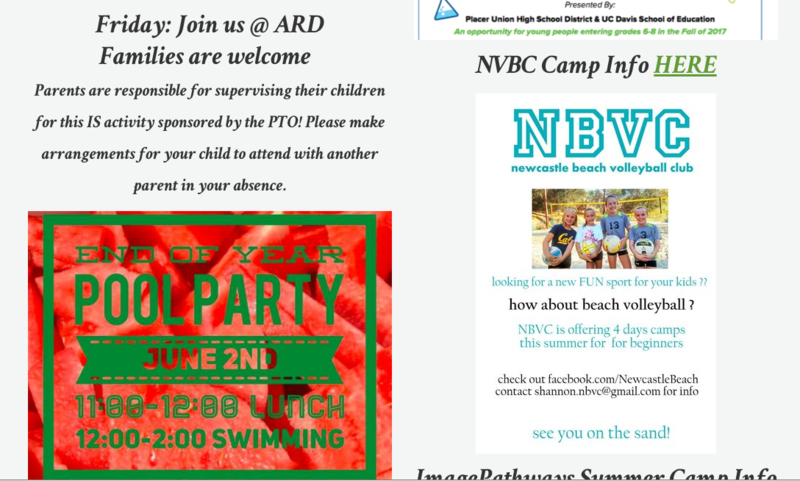 Parents are encouraged to attend for details about the season and transportation. Our team will be coached by Rebecca Krezman and the morning training runs will be supervised by, Nancy Hinton. We are looking for an additional team volunteer on Tuesday mornings and another 1 or 2 for afternoon practices. The first league meet/time trial is Wednesday, August 31st and we will allow those who have turned in their participation packet to run in that meet. Please wear your yellow cross country jersey for this meet that you purchased last year (or borrow one from a friend). Return all black jerseys that were purchased last year by the school for our athletics teams. If you are new to our team or without a yellow or black jersey, we will have one for you to borrow. If you are not running or have a yellow jersey that is too small, please consider loaning or donating it. Jerseys can be dropped to the front office or to Coach Krezman. Please take a few more minutes to fill out the form attached to give the coach your details. You should also view the LBAL Cross Country Rules HERE. And don't forget to print out the Meet Schedule for this year! 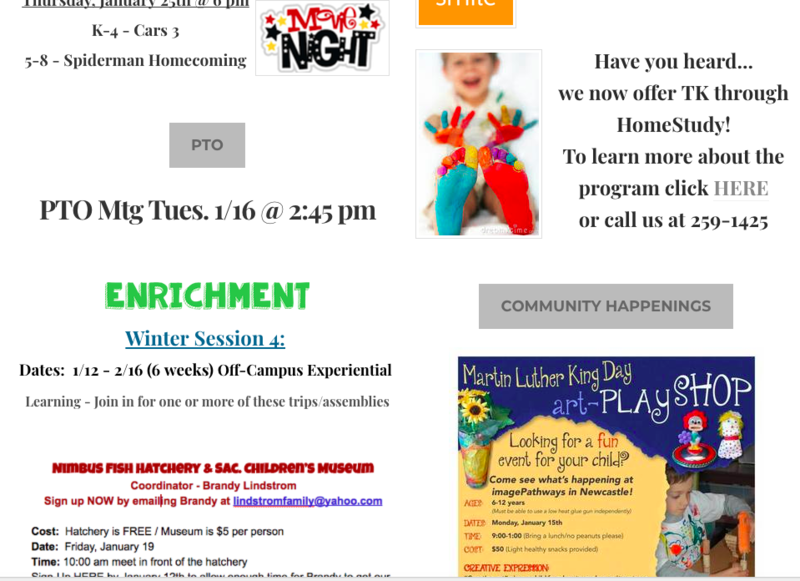 Enrichment ~ A special thank you to parent, Mistie Van Nort, who has created a wonderful Enrichment Calendar for our students this year. The first session begins Friday, September 9th (drop-off at 8:30am, classes run 9:00am-Noon). Session 1 is four Fridays filled with music and art and the cost is $80. 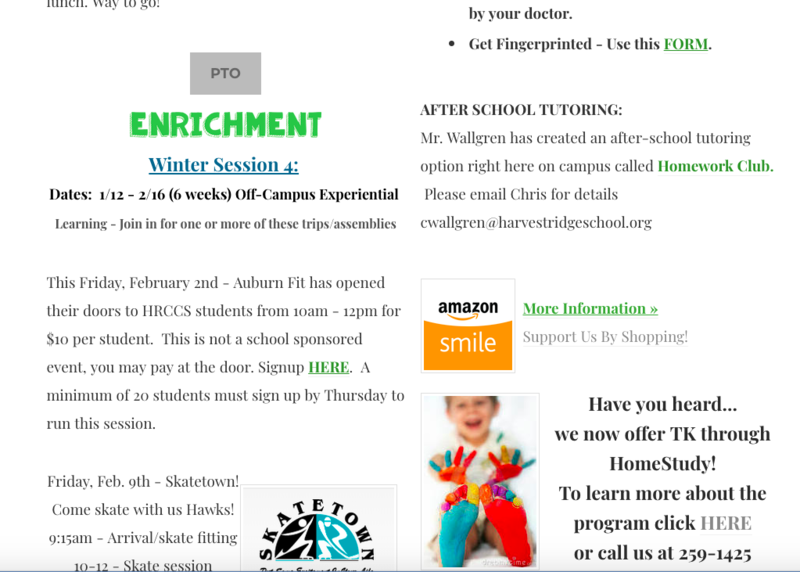 Click HERE to print out the enrichment registration and turn it in with your payment at the front desk. 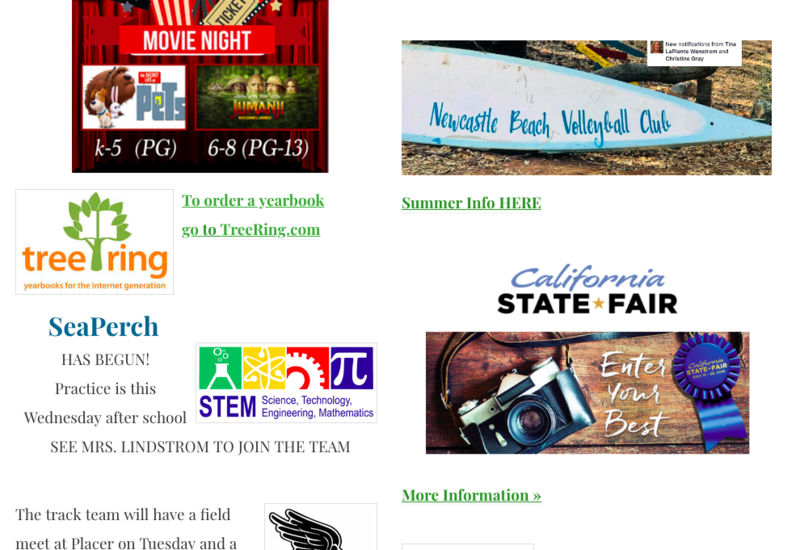 Pay Pal Registration is ready to go on the Enrichment page! 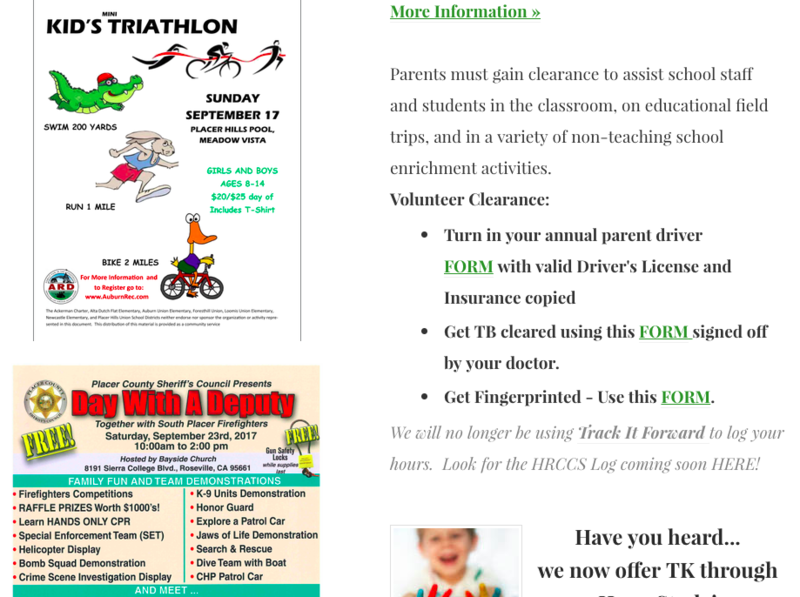 Fingerprint & TB Clearance ~ Just a reminder that all parents who are on campus during school hours and working with students, MUST have their fingerprint and TB clearance through our District. Other districts or activities that require these clearances are not kept in a shared database, and so you will need to do this through us. 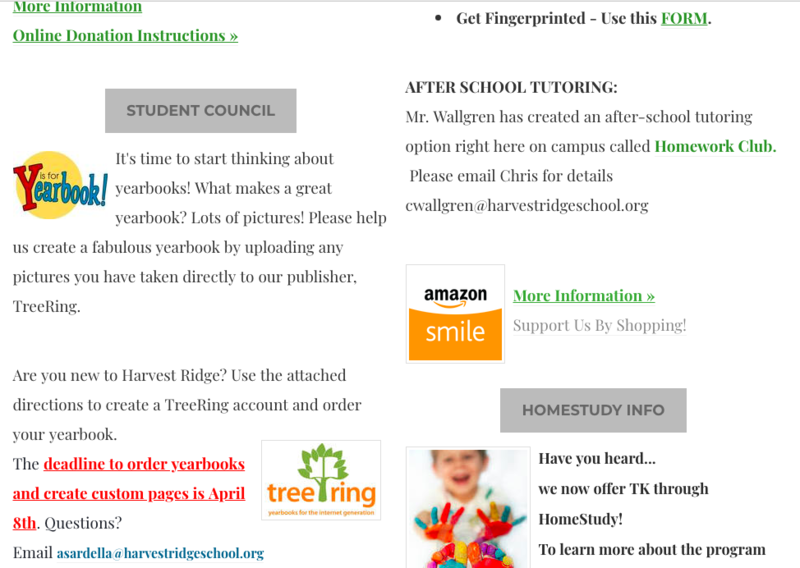 The fingerprint form is available HERE or in the school office. Fingerprint clearance is good for 7 years, so if you've already done this with us, you do not need to repeat at this time. We LOVE having you a part of our school day, so please get fingerprinted and TB cleared and come join the fun! 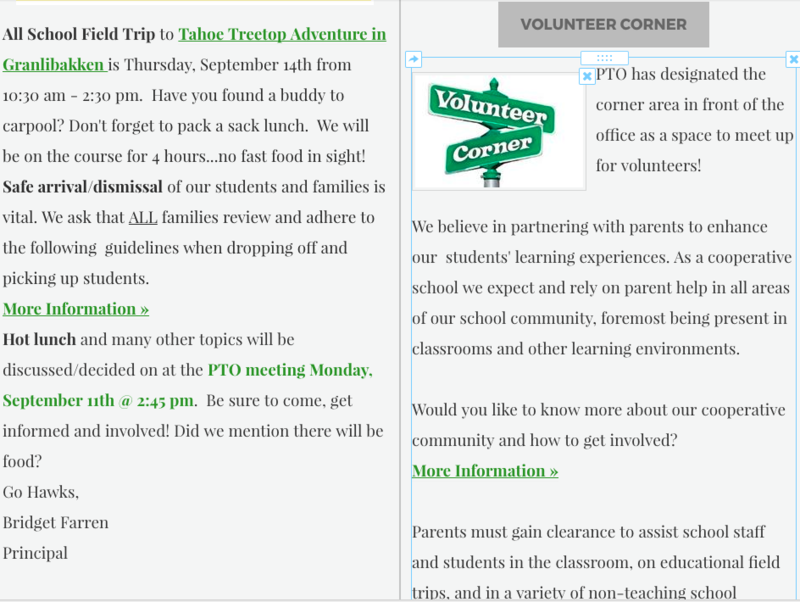 Parent Teacher Organization ~ PTO has loaded the bases with their TEAM theme this year and they don’t want you to miss a thing, so mark your calendar to be at the first PTO meeting, Tuesday, September 6th from 2:45-3:45pm (childcare is provided). Committee sign up sheets are located on the table outside the front office. The green committees are up to bat and need to be formed ASAP to ensure our Fall events and fundraisers are in place as planned. 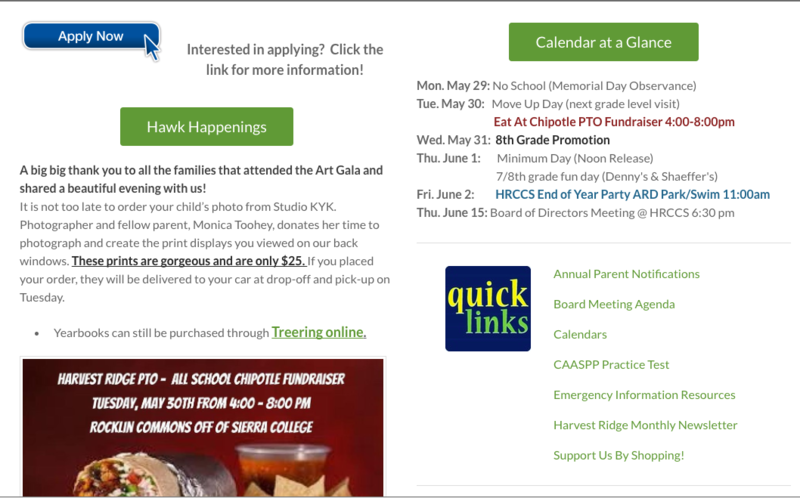 With your support of and participation in the PTO, we are able to help fund many educational experiences including field trips and art week. 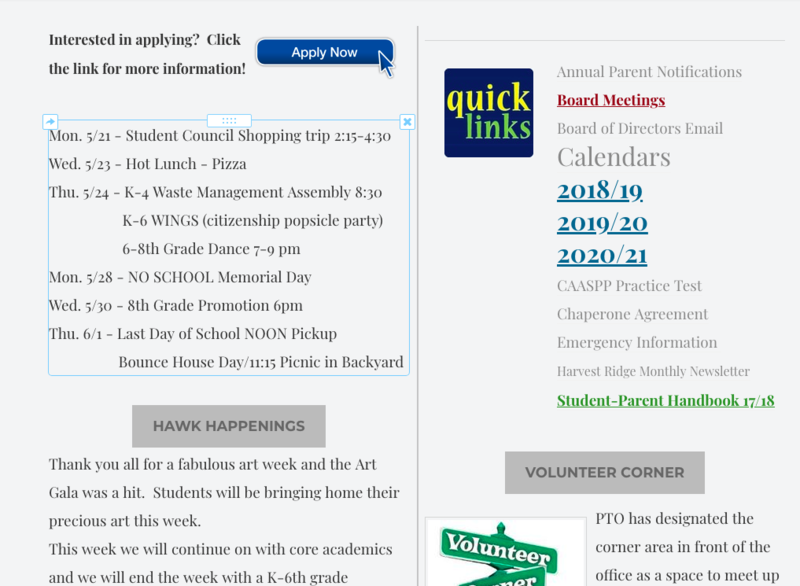 Other costs that are offset by the funds raised by PTO include, hot lunch, teacher appreciation, the Thanksgiving feast and the end of year picnic. 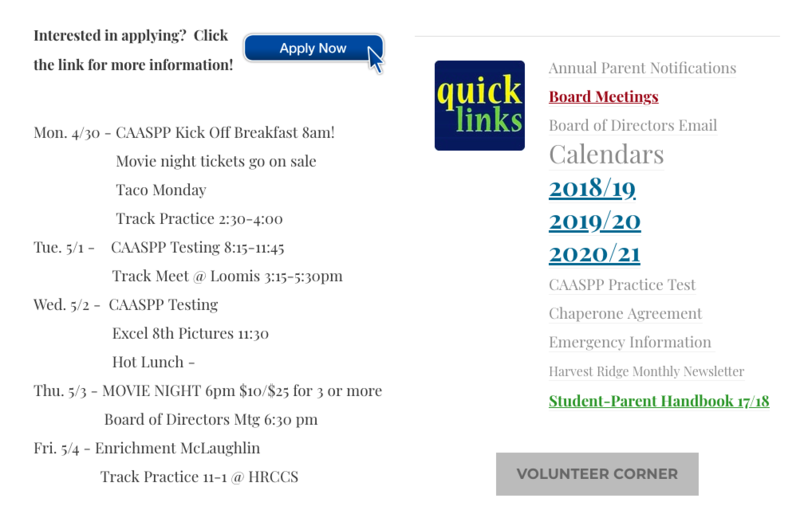 School Nurse ~ If your child requires emergency medication (Epi-pen, inhaler, etc. ), please be sure to call the office to set up an appointment to see the school nurse, Jennifer Muller. Just a reminder that if you have an incoming kindergartener, new student or seventh grader and you have not provided a shot record to the school, please bring it in this week. Thanks! 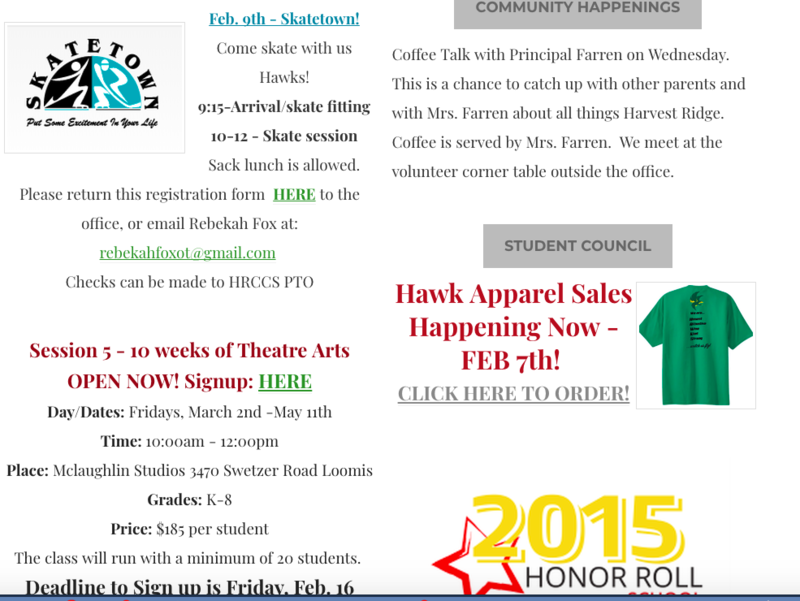 Student Council ~ School apparel provided by student council, will continue to be sold outside the office this week. T-shirts are $15, bumper stickers are $5 and clearance shirts are $10. Don't wait for the next work party. Come and lend a hand today! We are so excited to see you Monday, August 29th at 8:15am ~ We were so glad to see you all at Orientation last week. Our goals for the day were to welcome families back to school, to connect you deeper to the various educational experiences planned for the year, and to reaffirm the integral role you play in contributing to the learning environment at our cooperative school. Fall Assessment Schedule ~ Assessments continue this week, August 22nd-24th. Please sign up for an assessment time for your child(ren) using Sign Up Genius by clicking HERE. All students will be coming in to meet with their teacher prior to site classes starting on August 29th at 8:15am (new start time). 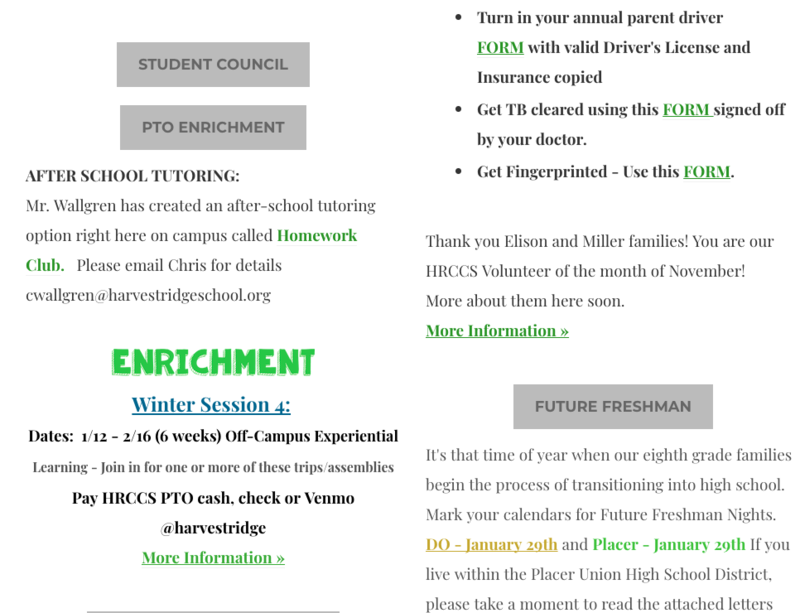 ​Enrichment ~ A special thank you to parent, Mistie Van Nort, who has created a wonderful Enrichment Calendar for our students this year. The first session begins Friday, September 9th (drop-off at 8:30am, classes run 9:00am-Noon). The first session will run for four weeks and the cost is $80. 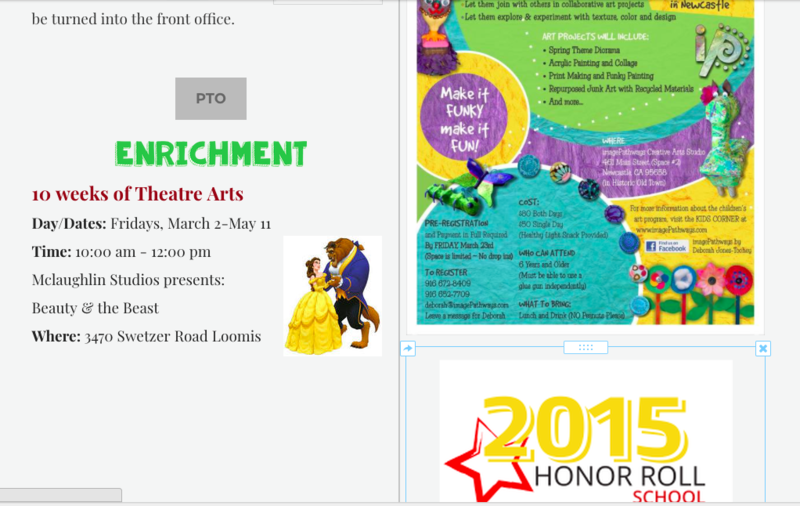 Click HERE to print out the enrichment registration and turn it in with your payment at the front desk. 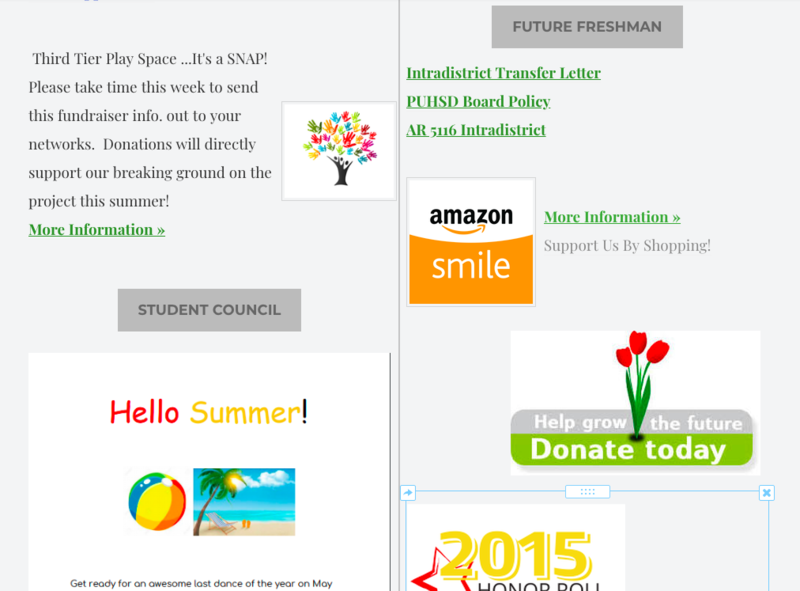 Pay Pal Registration is coming soon! 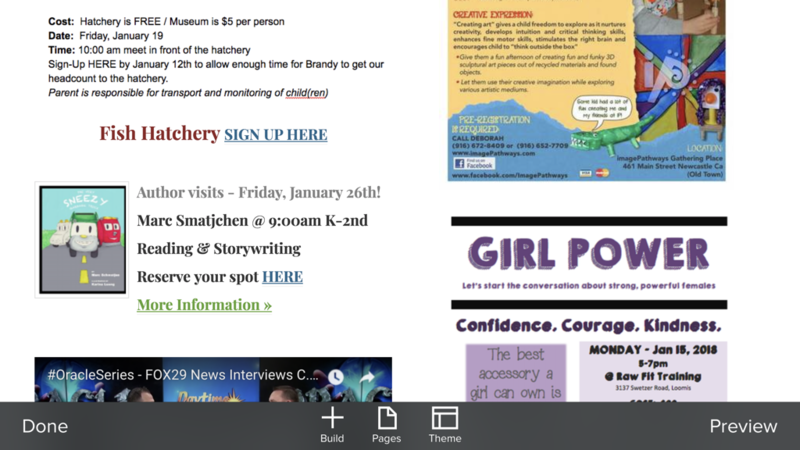 Independent Study ~ All students should be working on their independent study projects including the reading and activities from the One Author One School project. The reveal of our author, Roald Dahl, was very exciting. We are grateful for the beautiful illustrations of Dahl characters on the ball wall, painted by enrichment art teacher, Dana Ross and 1st/2nd grade teacher, Tina Wenstrom. 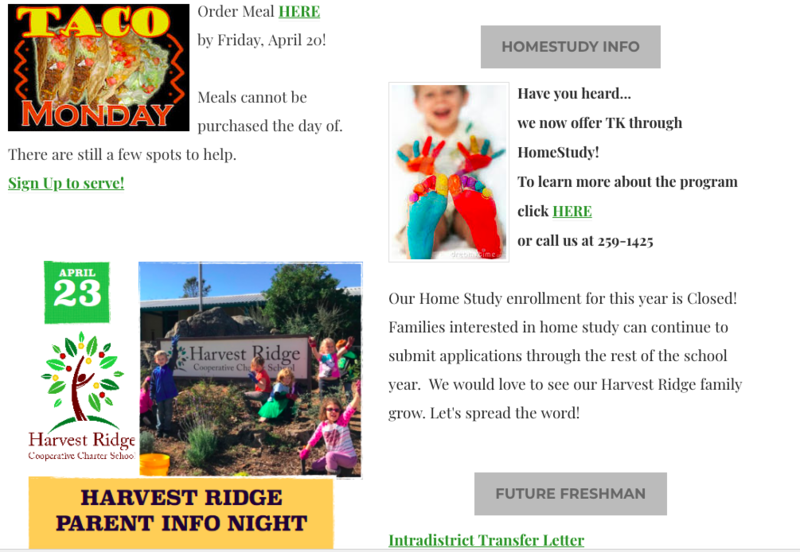 Hello Families and welcome back to Harvest Ridge ~ This year promises to be another amazing time of learning filled with adventure and connections. We are looking forward to meeting our new students and seeing our returning students and families at Orientation Day. New Start Time for School ~ This coming school year, in order to maximize the morning learning time with your students, we will begin a few minutes earlier at 8:15am. Orientation ~ Wednesday, August 17th, is our first day of school and mandatory orientation day. Parents and students will be signing Master Agreements and picking up Independent Study for the first week and a half of school. The gate (located on the East side of our school) will open for meet and greet time on the back playground followed by an all school welcome and the reveal of the author chosen for the One Author One School Independent Study. 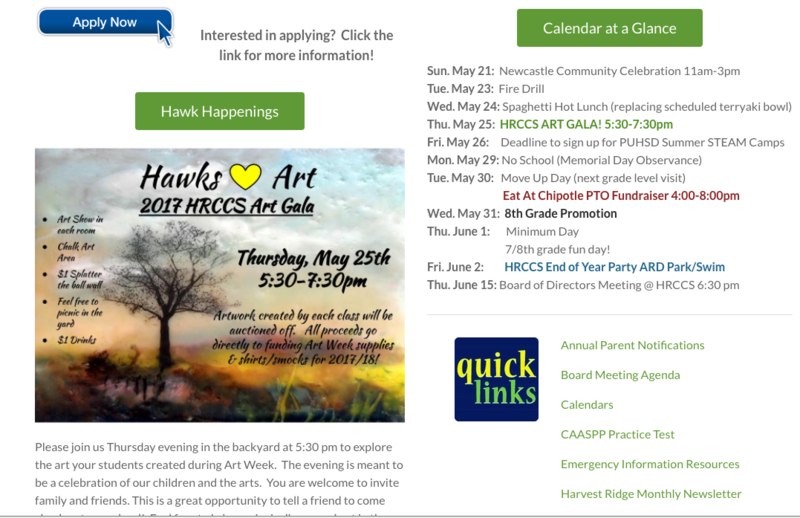 Our new Orientation format will include classroom time with your teacher, playground time, and an introduction to who we are and what we do at Harvest Ridge Cooperative Charter School. We will offer two sessions of classroom introduction time for families with multiple students. 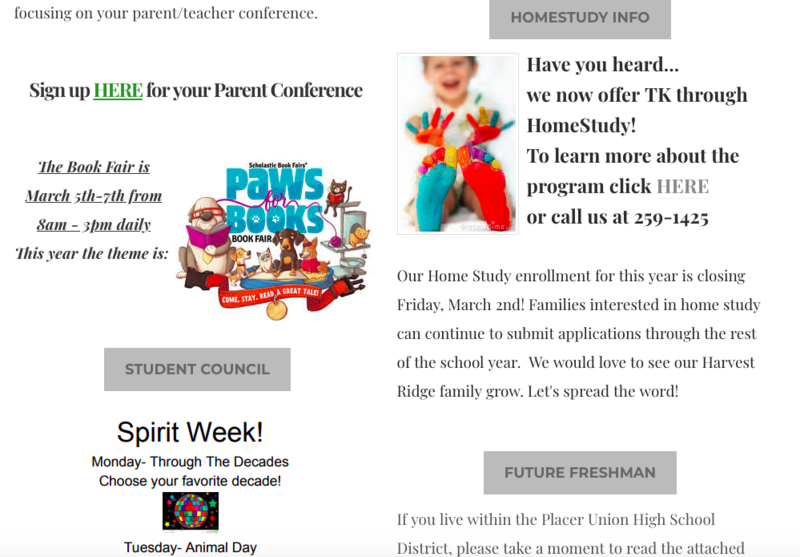 If you do not need to attend a second session, this is a great opportunity for you to visit some of the booths we will have set up this year with parent resources about Enrichment, Student Council and PTO. We look forward to kicking off our new school year with a full program on Orientation morning. It will be a HOT day, we promise to make the send off quick! 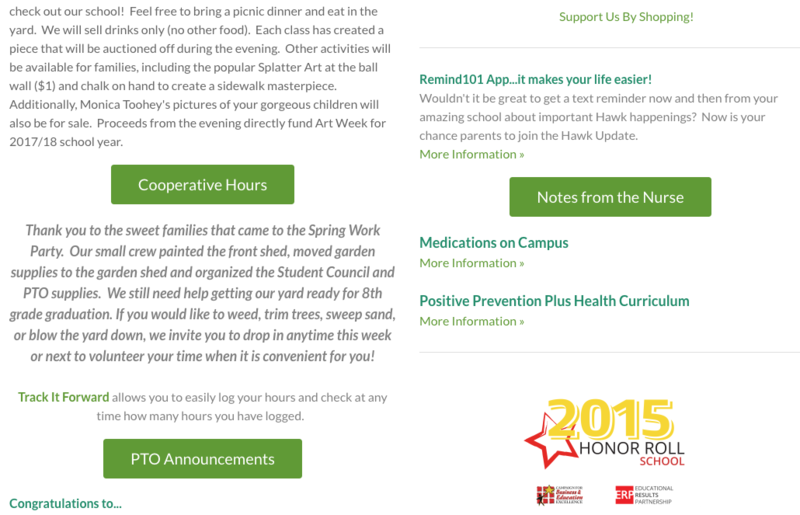 New Students and Families ~ We want to take time to celebrate you and pause to answer any of your questions. Our staff will meet you on the Kindergarten playground following the All School Send Off for a popsicle social. 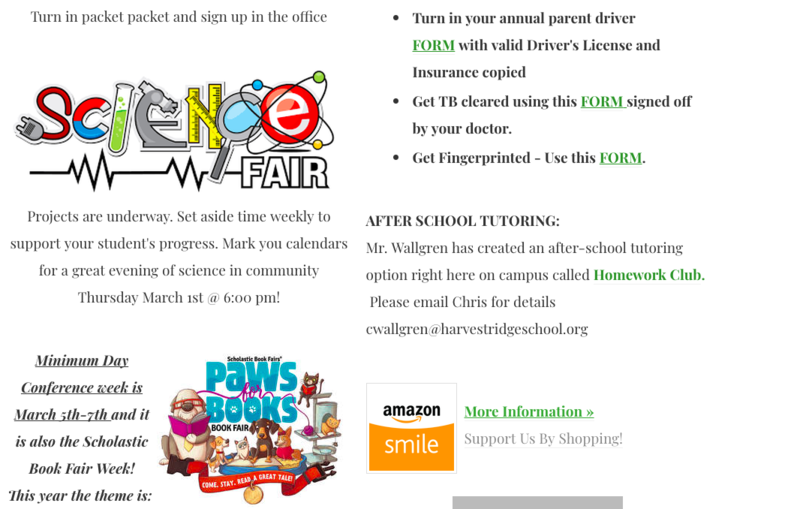 Fingerprint & TB Clearance ~ Just a reminder that all parents who are on campus during school hours and working with students, MUST have their fingerprint and TB clearance through our District. Our school nurse, Jennifer Muller, will offer TB clearance during orientation day and Capital Live Scan will also be on campus for fingerprinting from 12:00 to 1:00pm. Other districts or activities that require these clearances are not kept in a shared database, and so you will need to do this through us. The fingerprinting fee is $50.00 can be paid with cash or check. We also have our fingerprint form available HERE or in the school office if you'd like to get your fingerprinting done elsewhere. Fingerprint clearance is good for 7 years, so if you've already done this with us, you do not need to repeat at this time. We LOVE having you a part of our school day, so please get fingerprinted and TB cleared and come join the fun! School Nurse ~ Jennifer Muller will also be at orientation from 12:00 to 1:00pm to help answer health related questions and take care of any medical needs that your child may have. If your child requires emergency medication (Epi-pen, inhaler, etc. ), please be sure to see her. 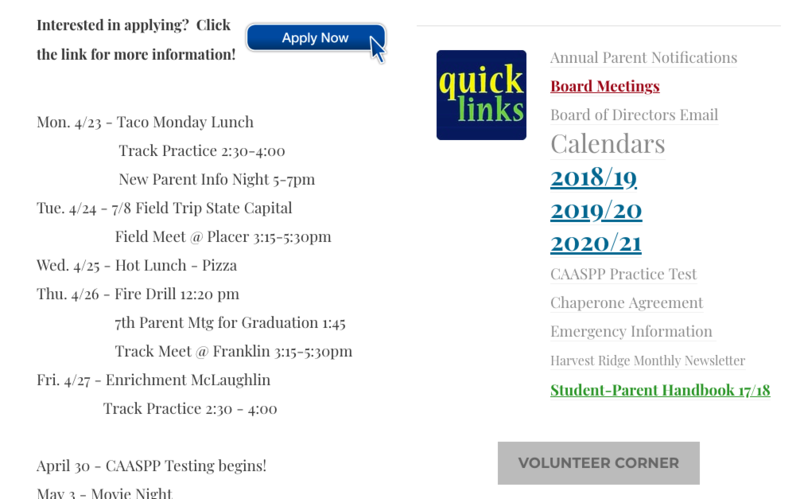 Just a reminder that if you have an incoming kindergartener, new student or seventh grader and you have not provided a shot record to the school, please bring it in at orientation. Thanks! Work Party ~ Saturday, August 13th from 8:00 - 10:00 am was a great morning! Our cooperative school is always made better by your helping hands. There are jobs to be done, so if you weren't able to make it last weekend, give us a call in the office at 259-1425 and let us know when you are available and the job you can do. 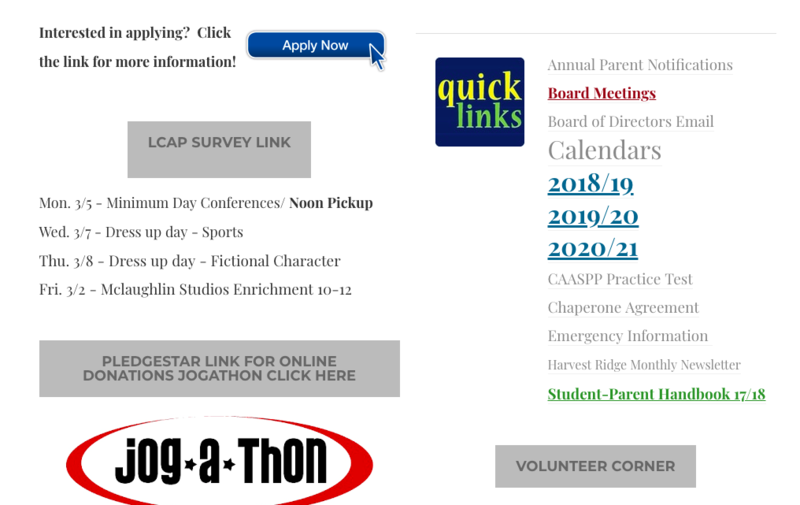 This is a great way to start your year off completing volunteer hours. *Power wash back of school and playground ~ top priority today! Fall Assessment Schedule ~ Our assessment dates for the Fall are August 18th, 22nd, 23rd & 24th. Please sign up for an assessment time for your child(ren) using Sign Up Genius by clicking HERE. All students will be coming in to meet with their teacher prior to site classes starting on August 29th. Please take a minute to schedule your child's assessment today. Click on the class below to access your child's list of supplies.